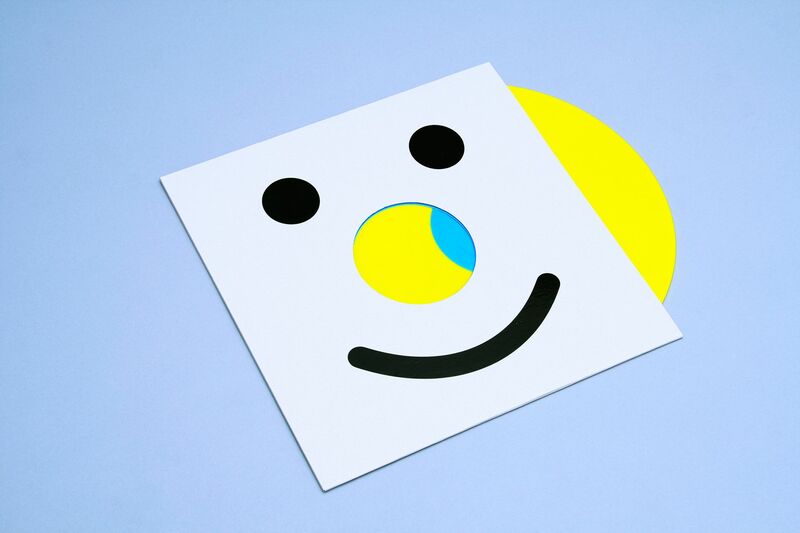 Artwork for Dutch indie rock band Face Tomorrow’s acoustic LP ‘Move On’. 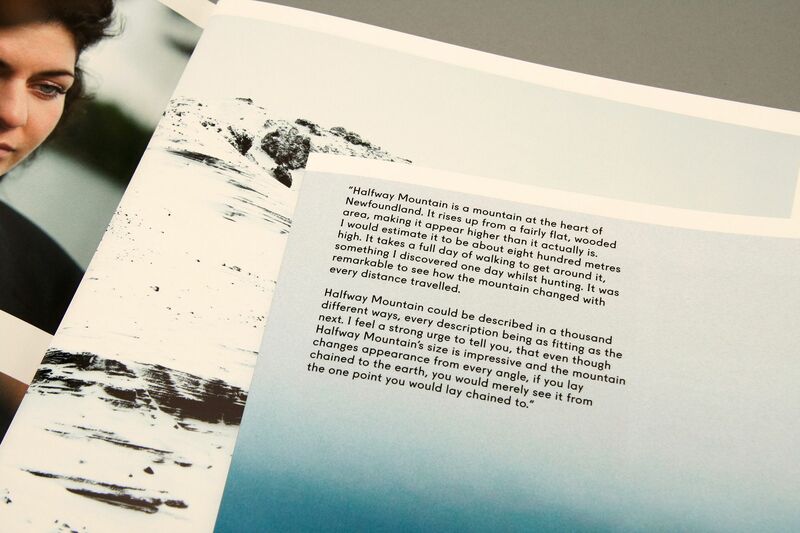 This is their goodbye LP as a band. 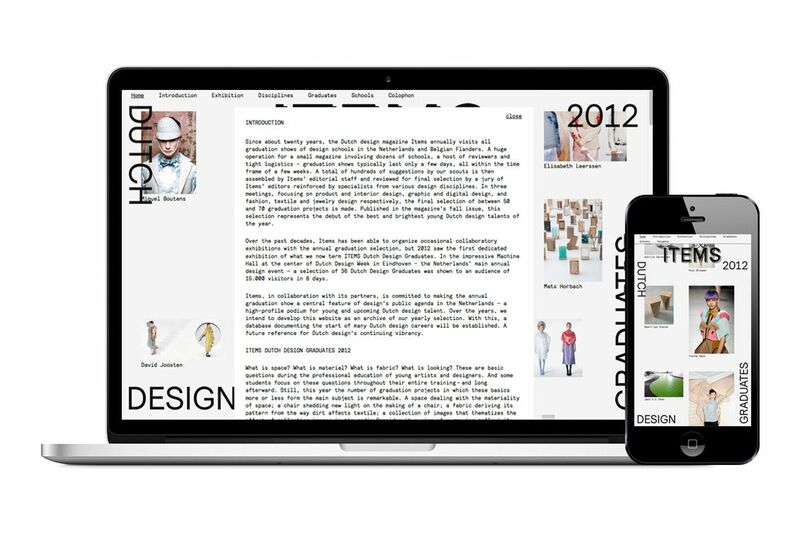 The mixed emotions about the ending of an era are the base of the design. 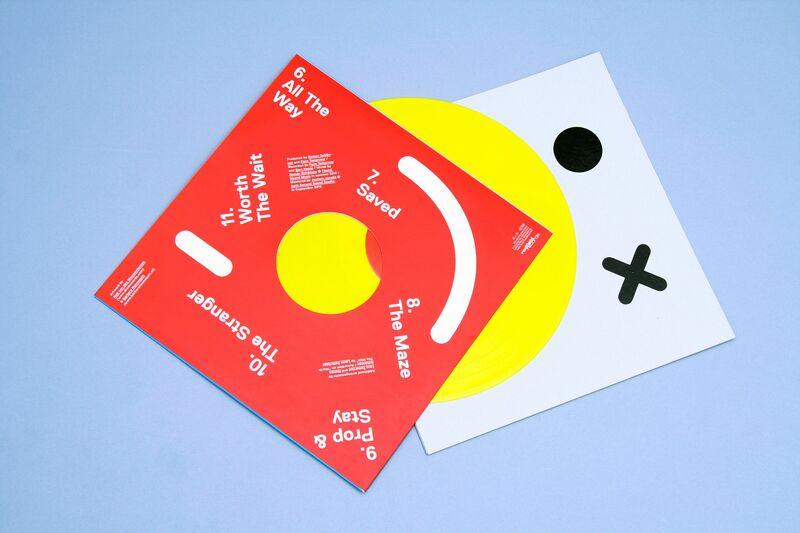 The punch holes on the outer and inner sleeve reveal the vinyl’s A (blue–happy) and B (red–sad) label on smiley-bright-yellow vinyl. 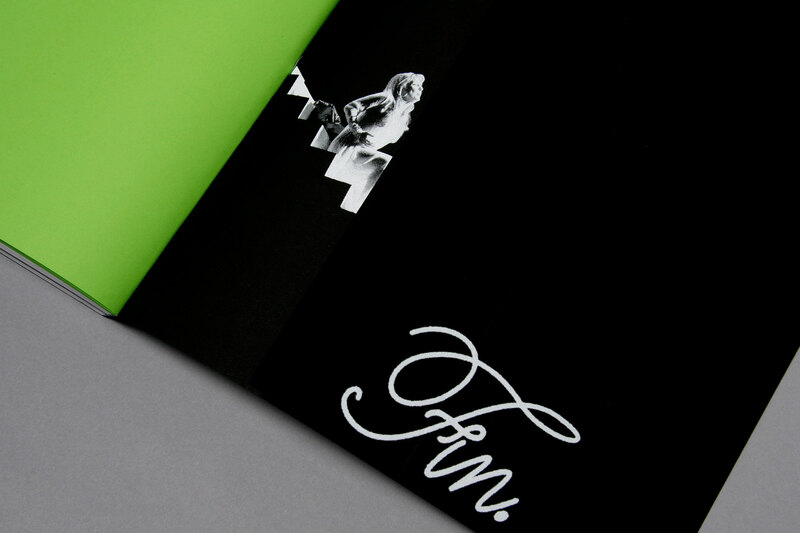 The glossy black stickers on the front and back cover were hand-stickered. 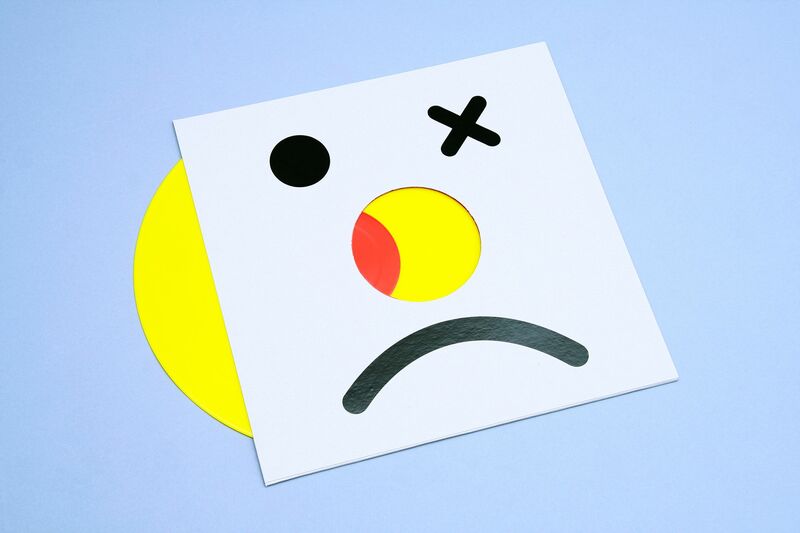 Because of the possible combinations with the eyes (circle, cross or dash) and mouths (happy, sad or a curvy undecided one) the artwork is different on every LP. 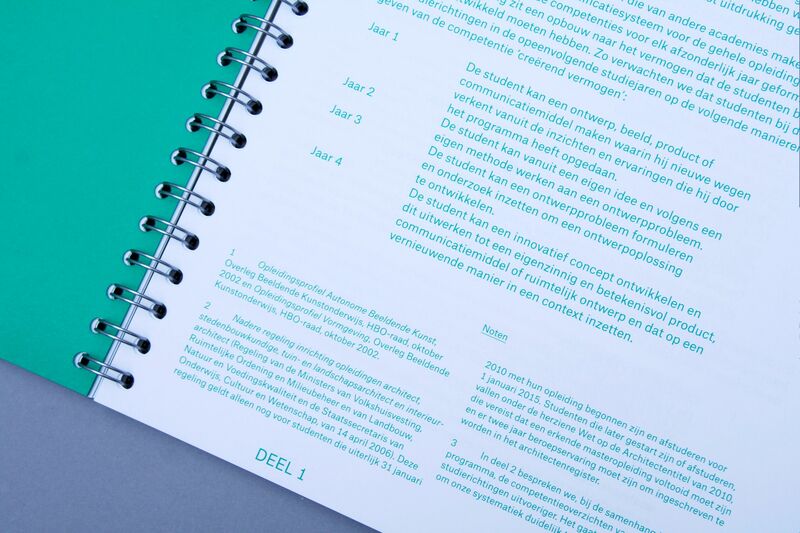 Design in collaboration with Rob van den Nieuwenhuizen. 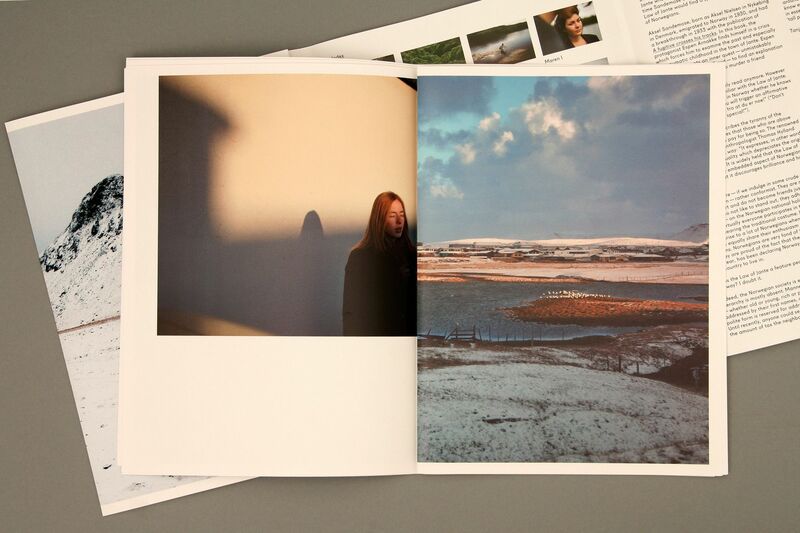 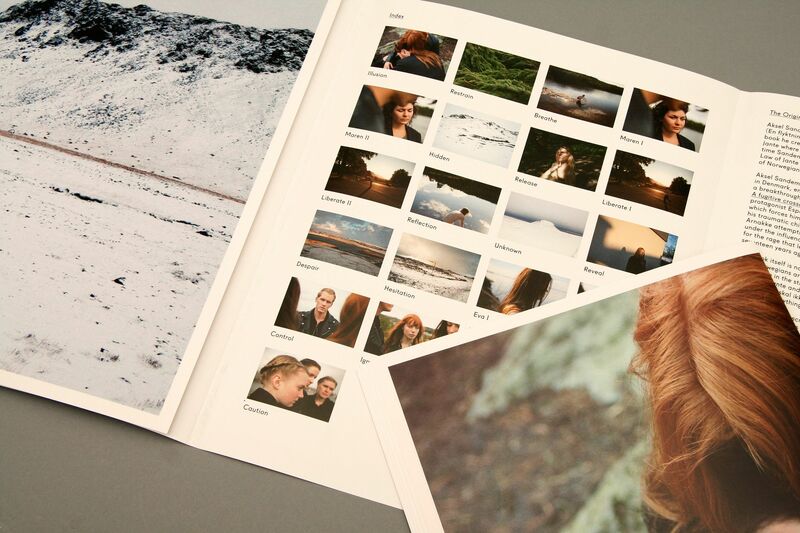 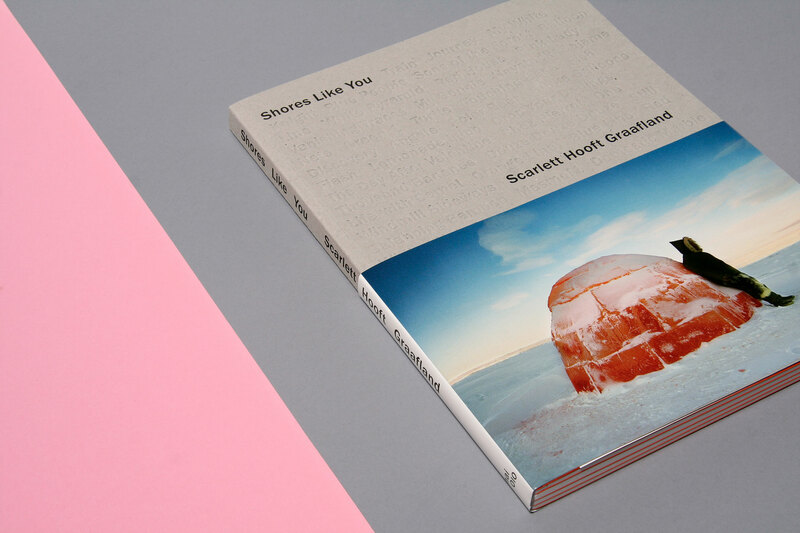 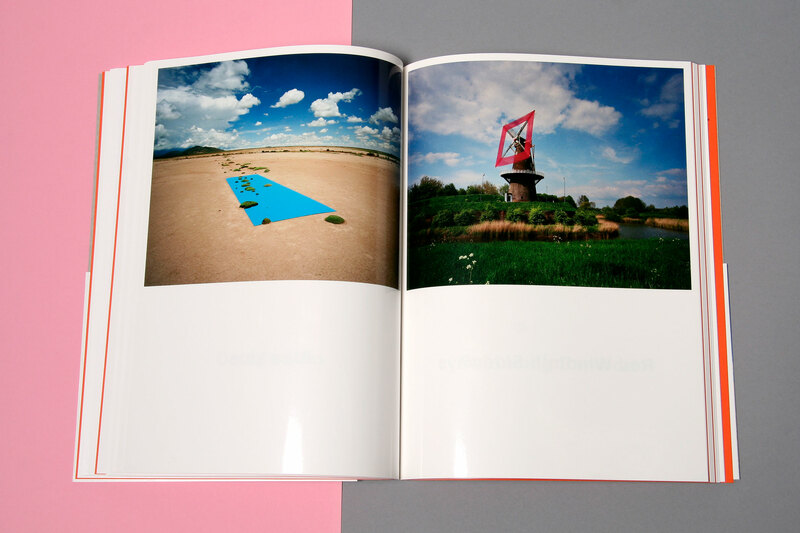 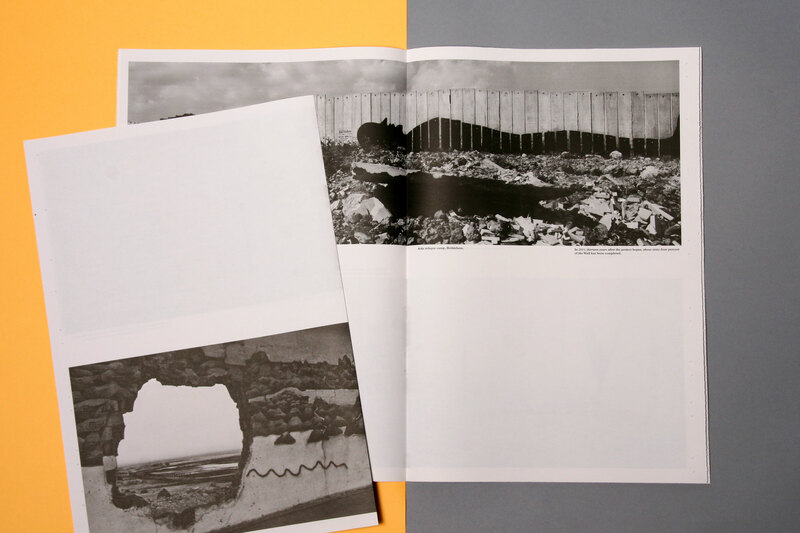 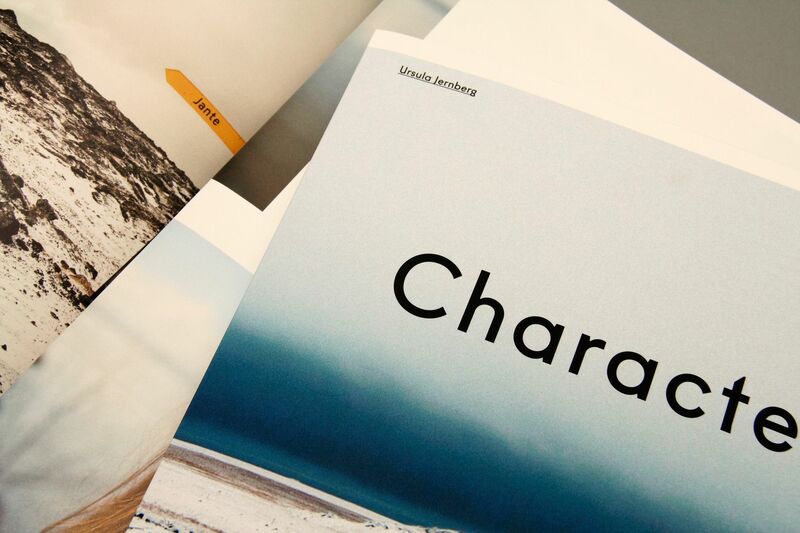 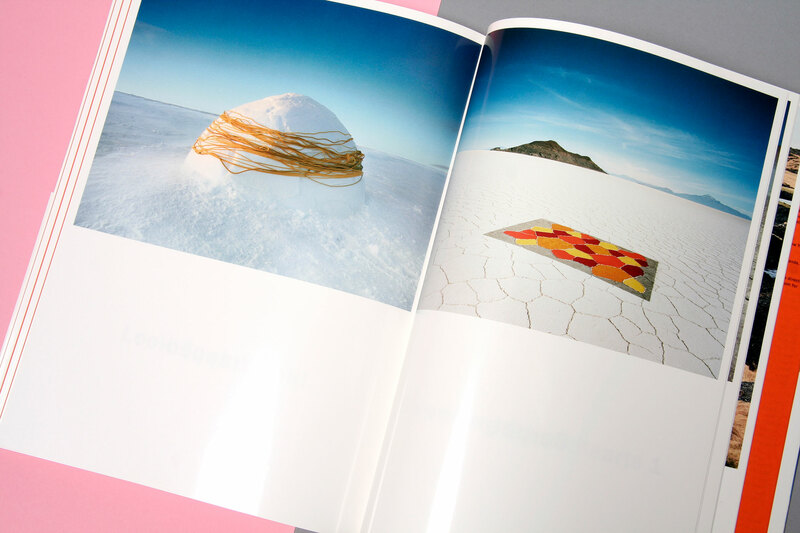 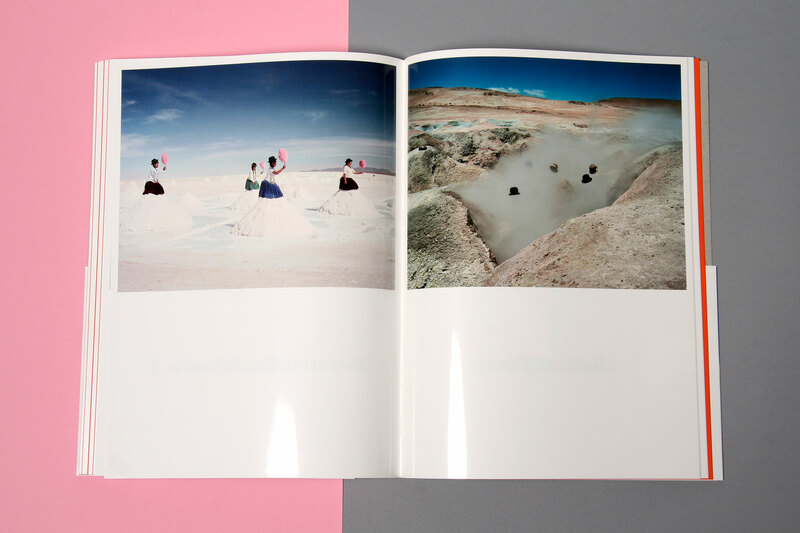 Book design 'Shores Like You' for Dutch photographer Scarlett Hooft Graafland. 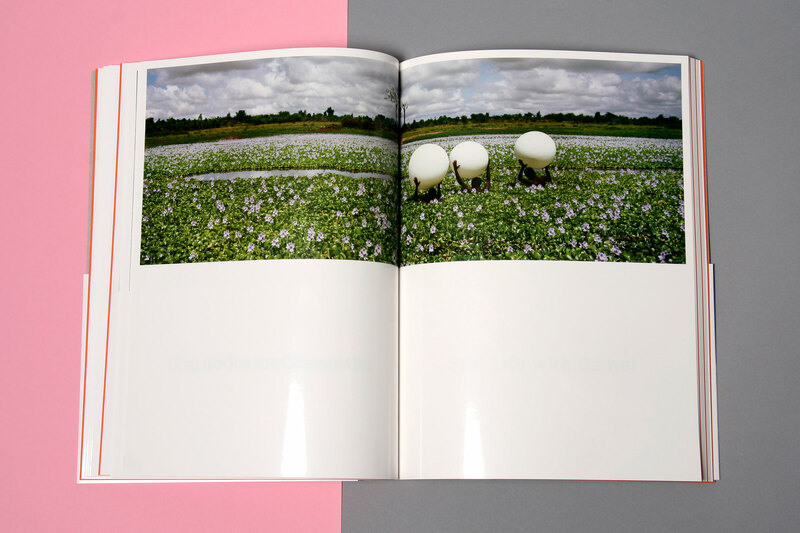 There are two distinctive storylines to be found in this book: the first follows the images of Hooft Graafland's oeuvre, the second storyline is formed on every other spread by the combinations formed by the titles of the individual works. 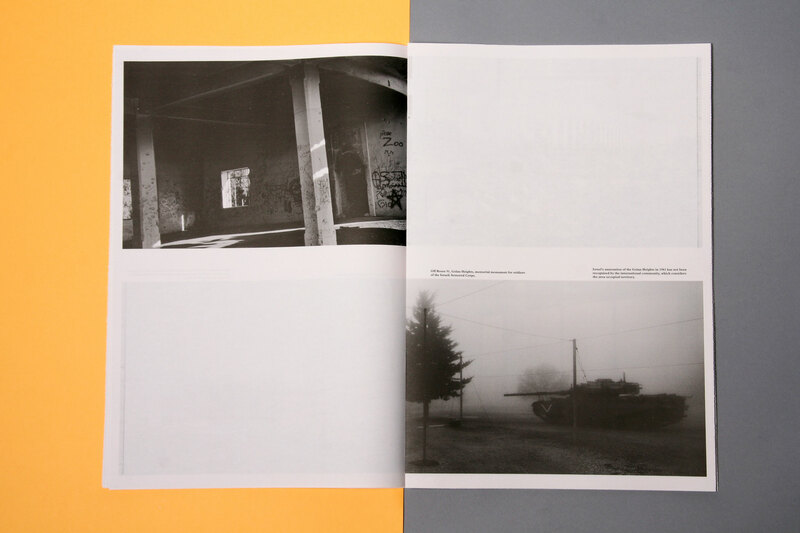 The static quality of the paper that is used in the book helps distinguish these two narratives. 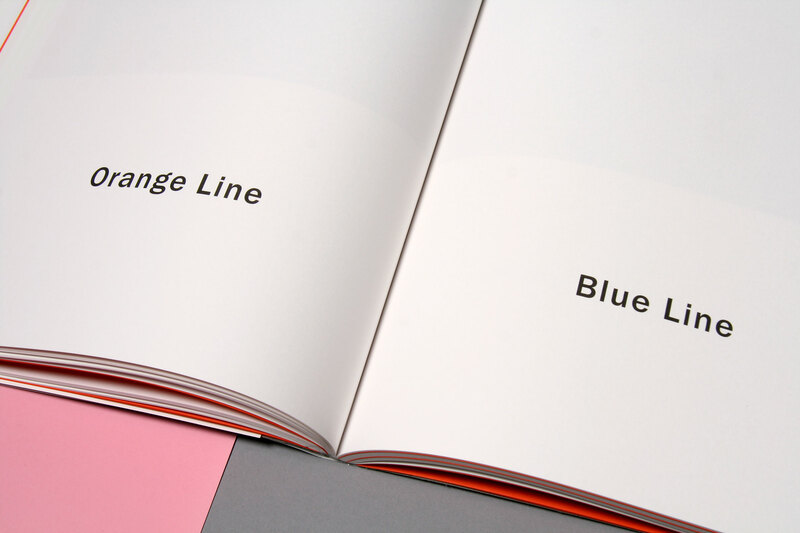 The orange signatures provide the book with structure and underlines its own particular rhythm. 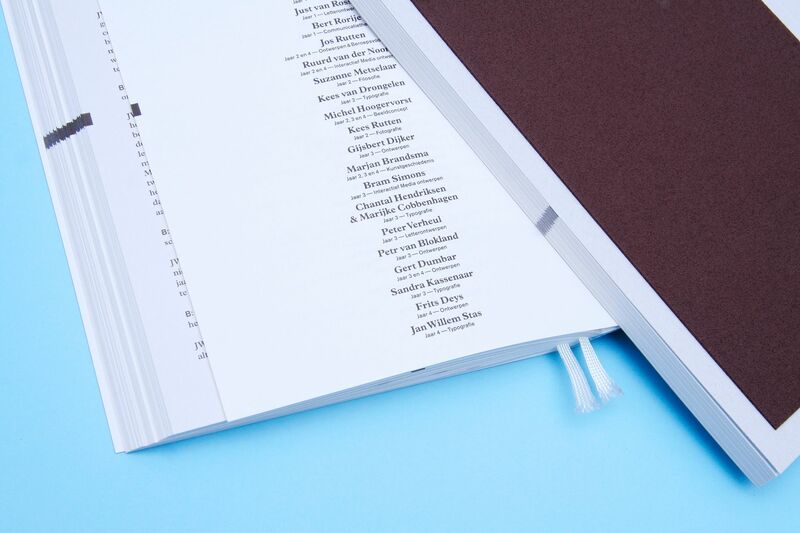 Design in collab­oration with Irma Boom. 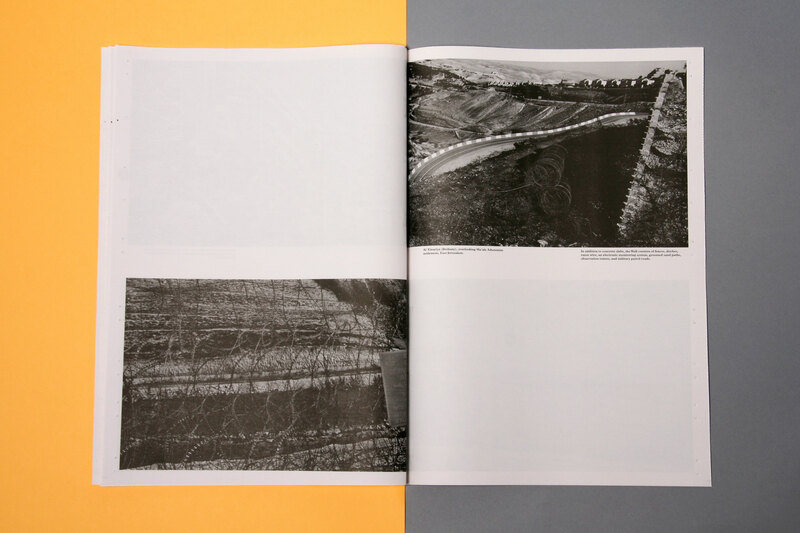 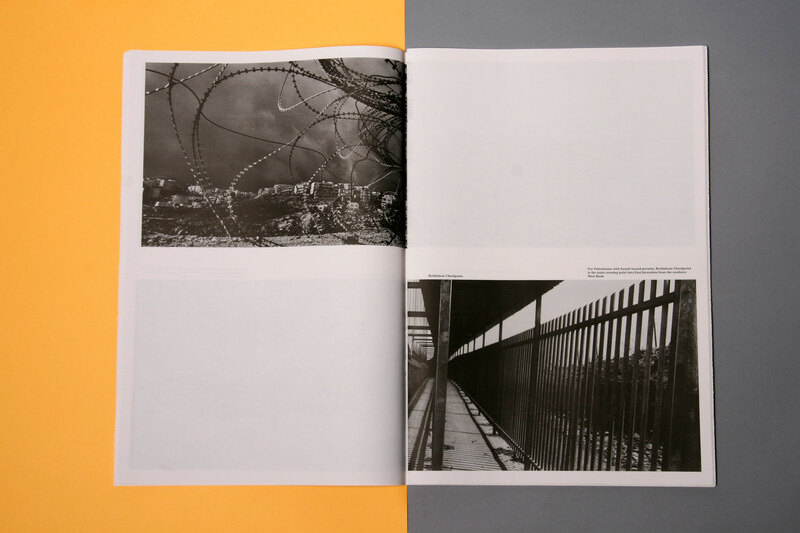 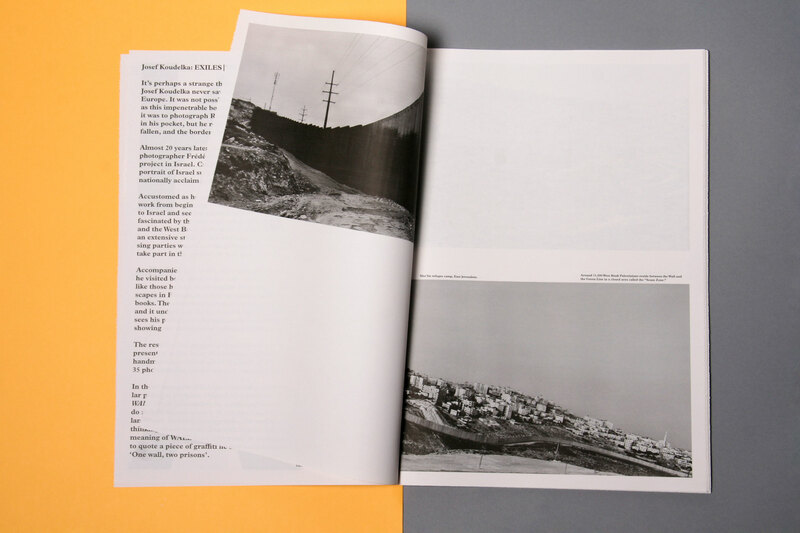 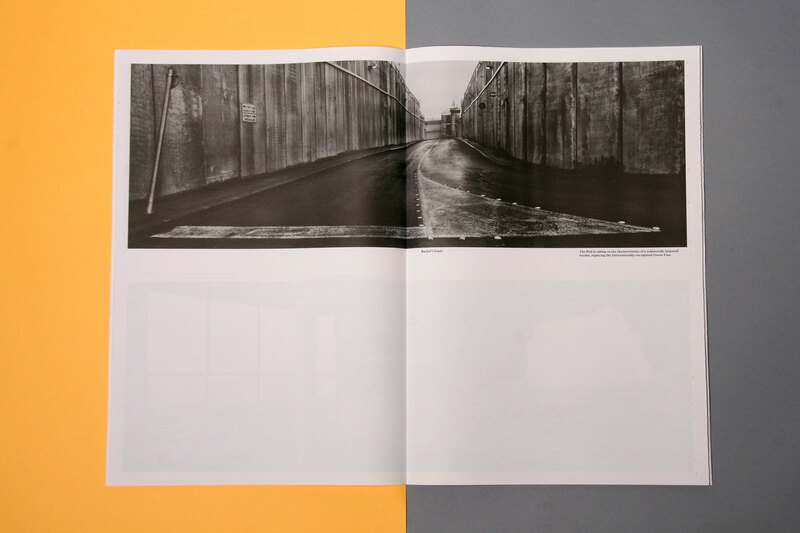 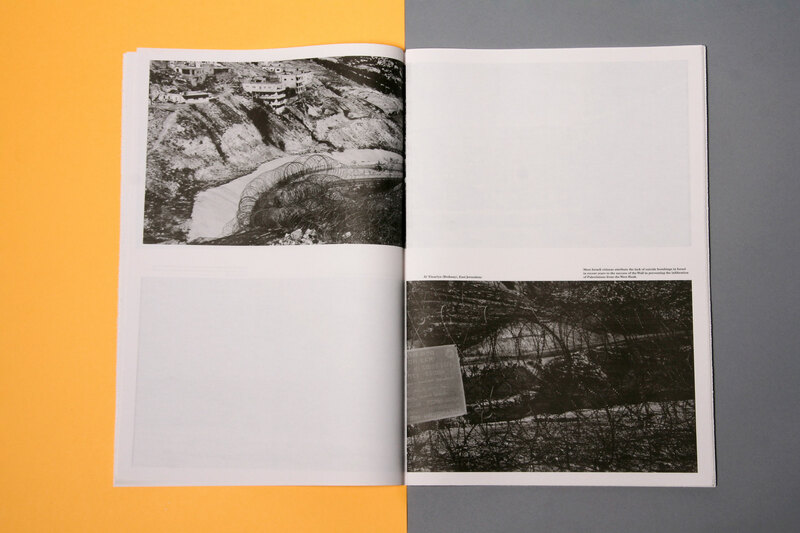 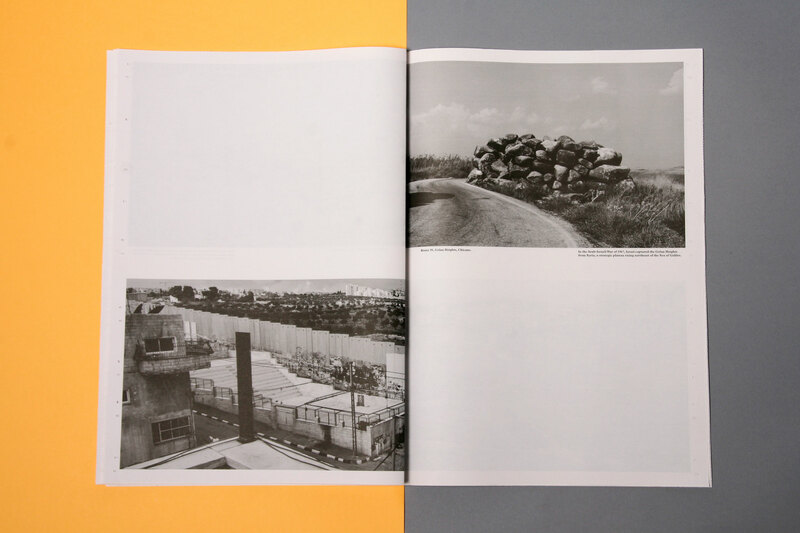 This publication features a new selection of Josef Koudelka's panorama series 'WALL', and is published by Fotomuseum Rotterdam. 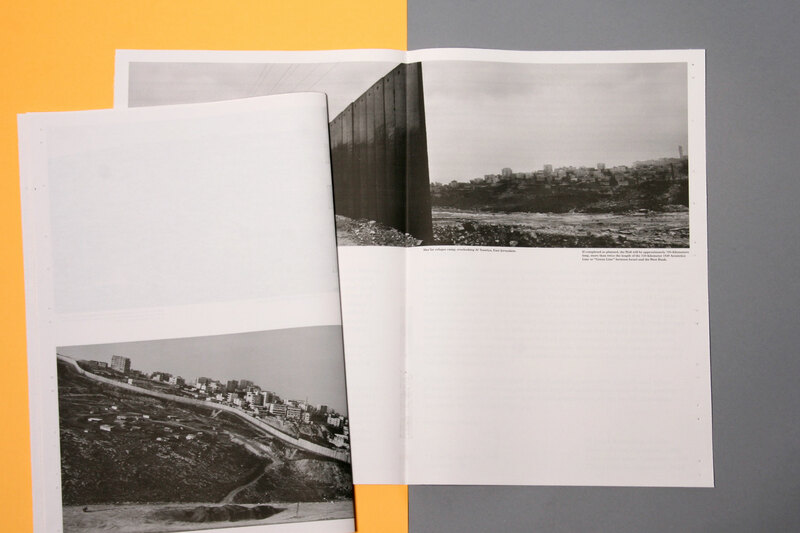 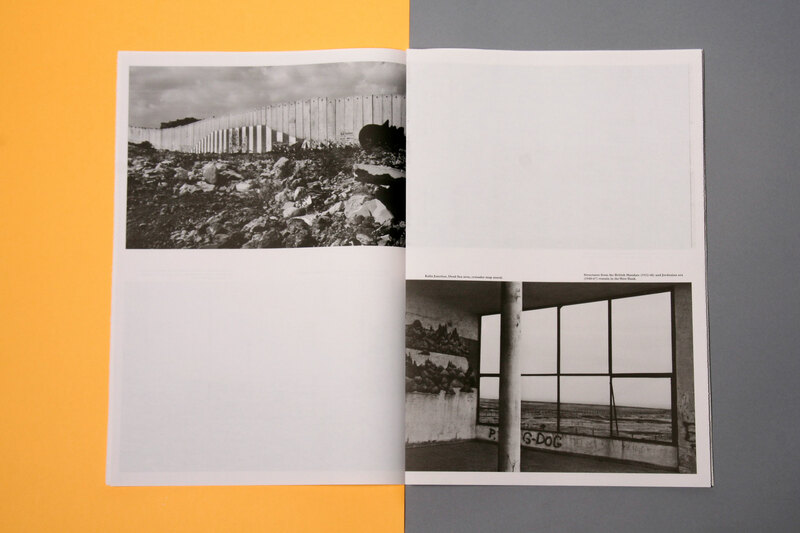 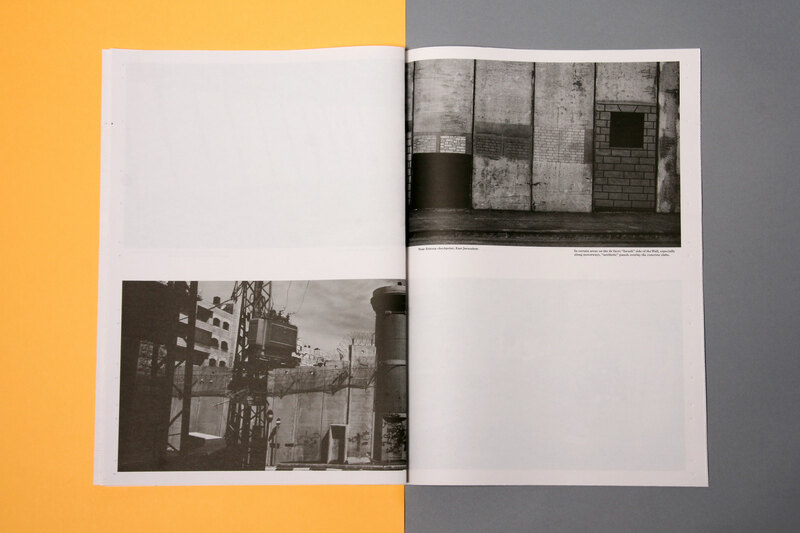 The series captures the impact of the wall between Israel and the West Bank on the landscape. 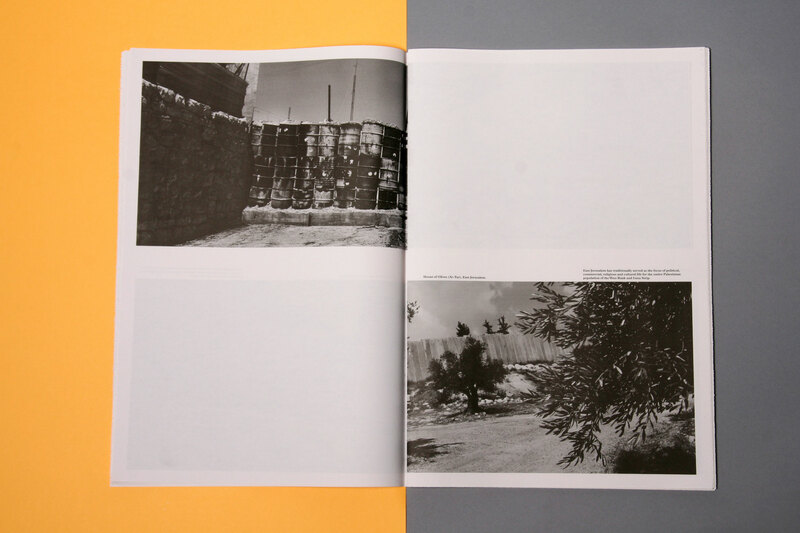 In the design this division is underscored by the placement of images over the entire spread including the fold. 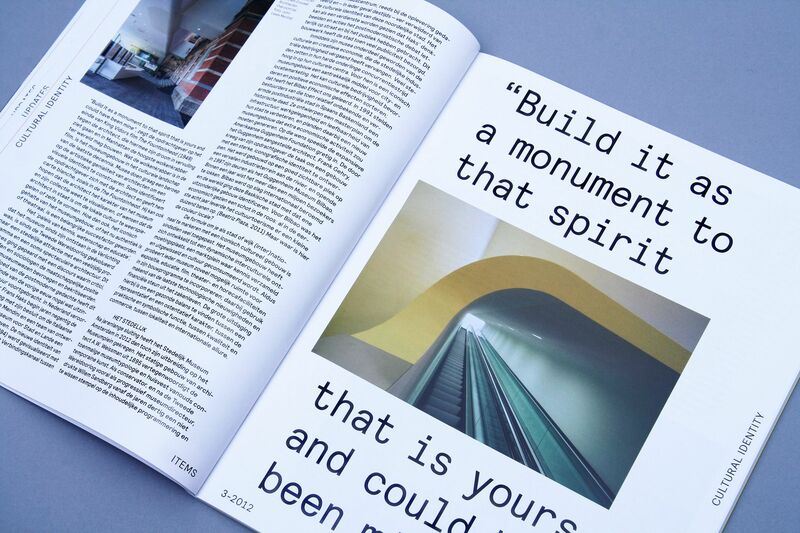 Unbound, it is printed on newspaper paper for its continuing newsworthiness. 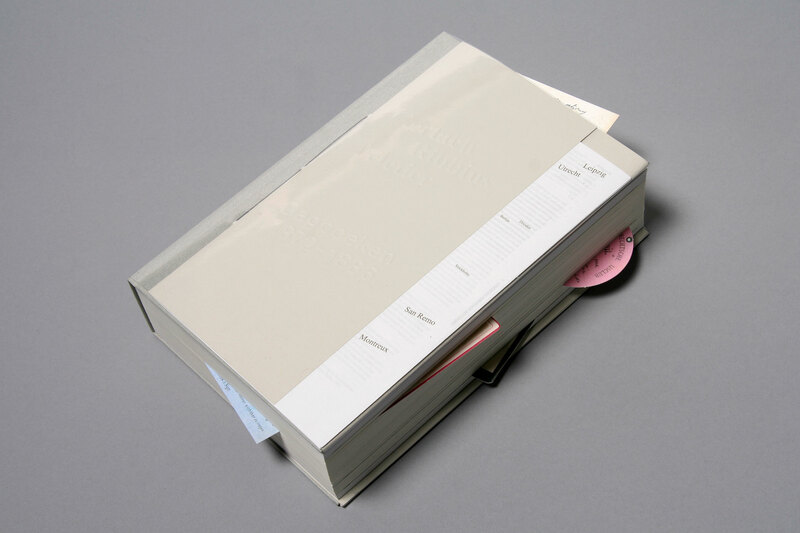 Design in collab­oration with Irma Boom. 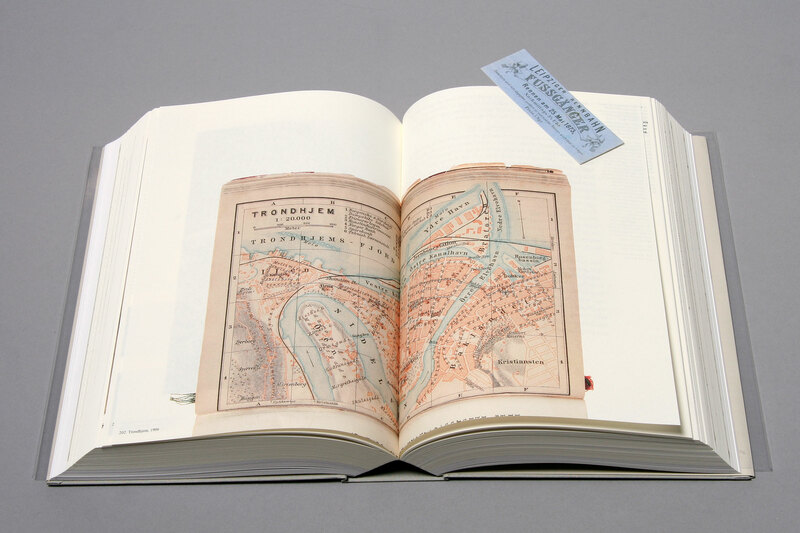 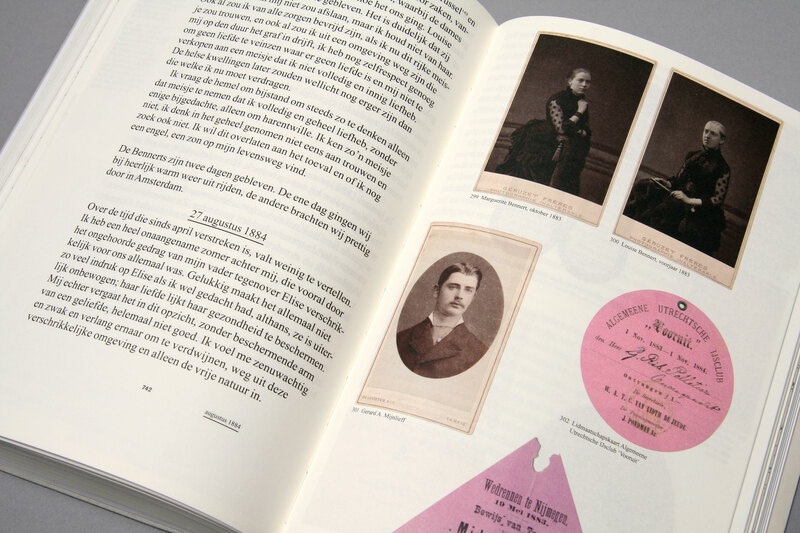 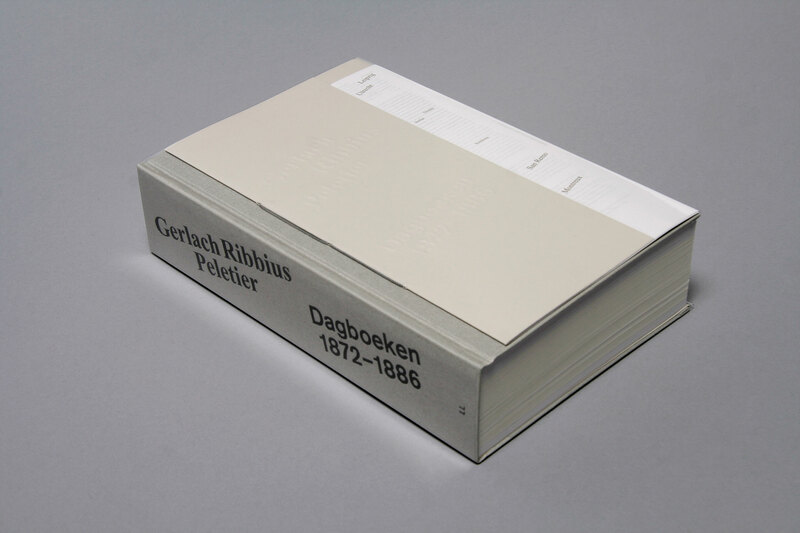 'Gerlach Ribbius Peletier, Dagboeken 1872–1886' is a story of travel through Europe by a young Dutchman, escaping family expectations in search of a fulfilling life. 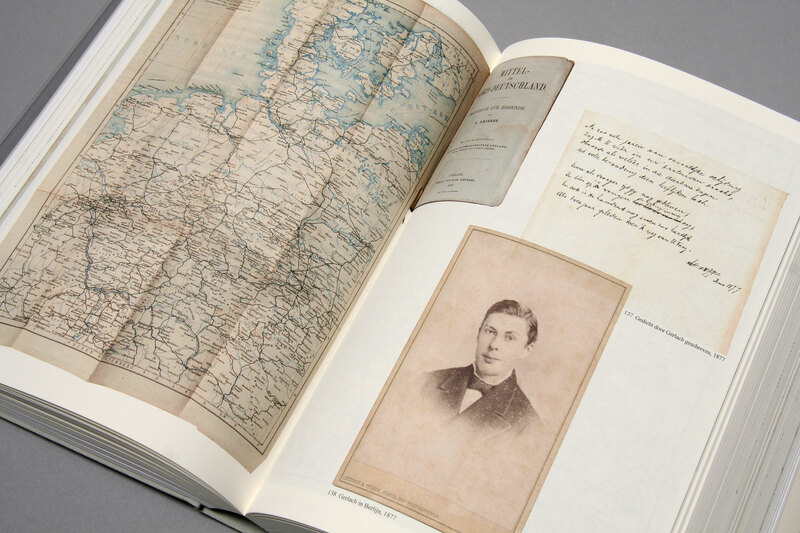 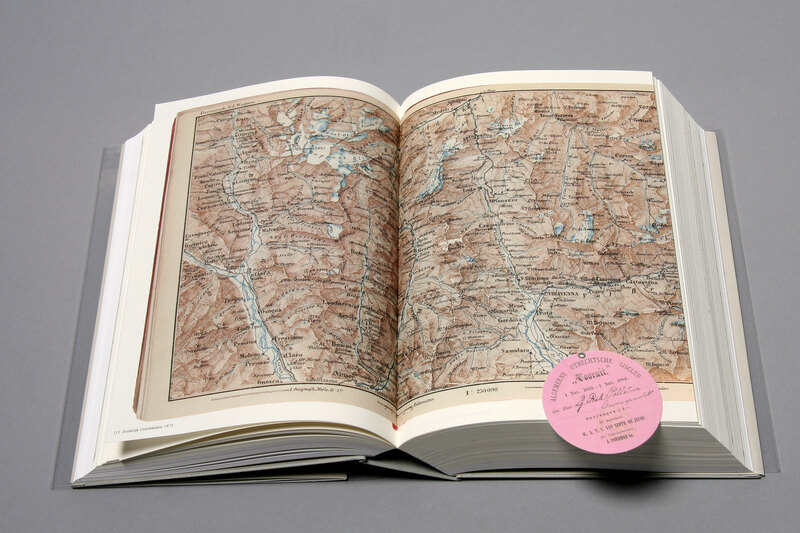 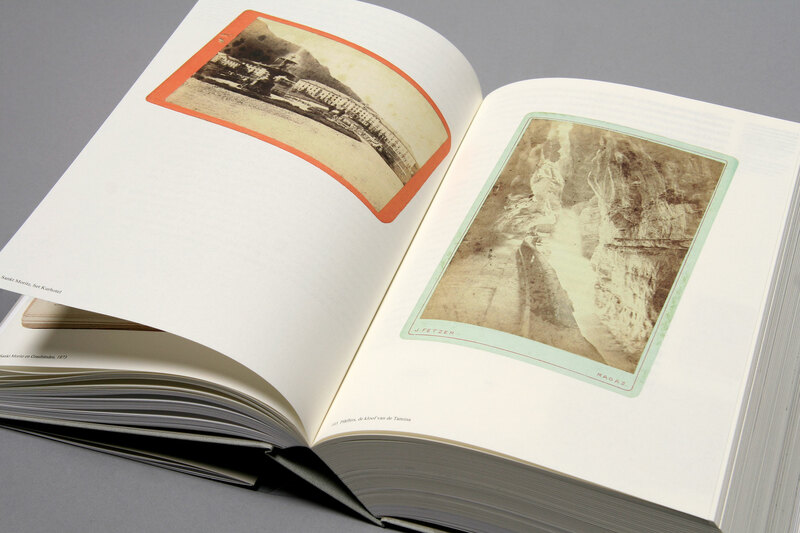 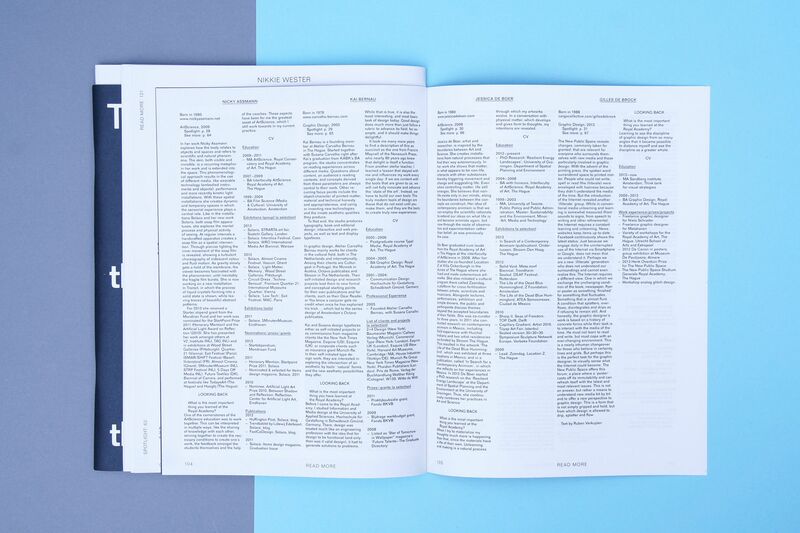 With its 892 pages, the book includes images of the original – in German shorthand-coded – diaries and is richly illustrated with archive materials inviting you into this personal odyssey. 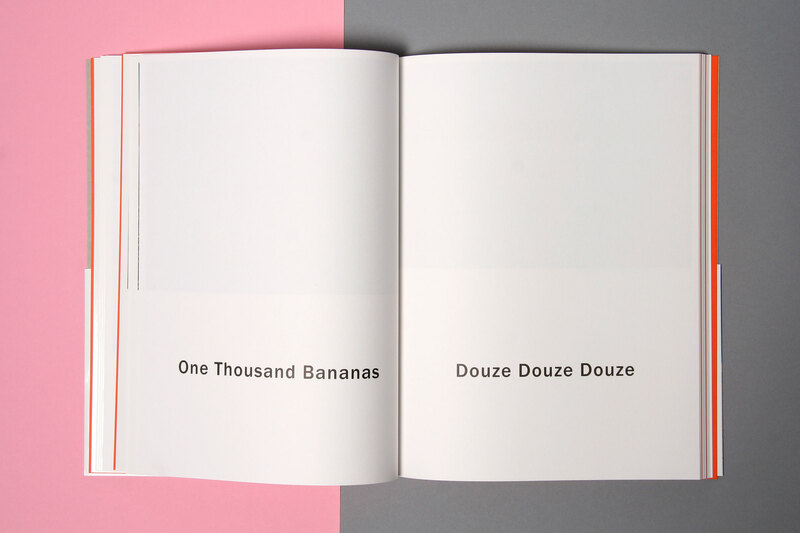 Design in collab­oration with Irma Boom. 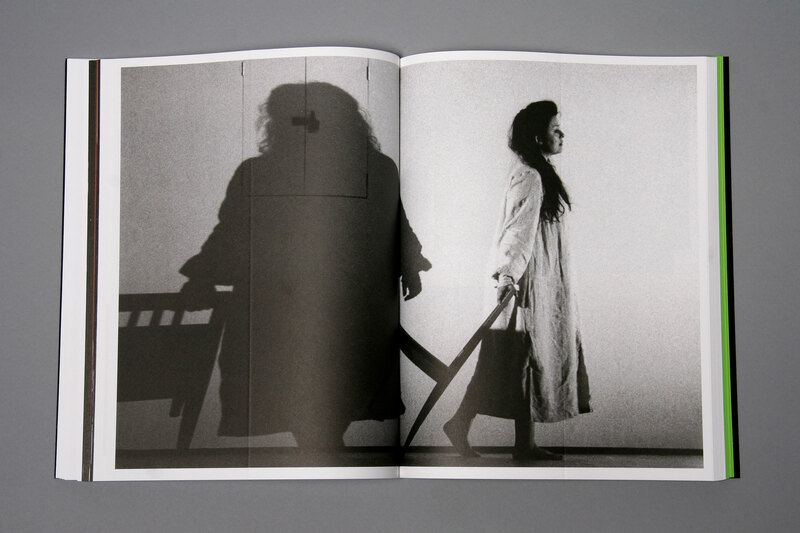 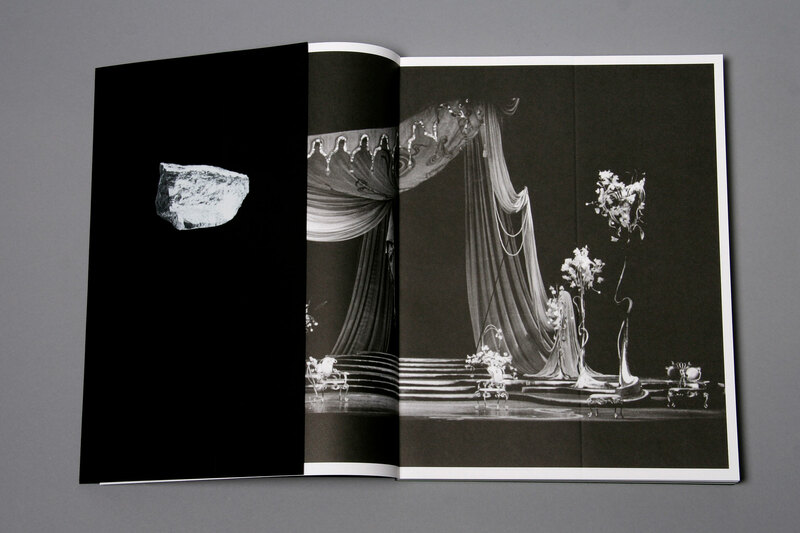 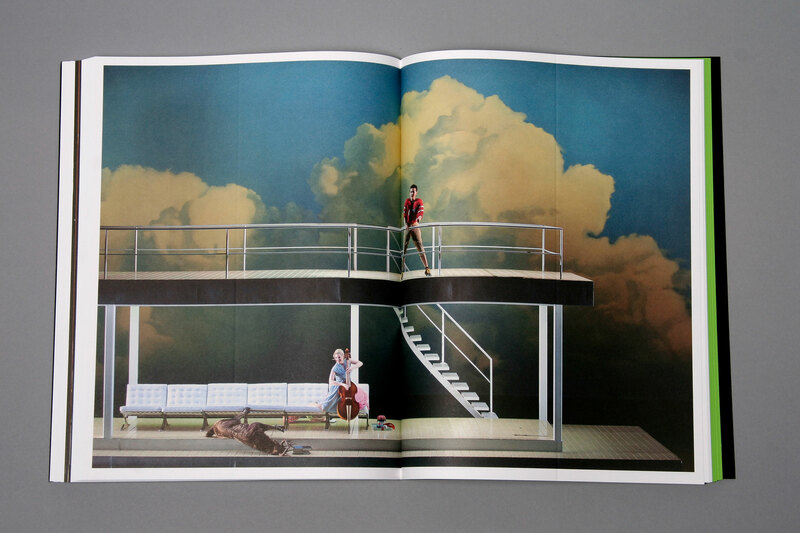 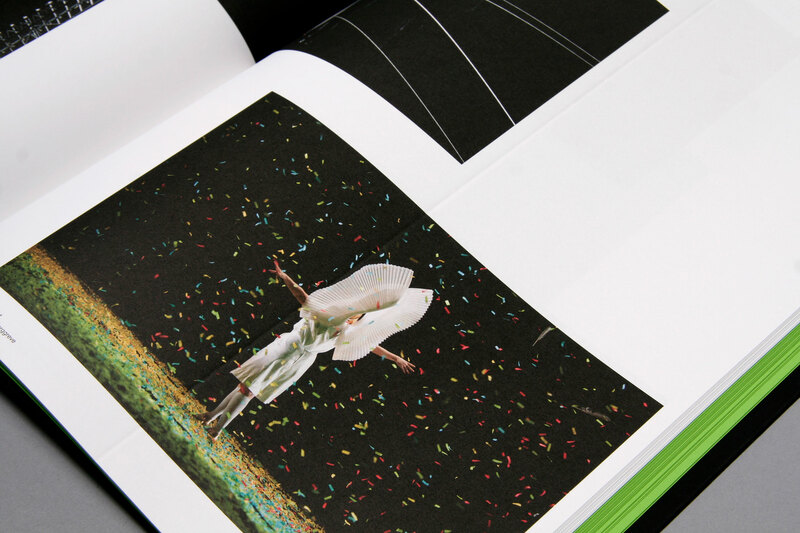 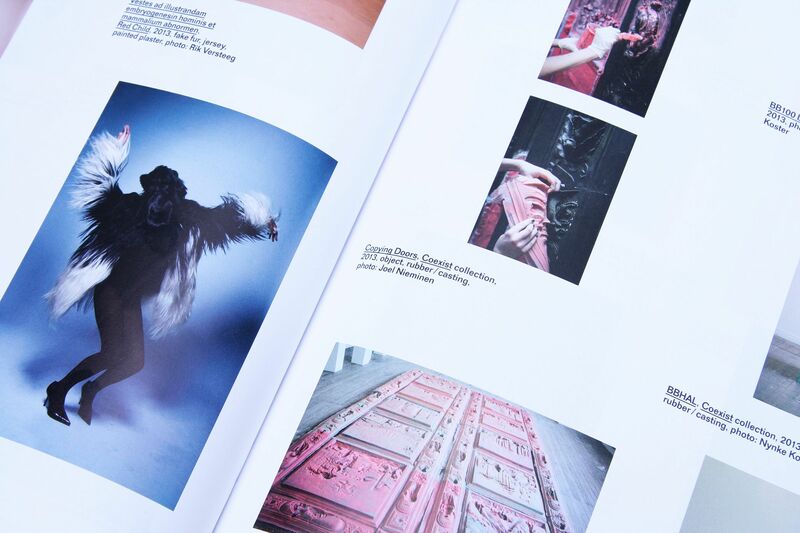 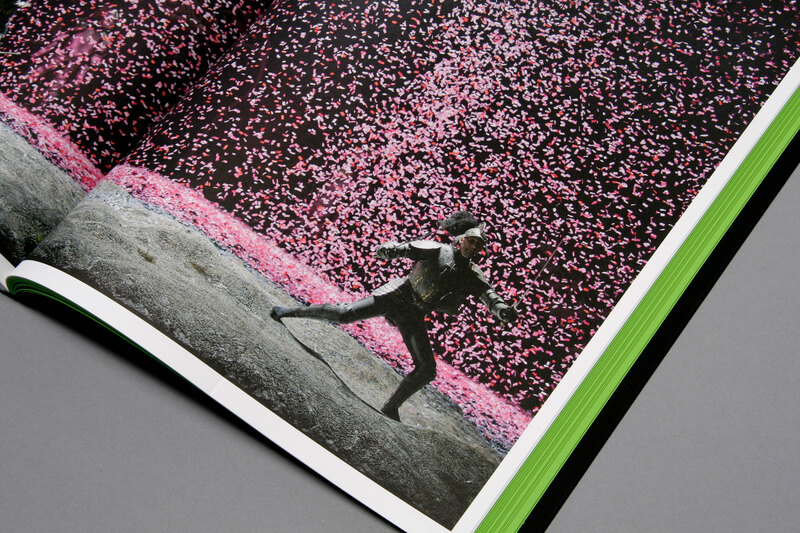 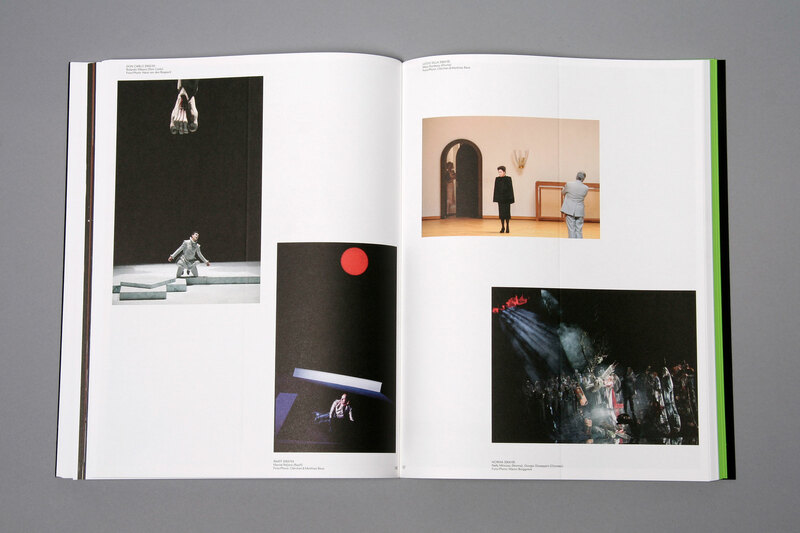 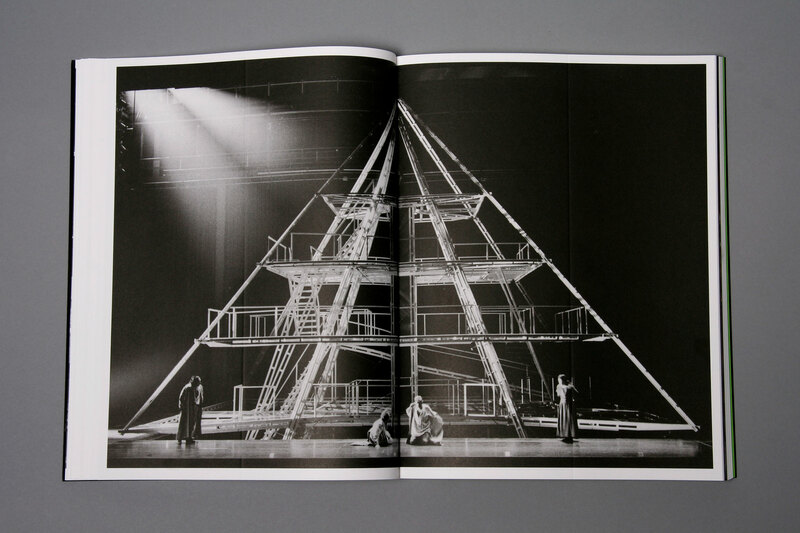 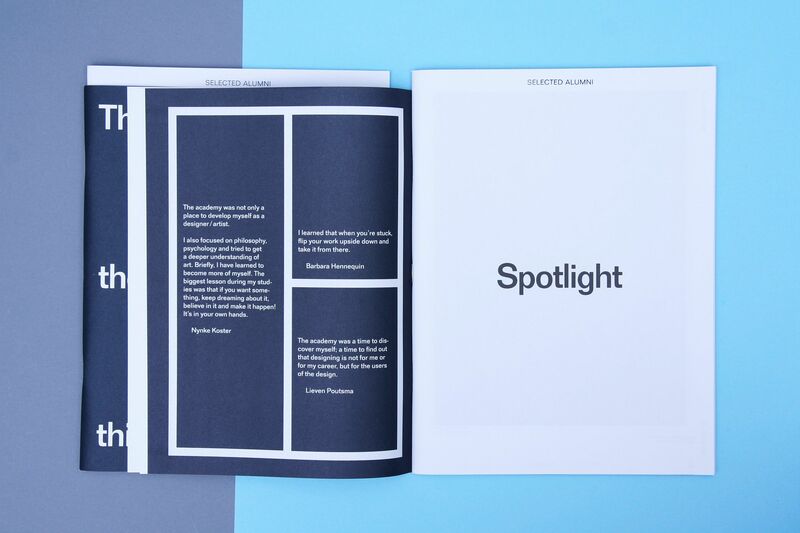 This book celebrates the 50 year anniversary of the Dutch National Opera. 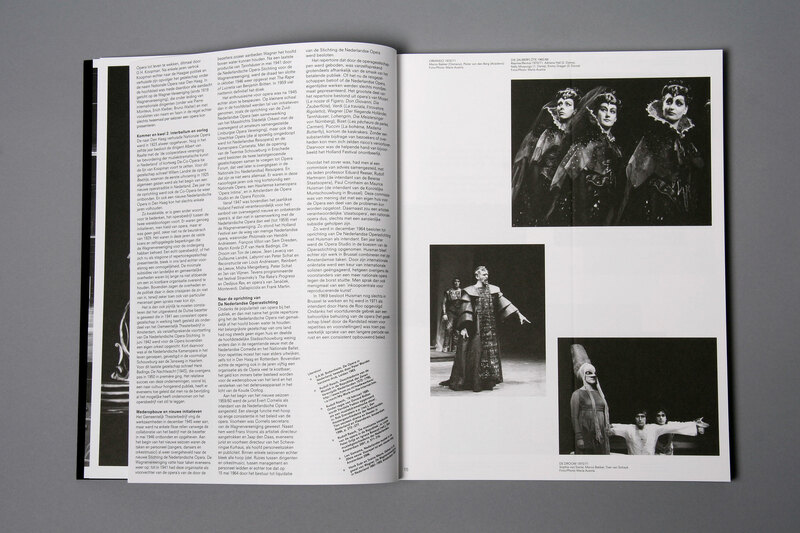 Plentiful images from the archives and essays show a chronological journey of opera productions through the years. 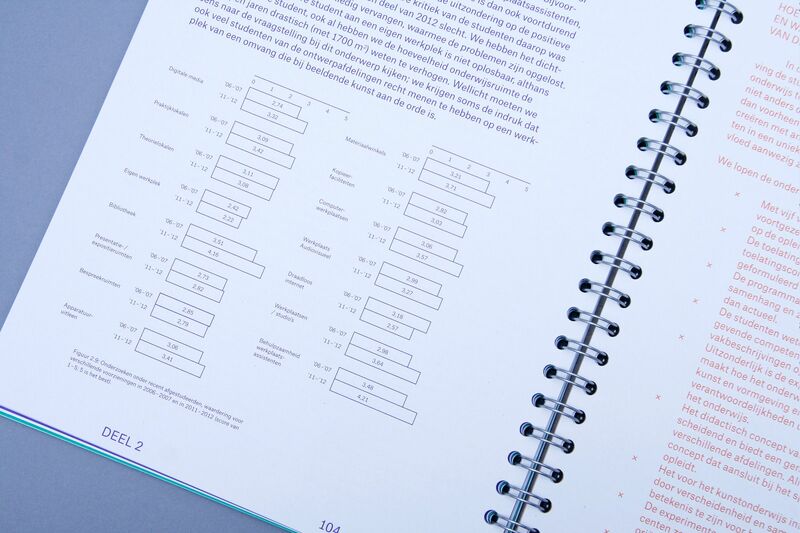 Through the entire book runs an embossed fault line at a set distance referring the typical backstage set system distances. 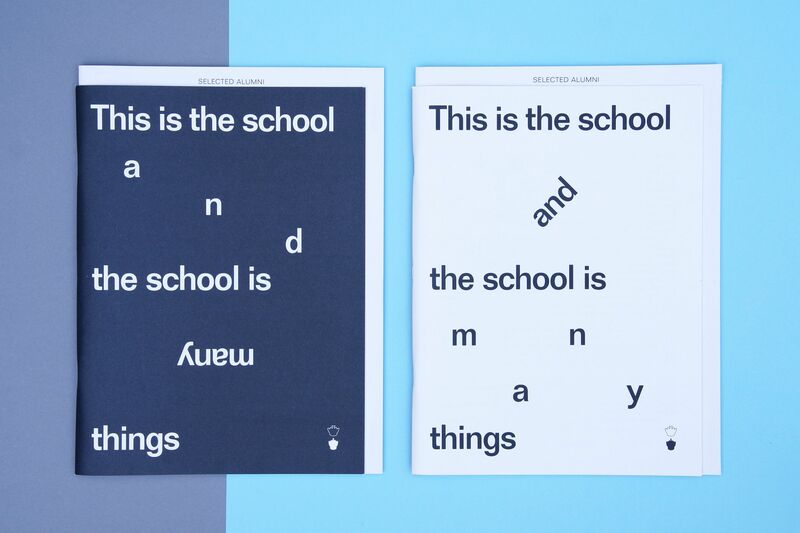 Design in collab­oration with Irma Boom. 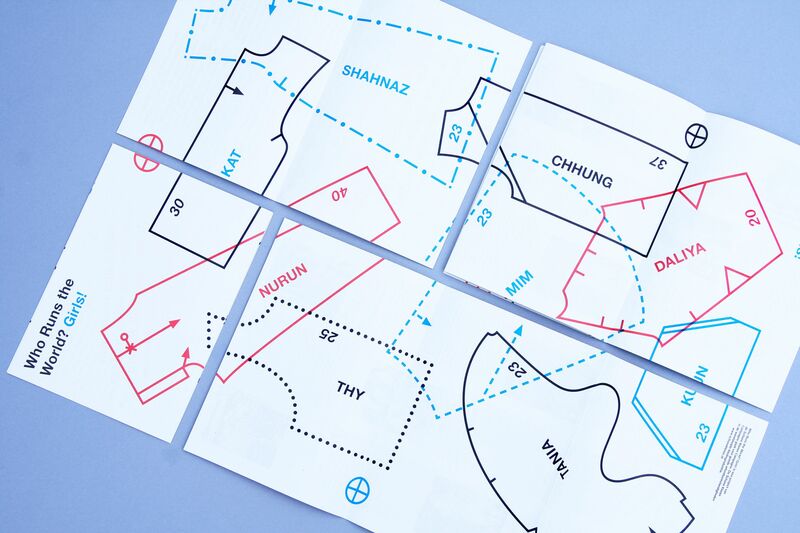 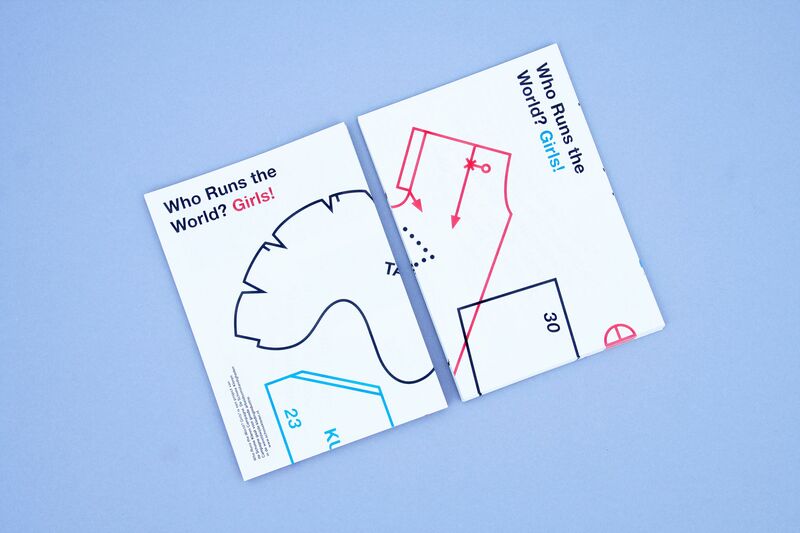 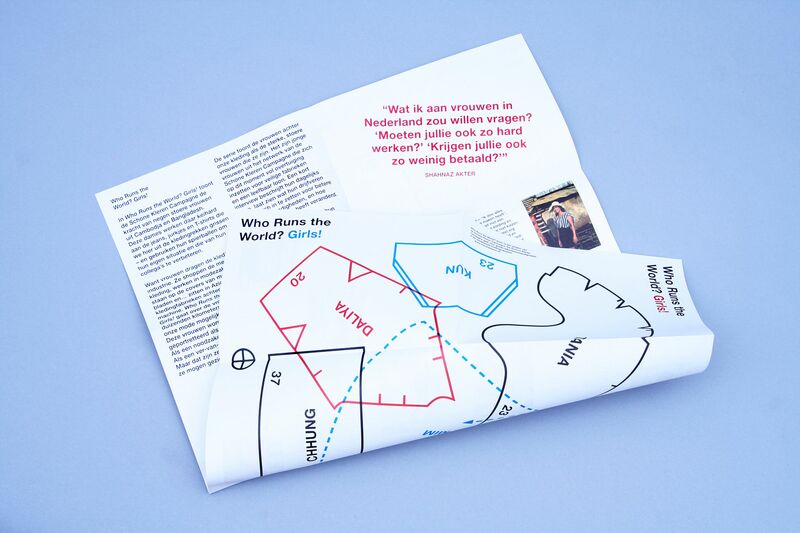 Print work and visual identity for the photo exhibition 'Who Runs the World?  Girls!' 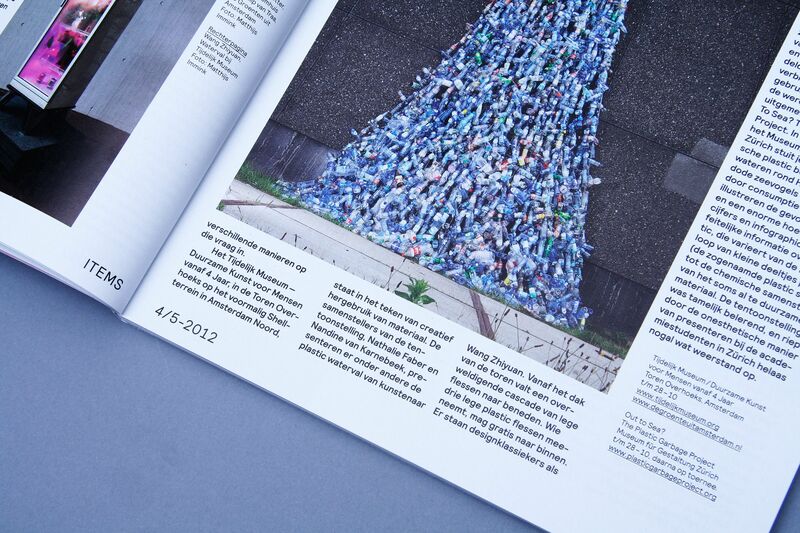 for Schone Kleren Campagne (Clean Clothes Campaign). 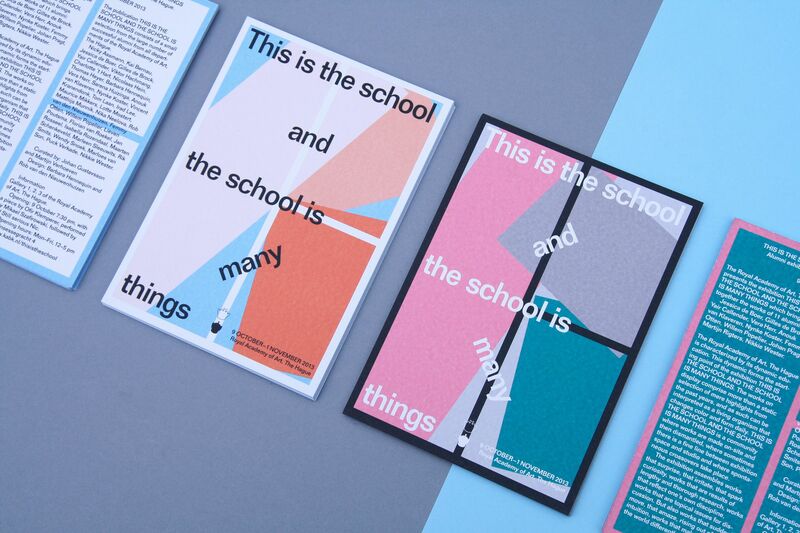 Publication and exhibition design for the alumni exhibition 'This is the school and the school is many things' at the Royal Academy of Art (KABK) in The Hague, featuring work of a selection of alumni of the last six years. 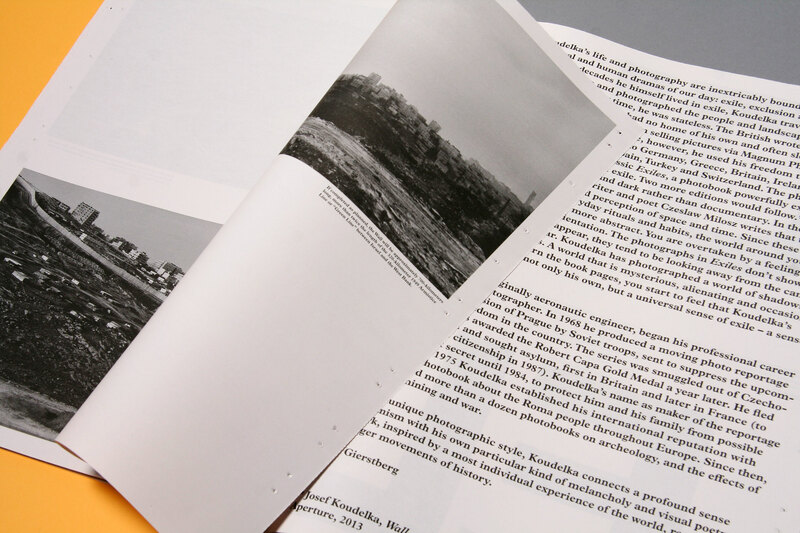 The publi­cation is structurally build up in the way one would visit an exhibition: first one reads the introductory text, then browses through the exhibition for the works that speak to them (Spot­light), look at more work from those artists (See More) and if hungry for more information reads up on their work and background (Read More). 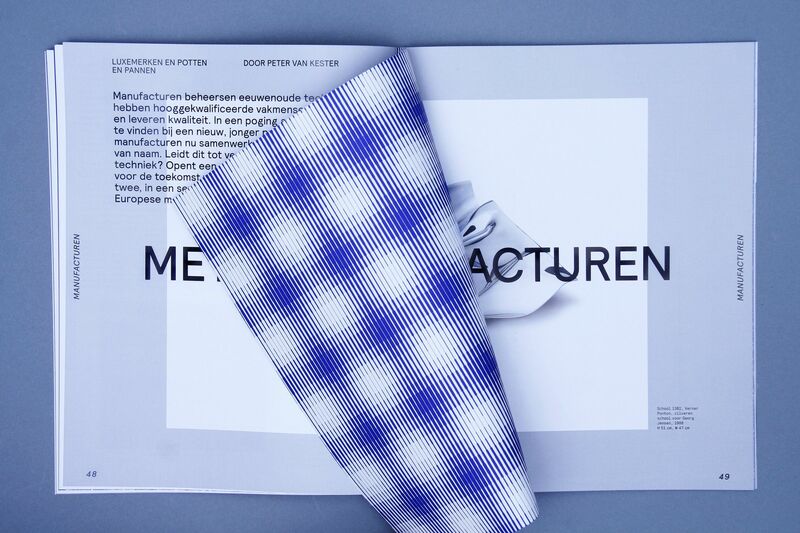 Design in collaboration with Rob van den Nieuwenhuizen. 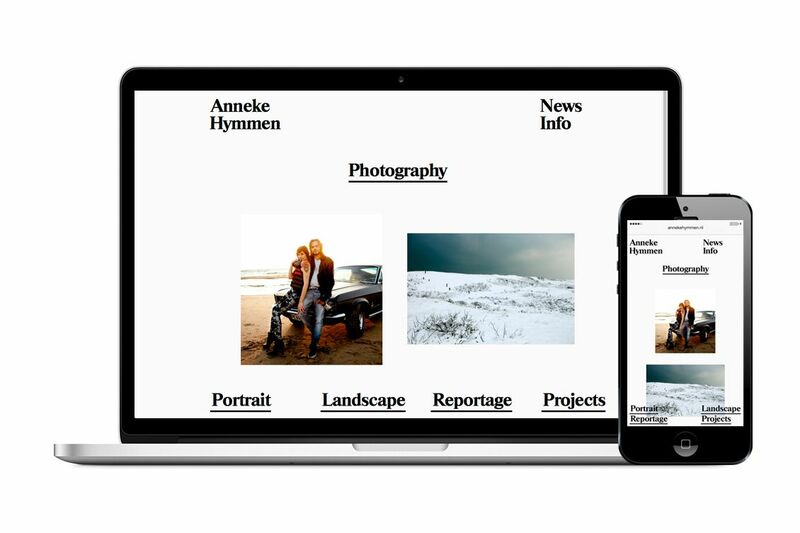 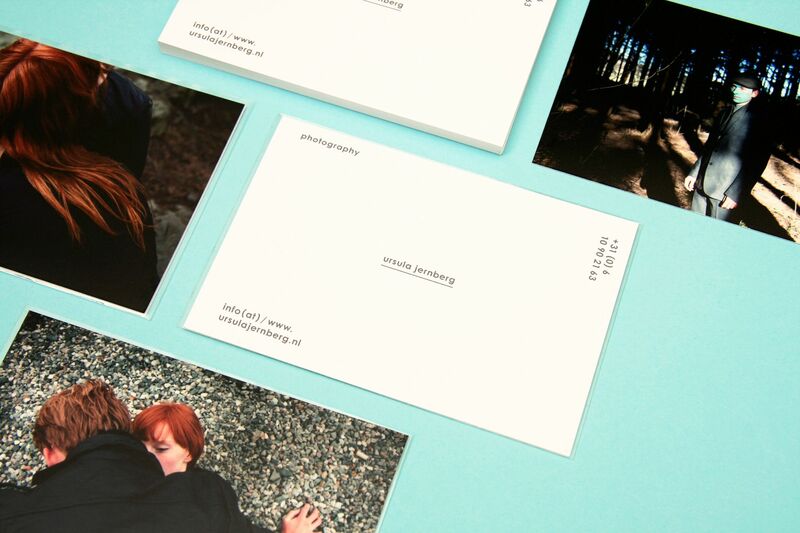 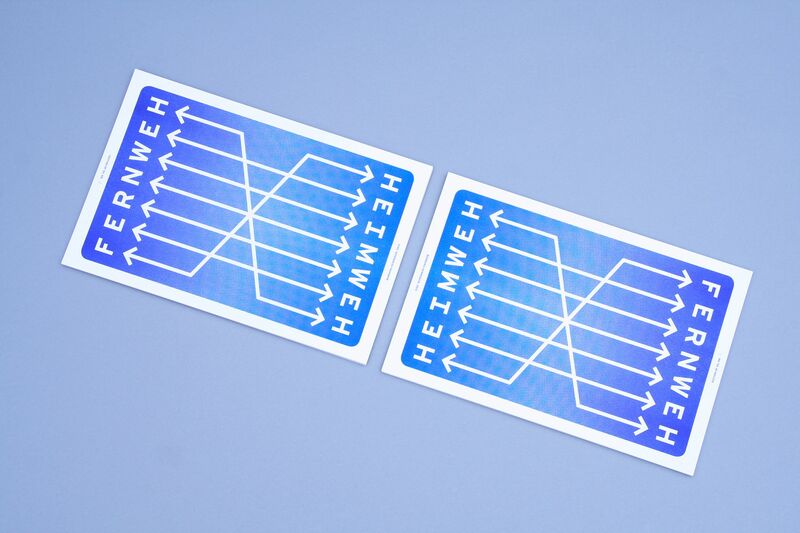 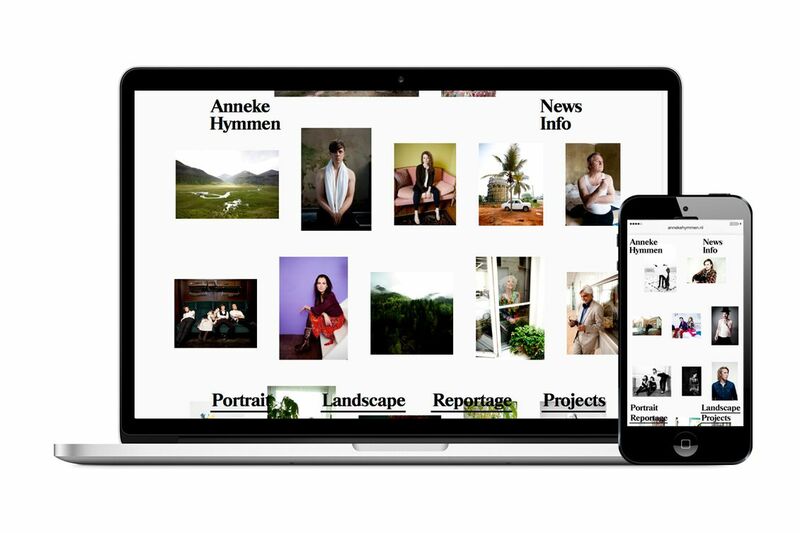 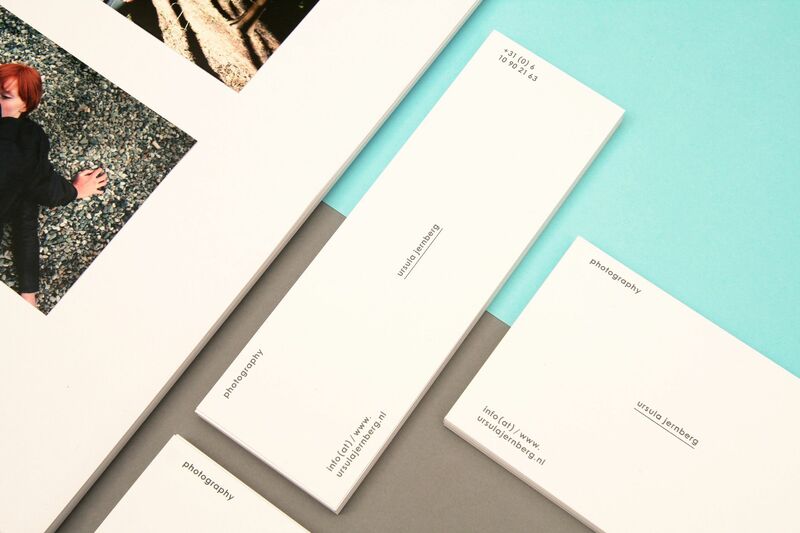 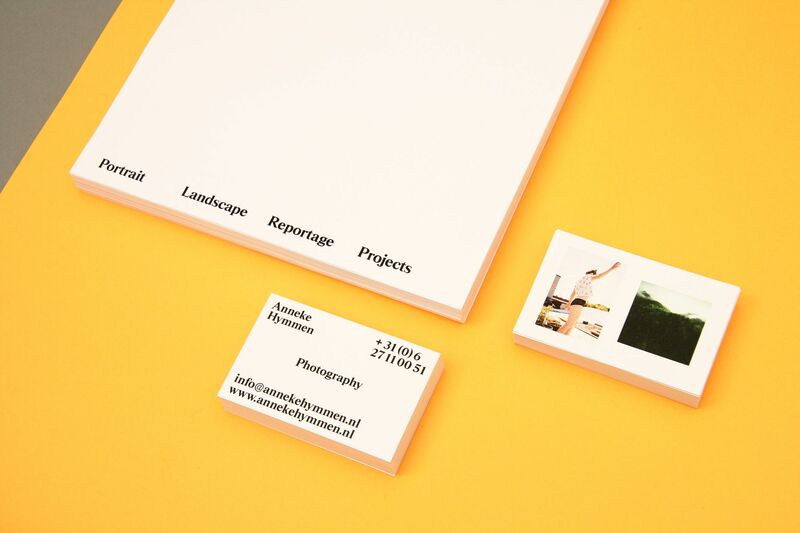 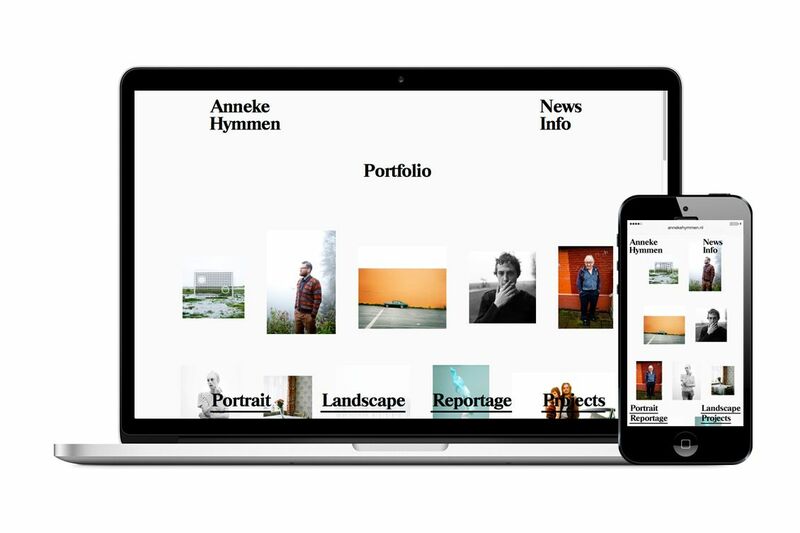 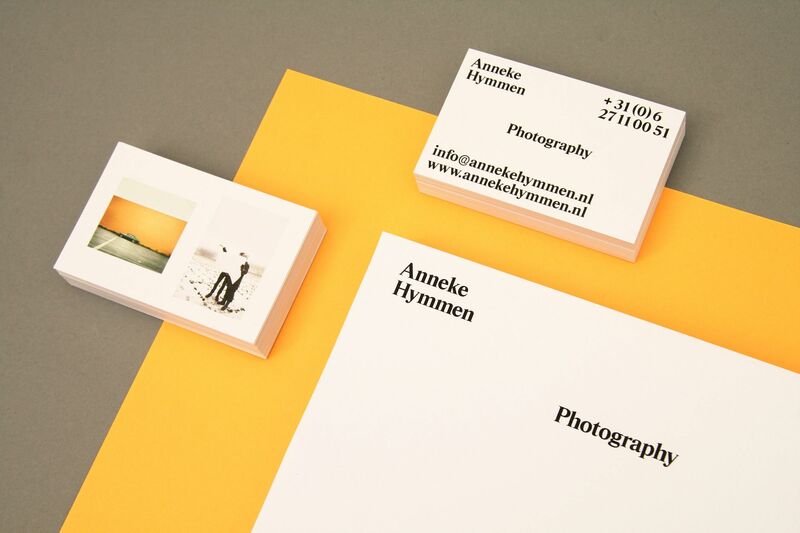 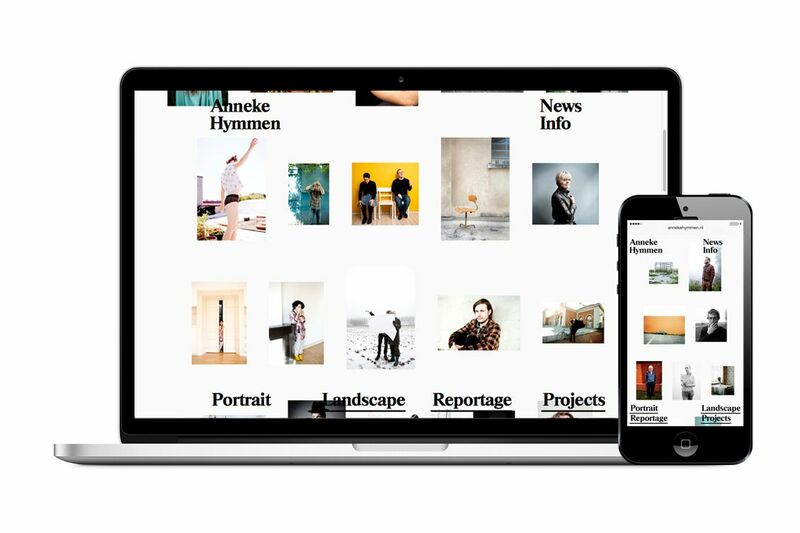 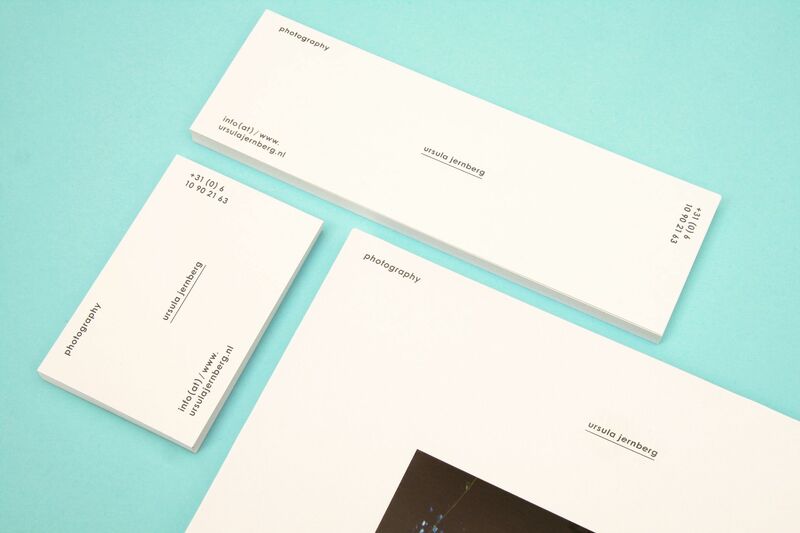 Identity and website design for photographer Anneke Hymmen. 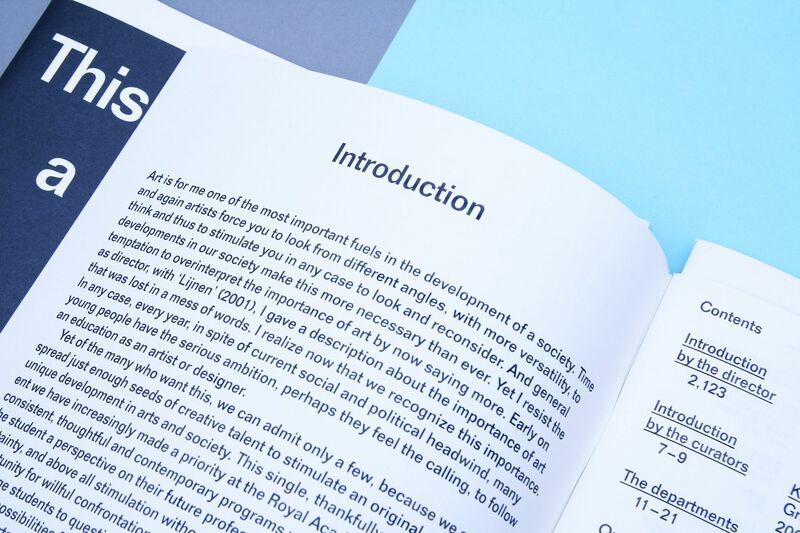 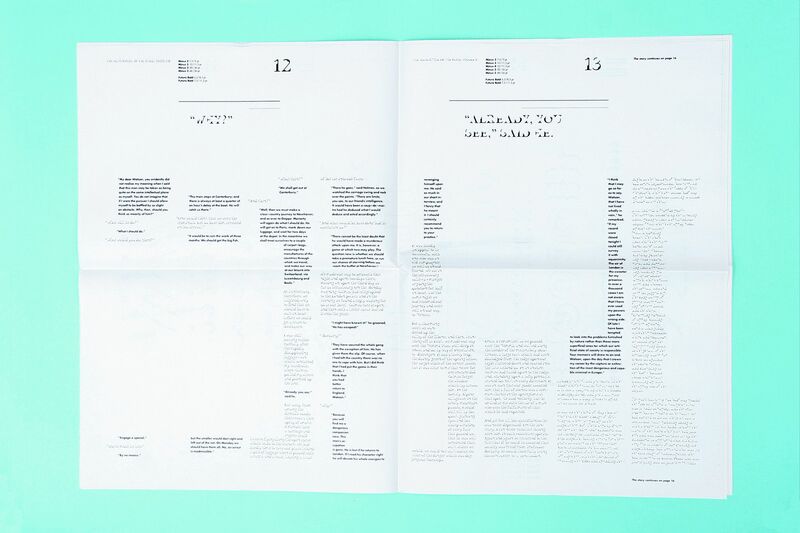 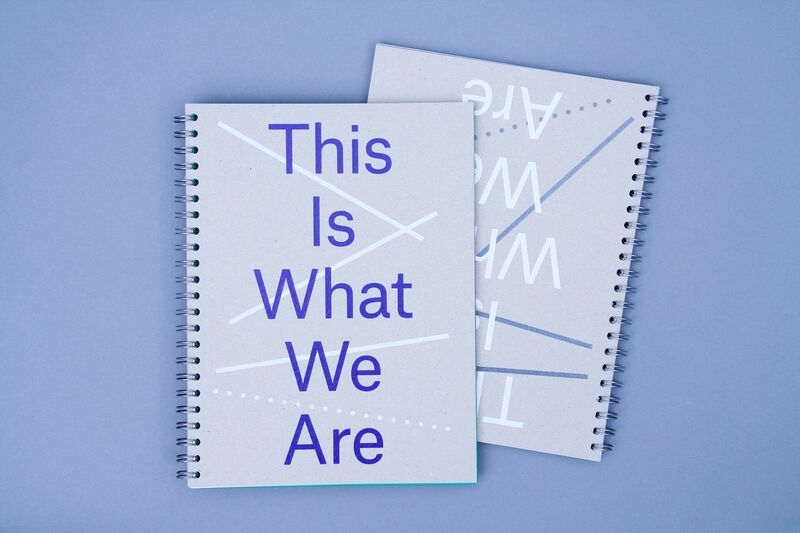 Design of the Accreditation report 'This Is What We Are / Is This What We Are' for the Royal Academy of Art (KABK) in The Hague. 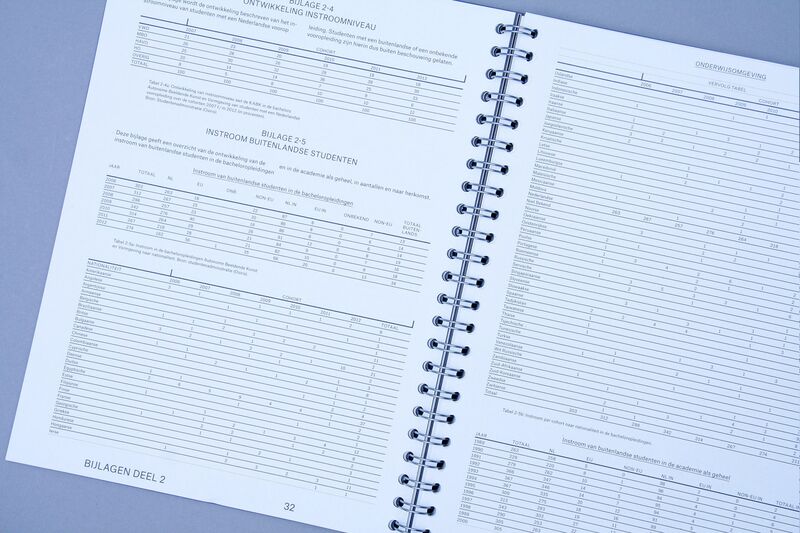 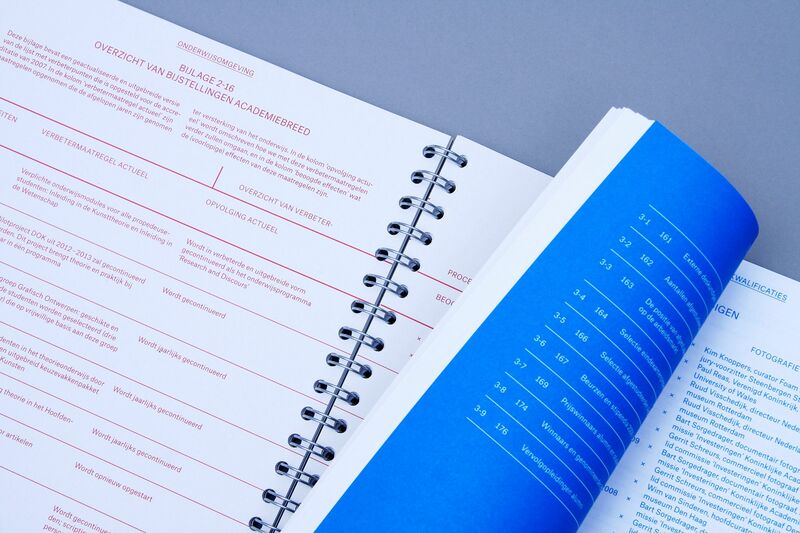 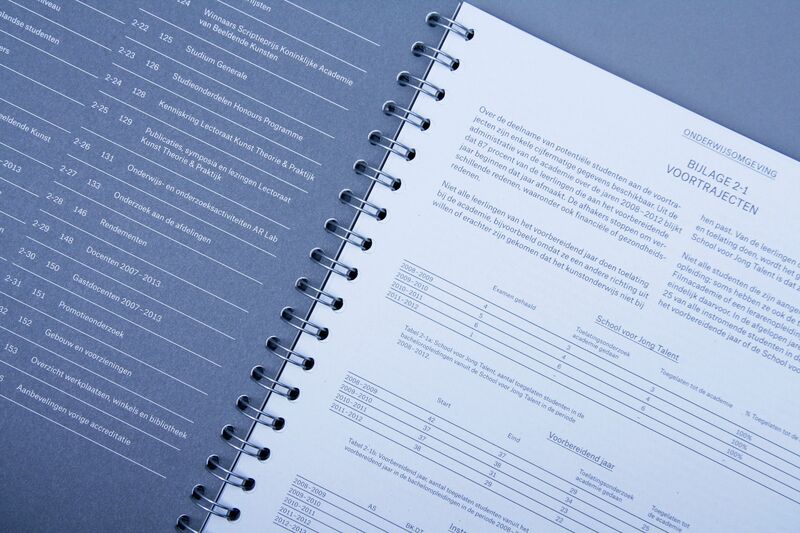 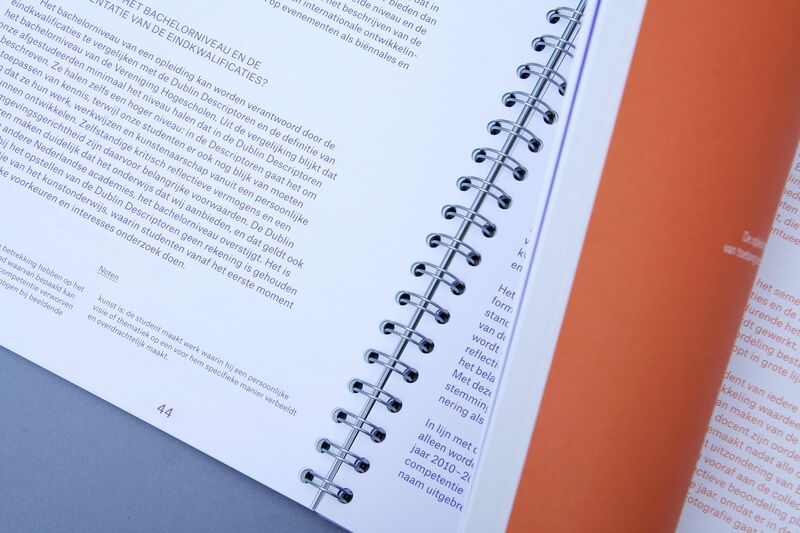 The report consists of two books: one book is the body of the report focusing on main content, with separate photo sections; the second book is the appendix featuring attachments and tables. 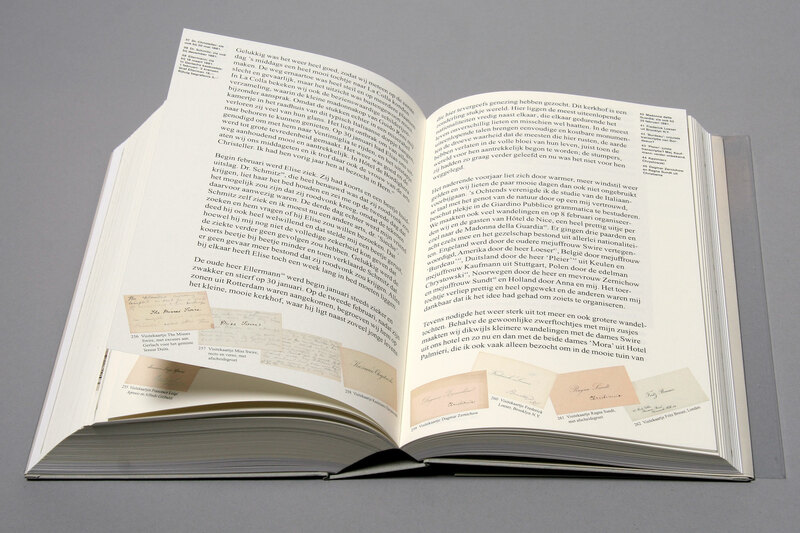 Design choices made reflect a methaphor of the creative process of an artist or designer, a non-lineair, organic and experimental way of working that is erratic and shifts back and forth in contrast to the report itself that has a solid structure from the index at the start of the book to the colophon at the end. 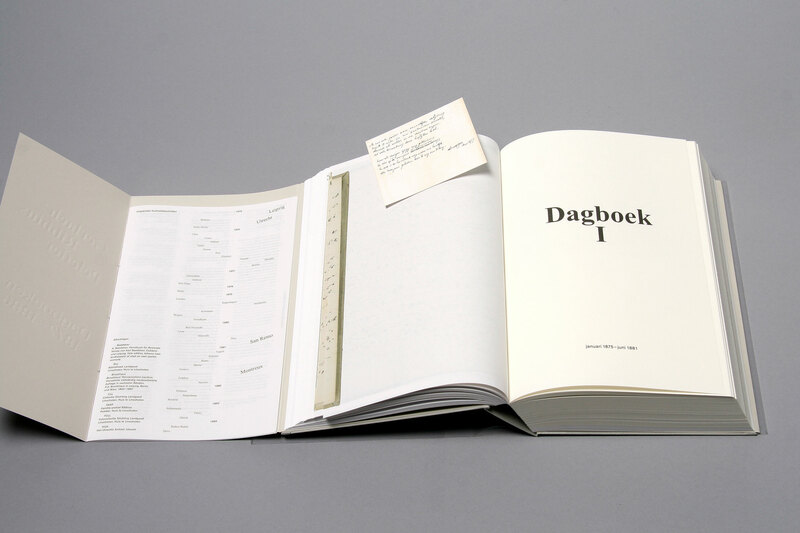 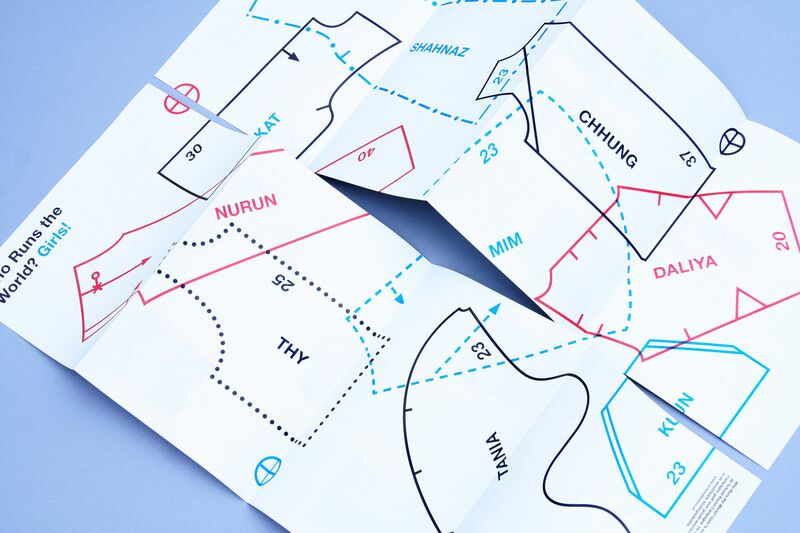 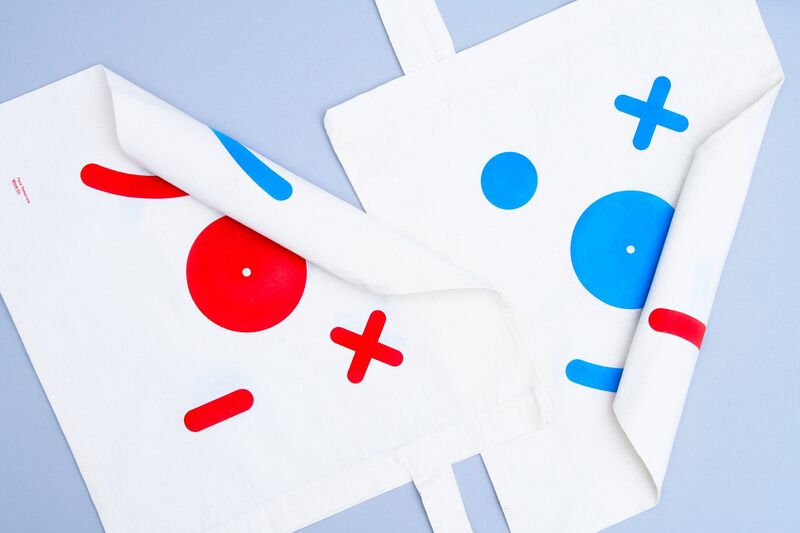 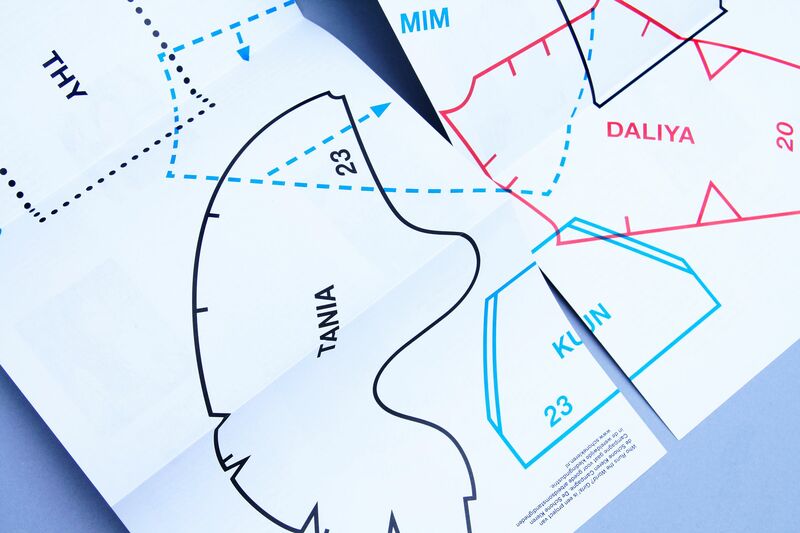 Design in collab­oration with Rob van den Nieuwenhuizen. 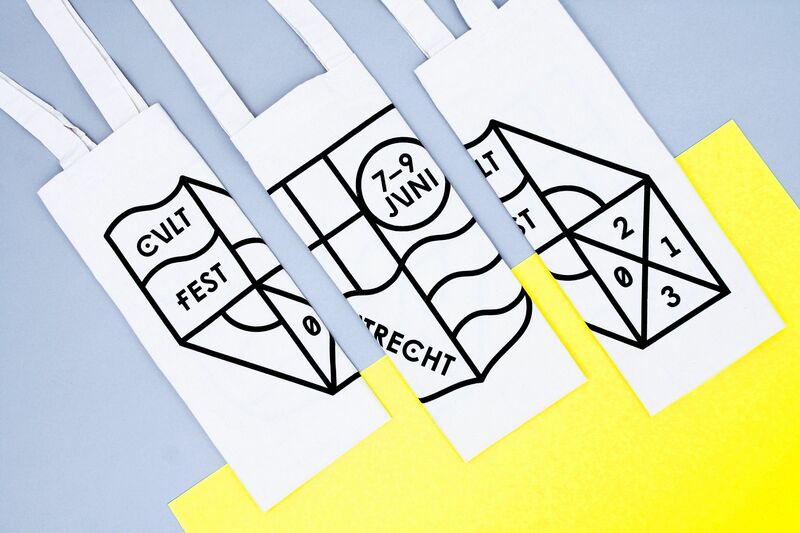 Identity design for Cultfest, an underground cultural festival held in the cellars and wharfs along the Oudegracht canal that runs through the center of Utrecht. 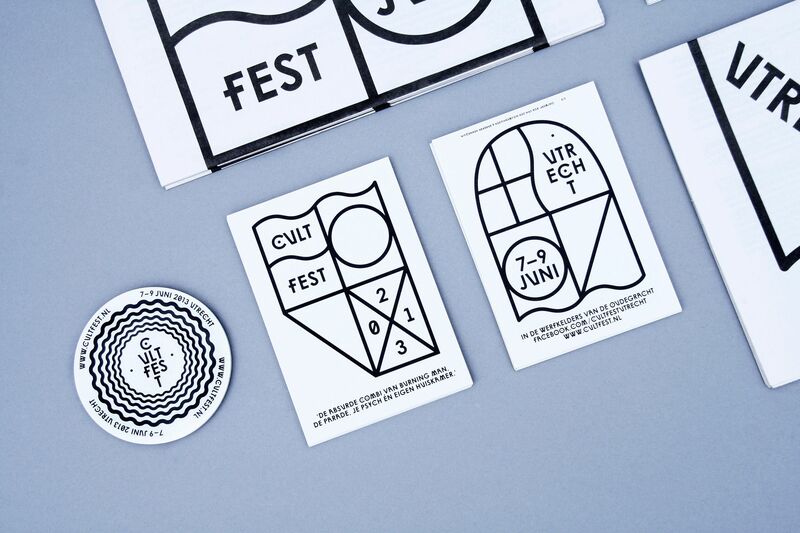 The locations and surroundings shape the festival and were therefor the inspiration for the iden­tity: shapes of cellar entrances, munic­ipal shields and the water that is ever present. 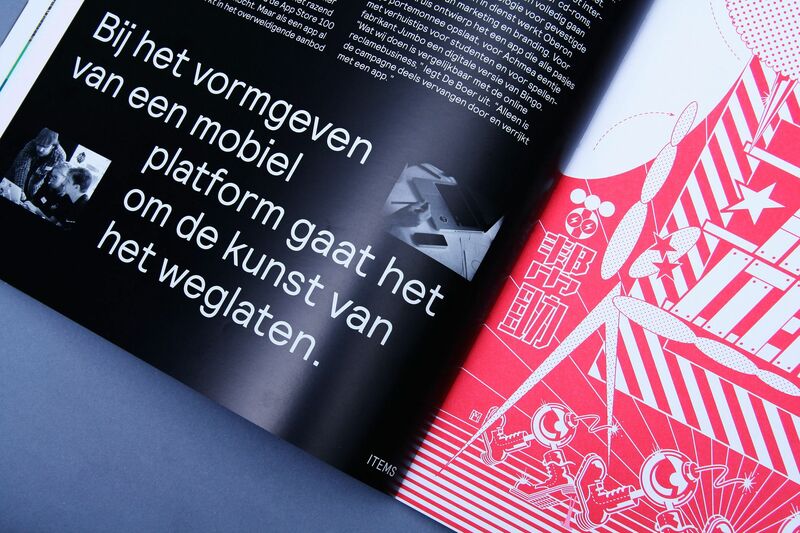 Design in collaboration with Rob van den Nieuwenhuizen. 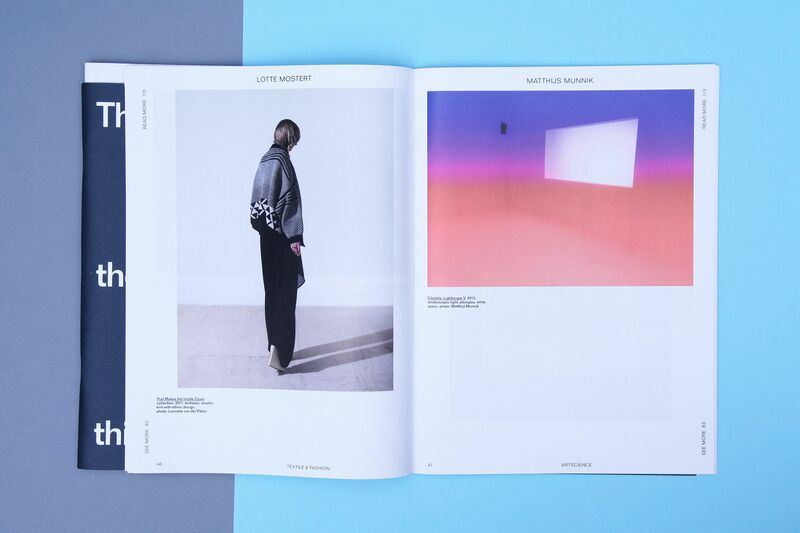 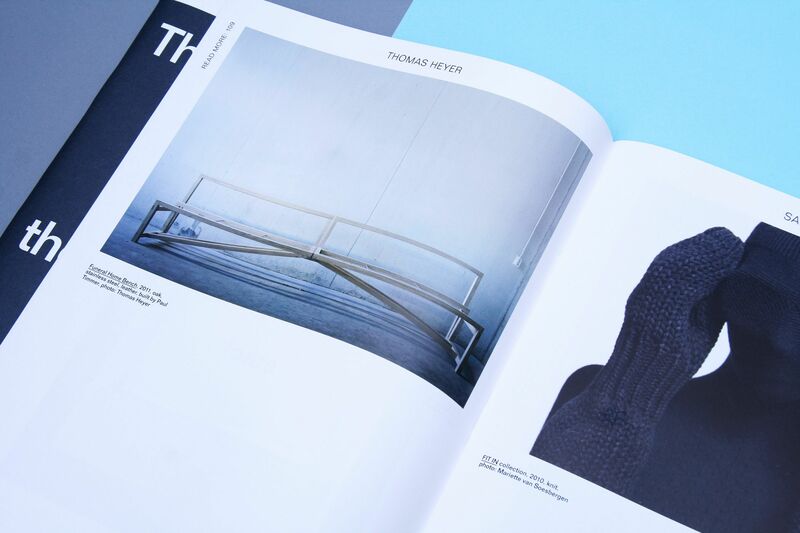 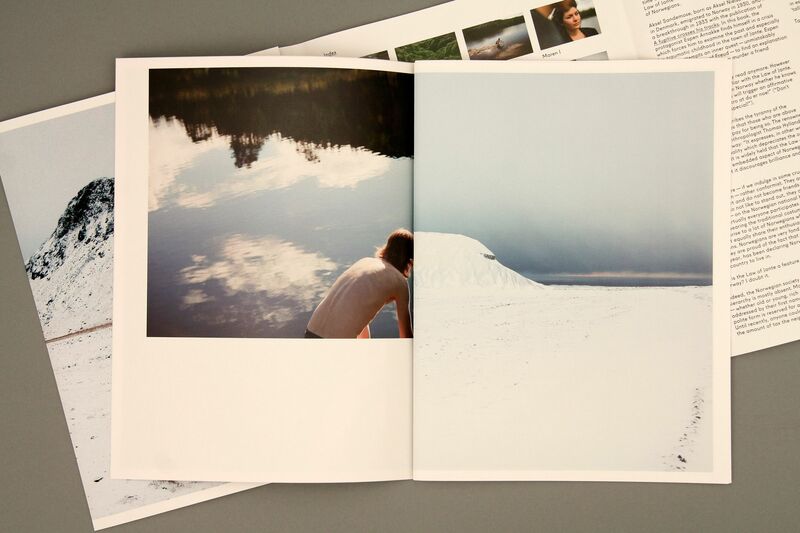 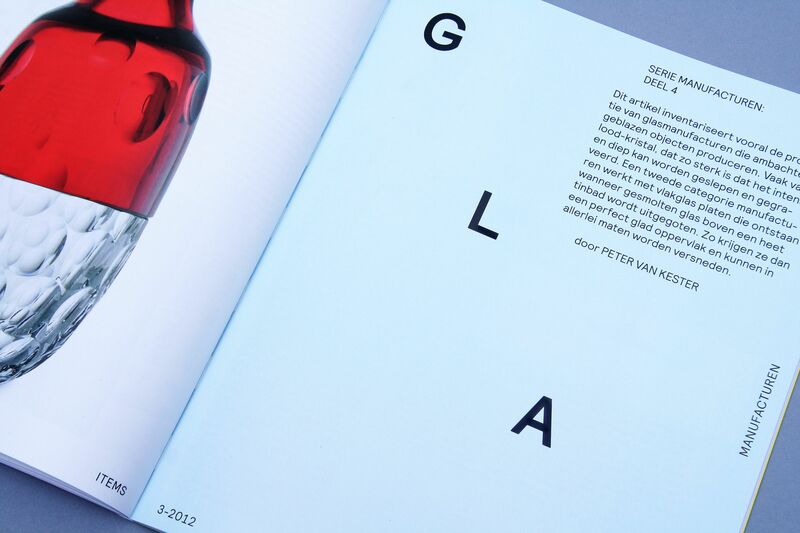 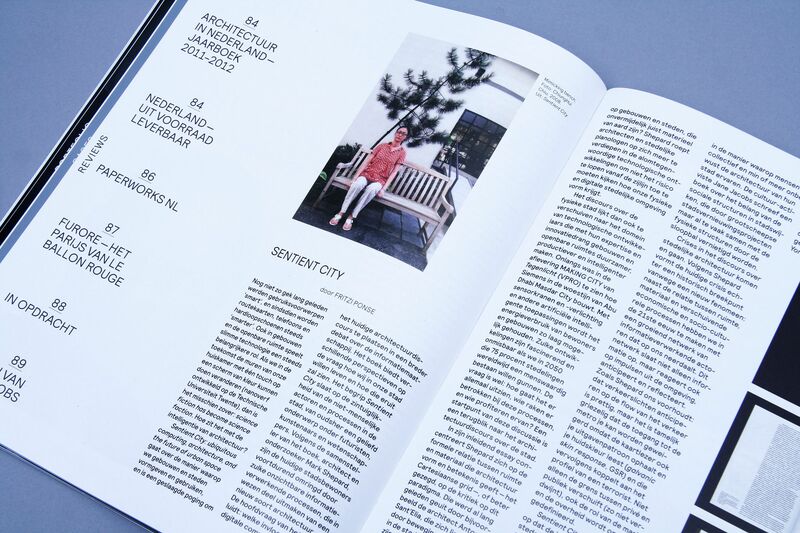 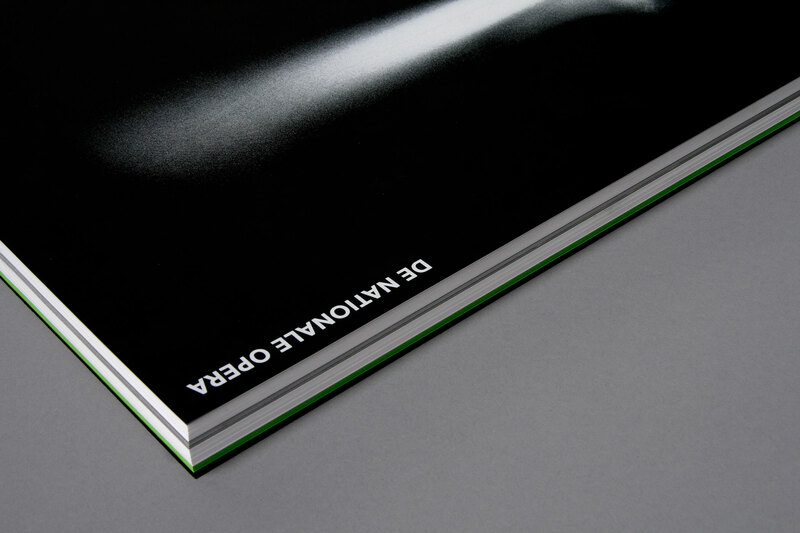 Publication design for photographer Ursula Jernberg. 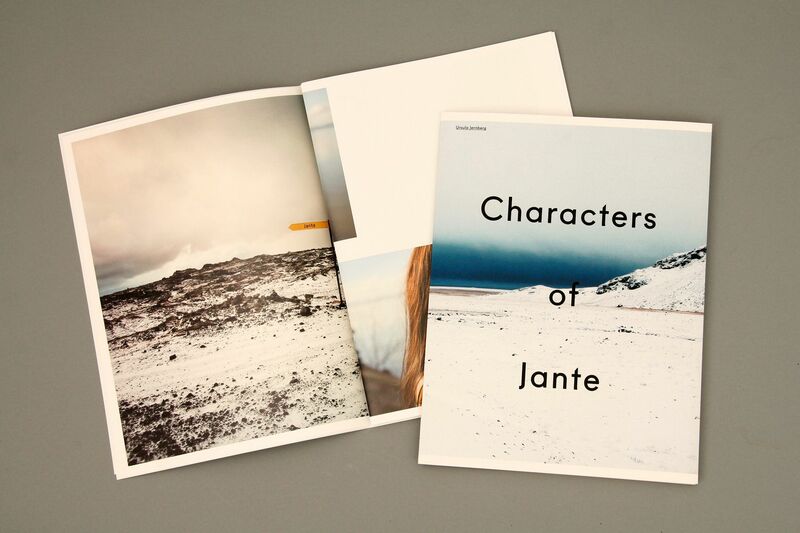 'Characters of Jante' features a series of photographs from an ongoing project about the infamous ‘Law of Jante’ that is deeply embedded in Scandinavian culture - in essence a Scandinavian version of the English ‘tall poppy syndrome’. 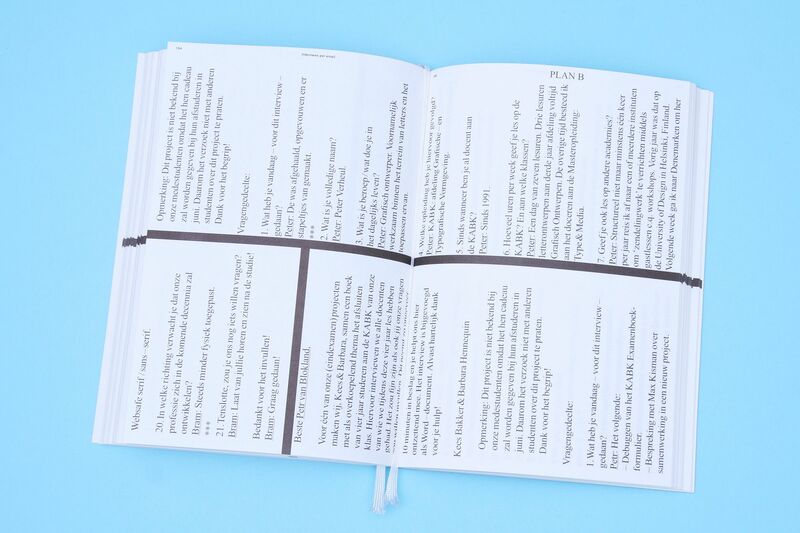 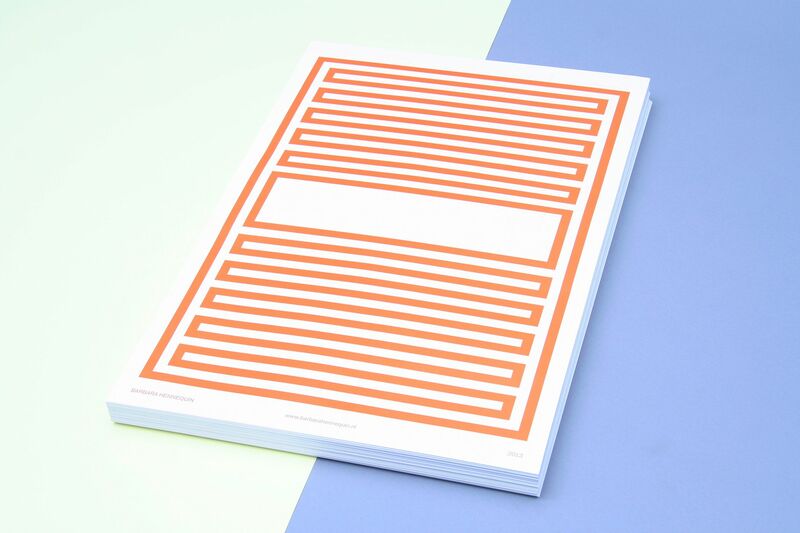 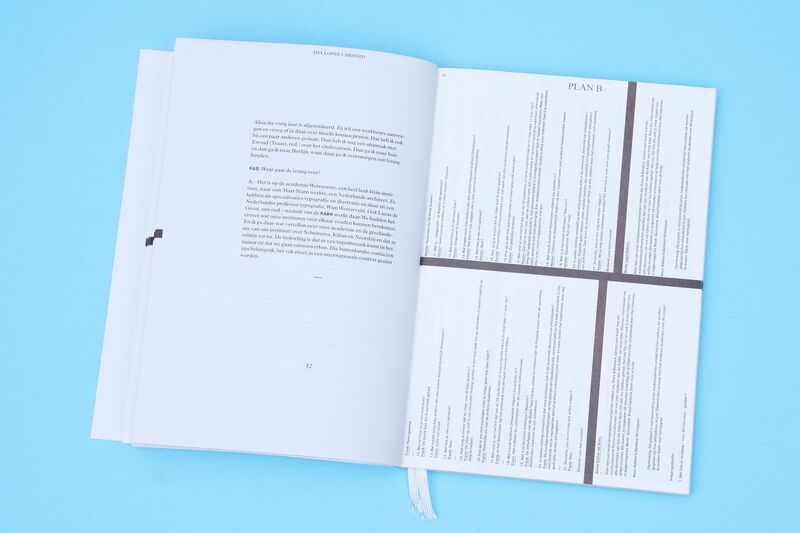 The publication is a 4 page fold-around with a 36 page unbound book inside. 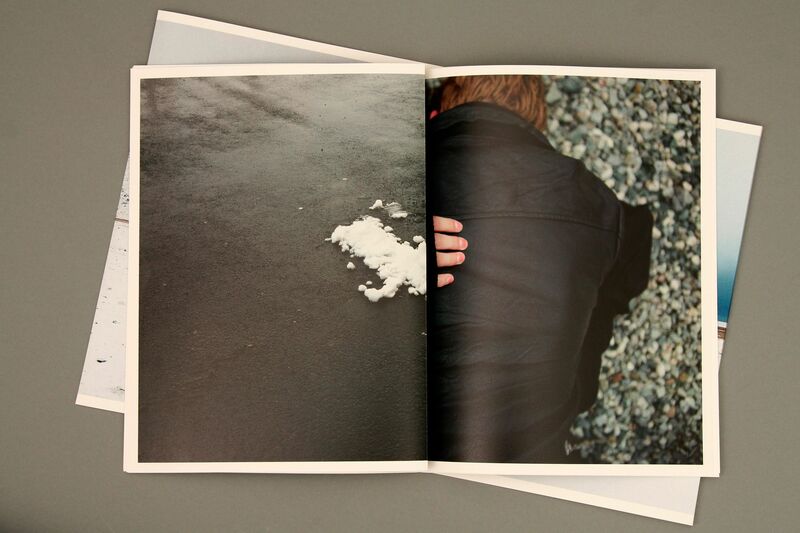 All the photo pages inside are loose sheets folded into one section. 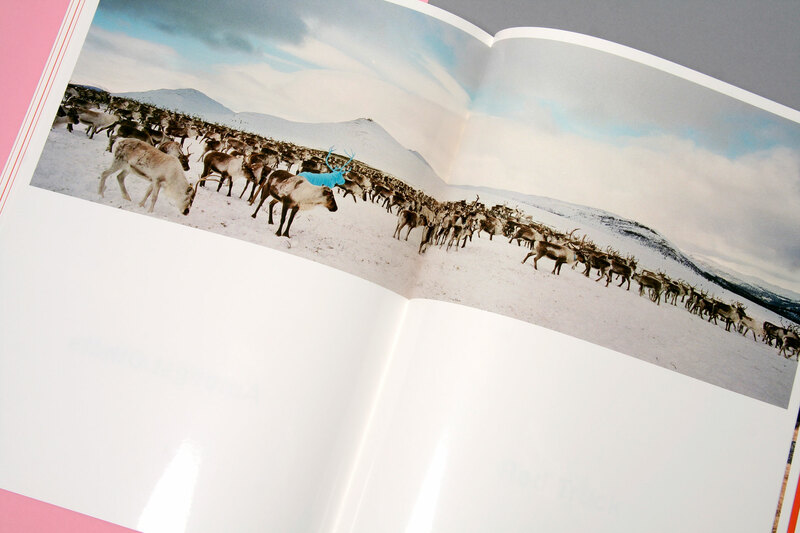 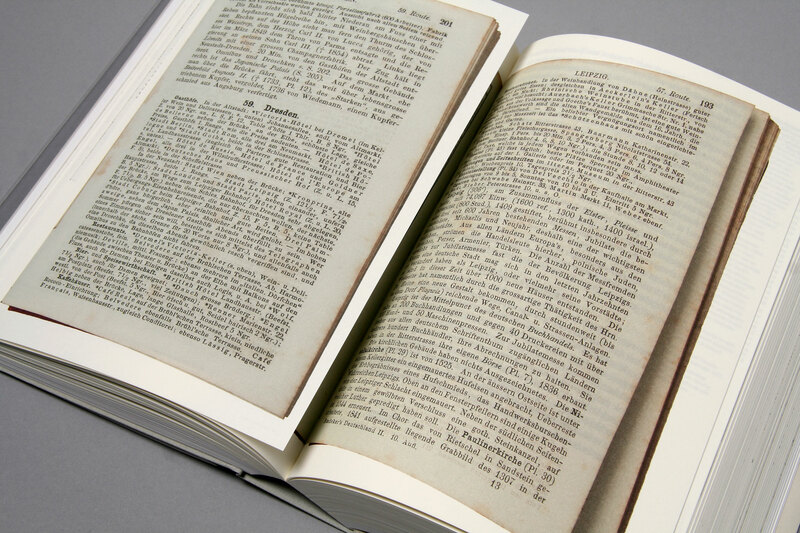 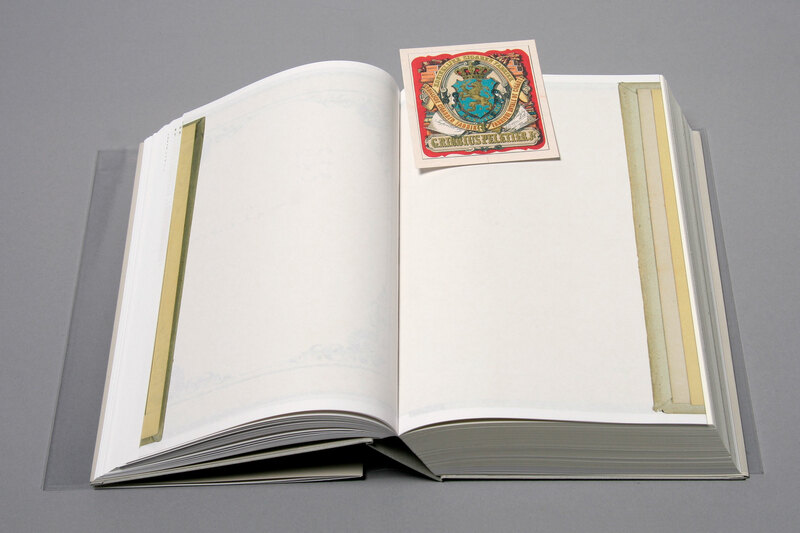 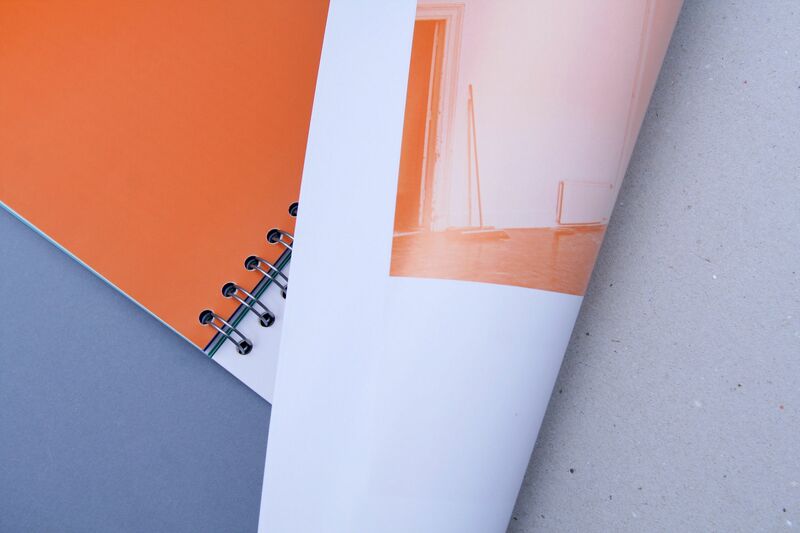 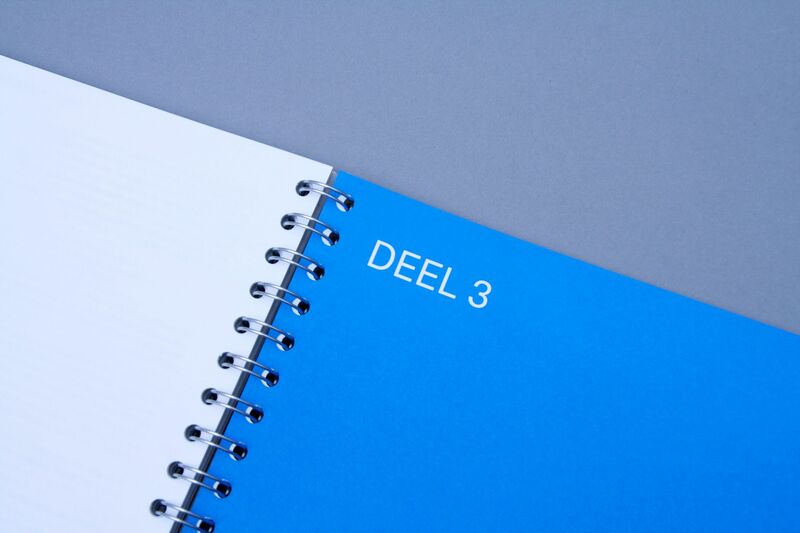 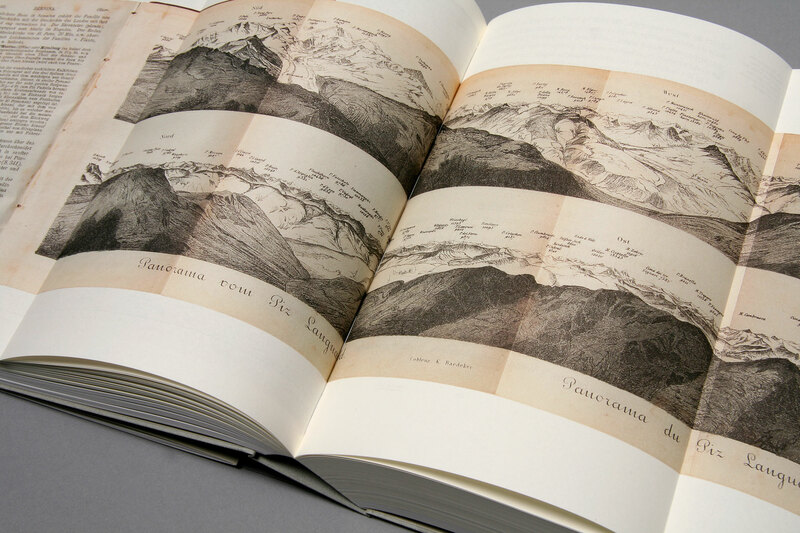 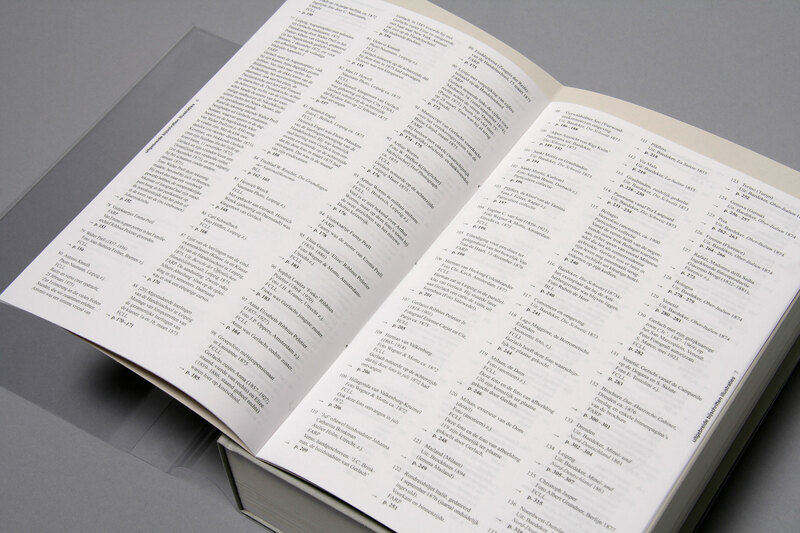 It is printed in full-colour waterless offset and the cover has a soft touch finish. 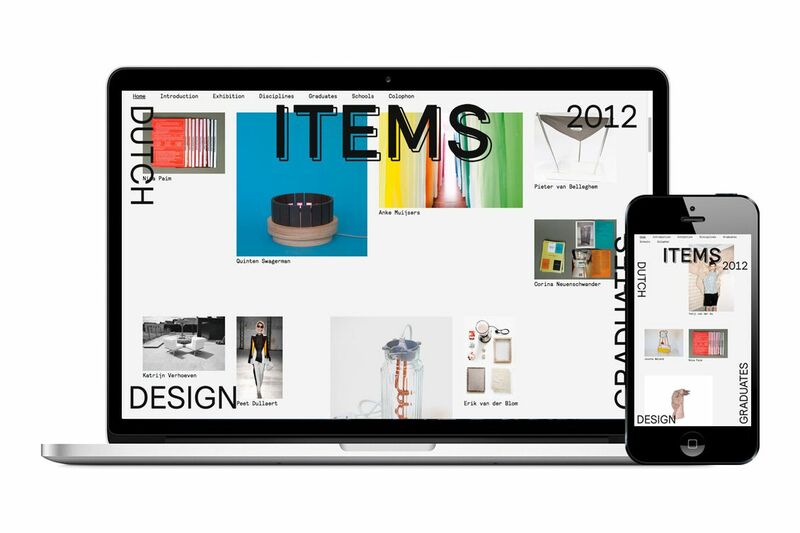 Exhibition and website design for the ITEMS Dutch Design Graduates 2012 exhi­bition at the Machinekamer (Strijp-S area) in Eindhoven during Dutch Design Week 2012. 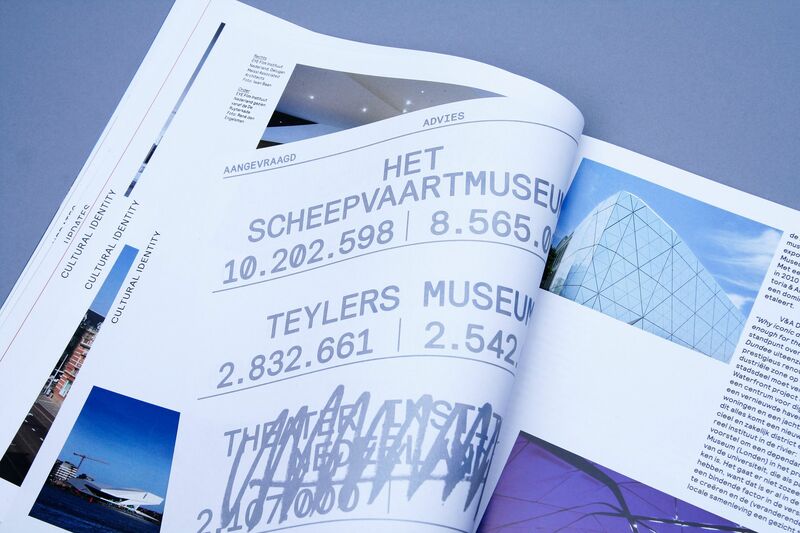 Design in collaboration with Rob van den Nieuwenhuizen, Jeremy Jansen and denieuwegeneratie architects. 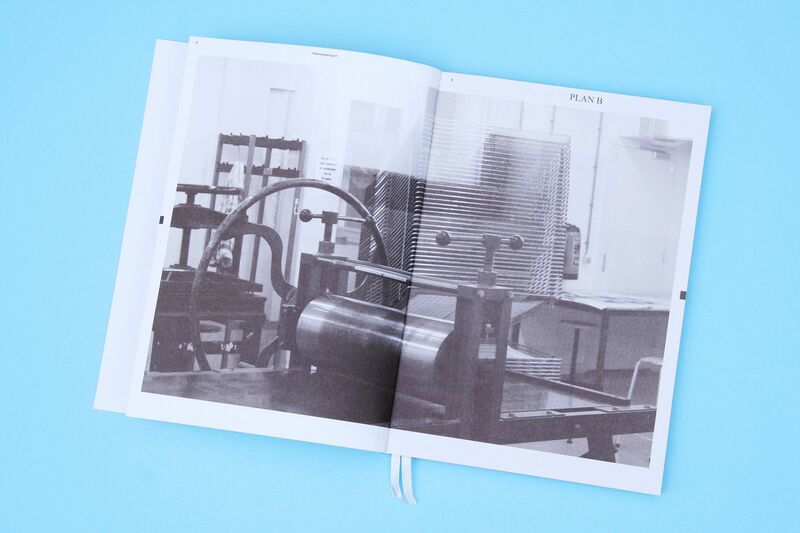 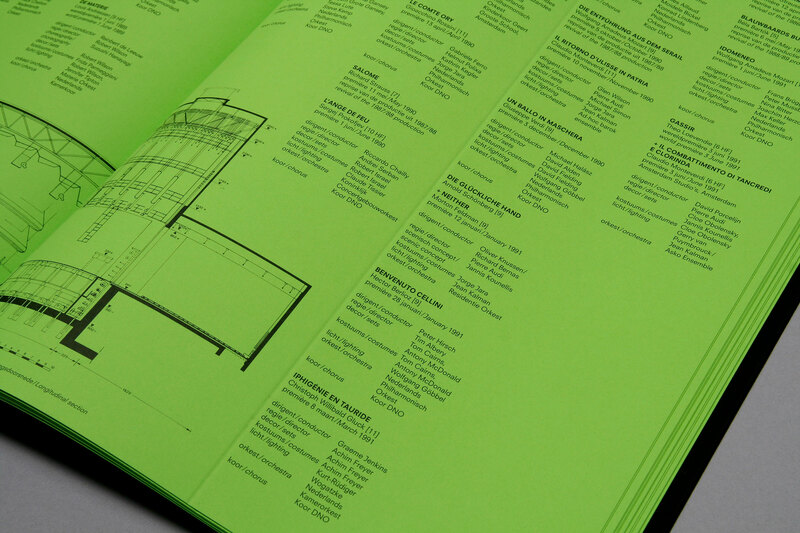 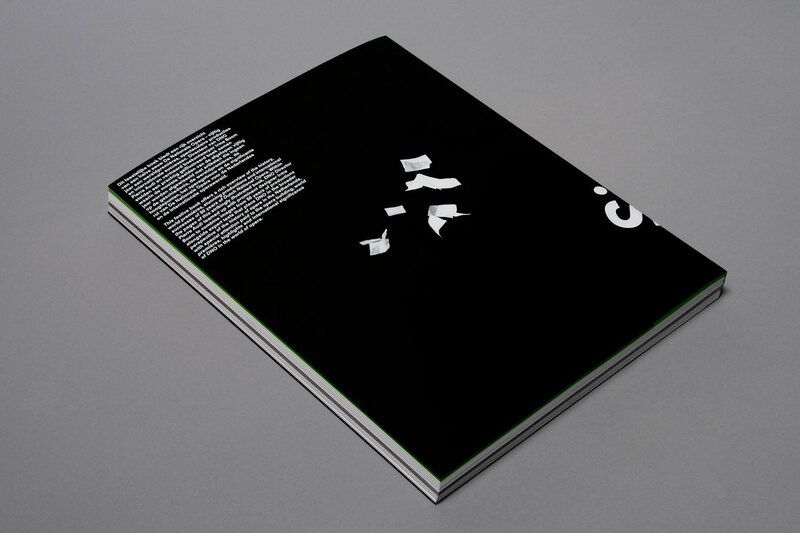 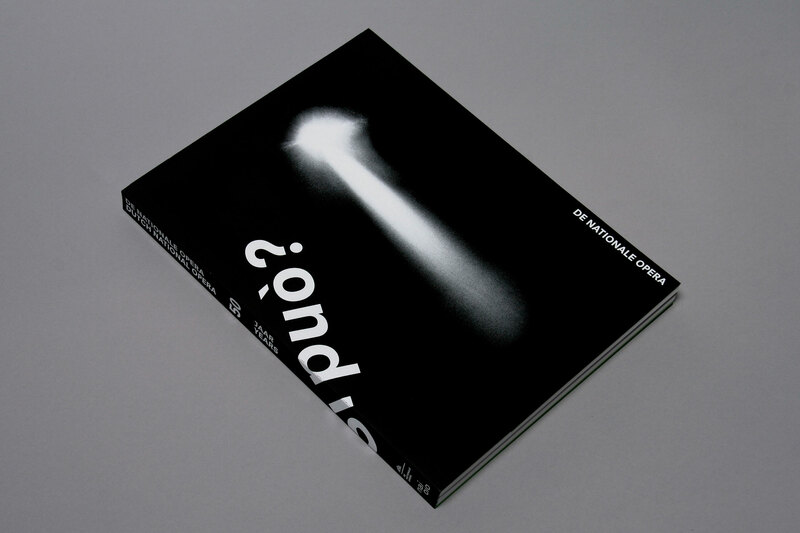 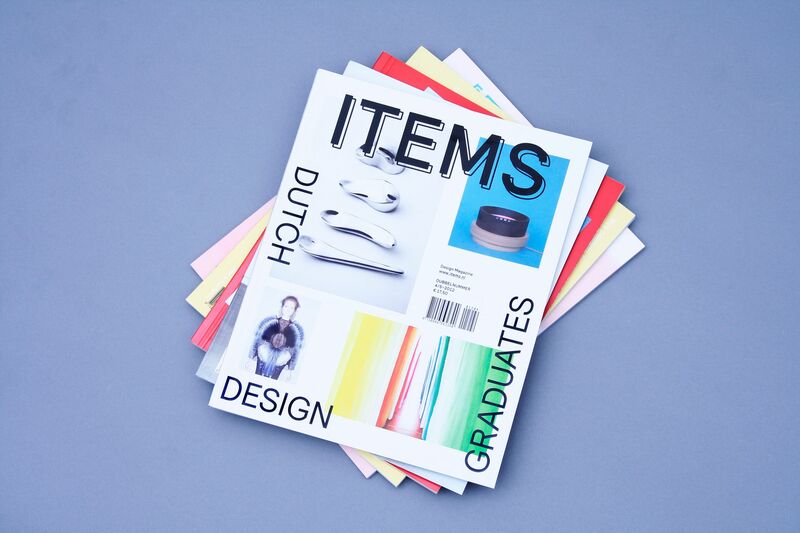 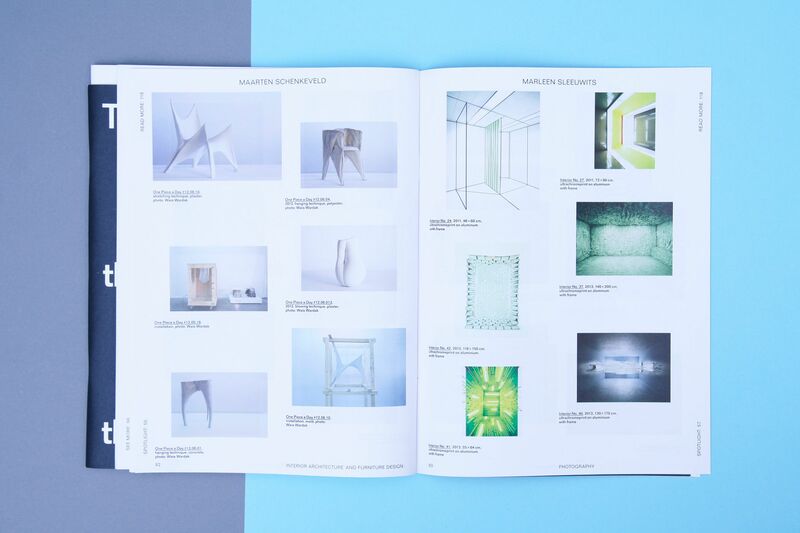 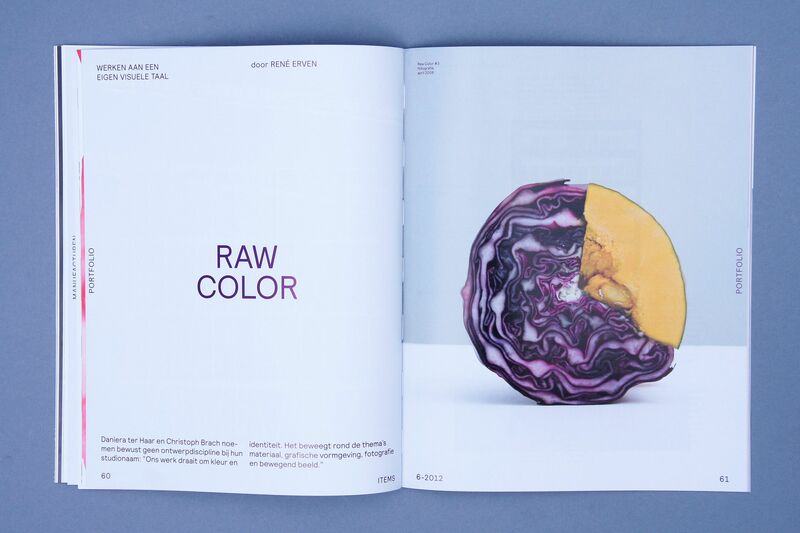 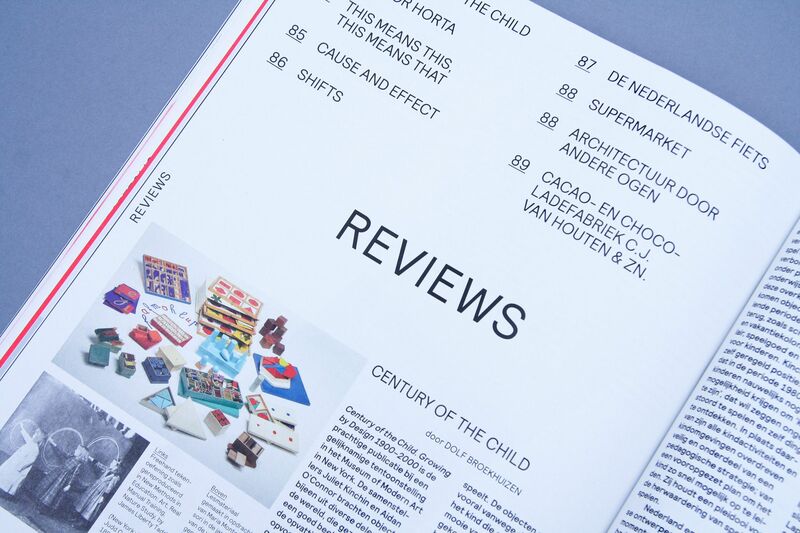 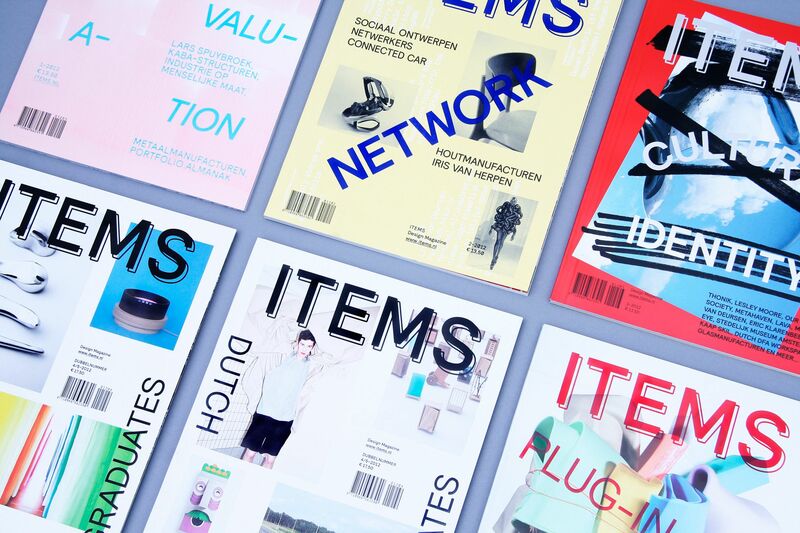 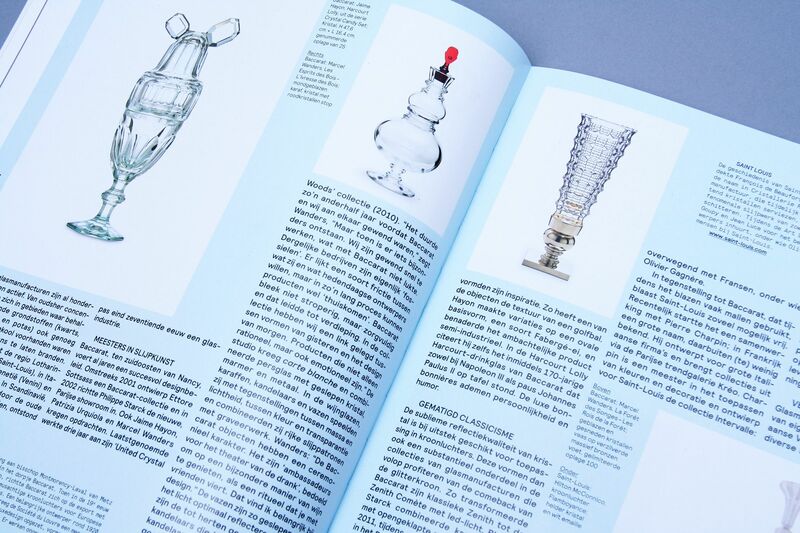 (Re)design of ITEMS Design Magazine (2012 editions). 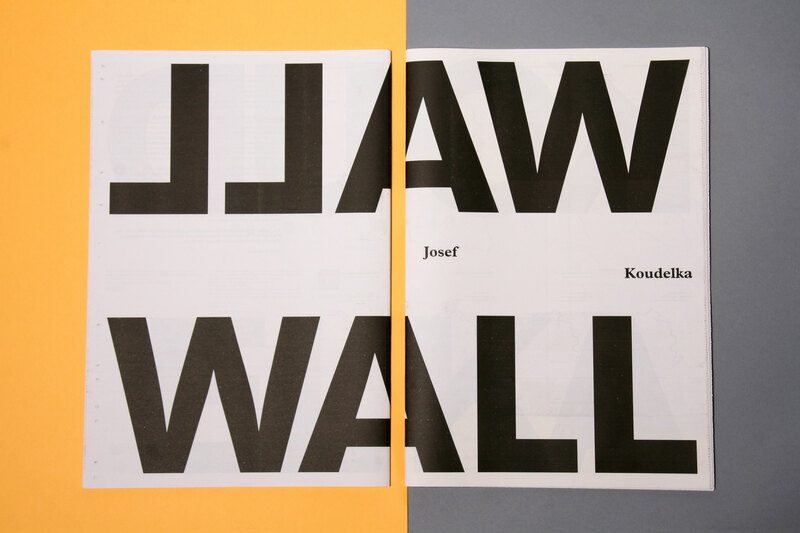 Design in collaboration with Rob van den Nieuwenhuizen and Jeremy Jansen. 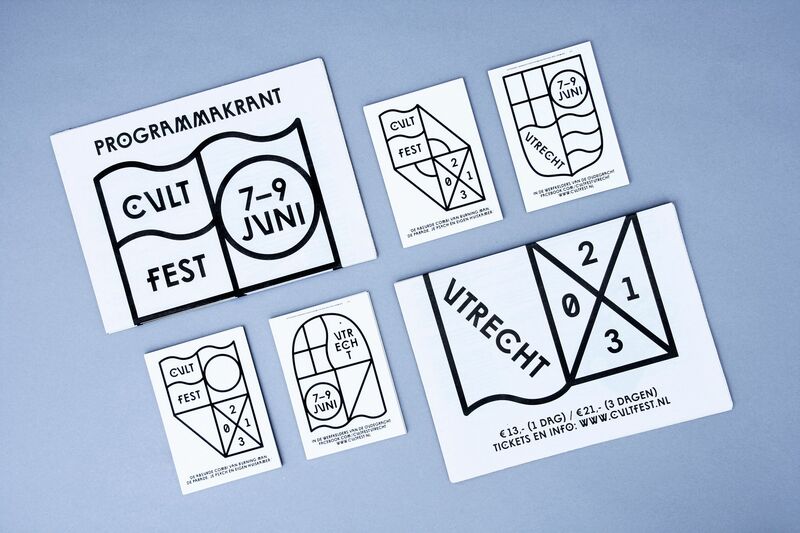 Poster design for the Graphic Design Festival Breda (GDFB) 2012. 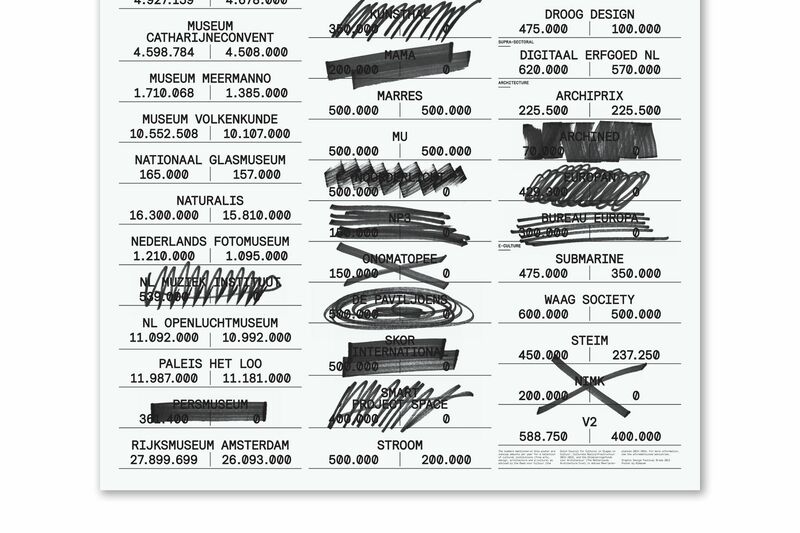 The numbers mentioned on this poster are subsidy amounts per year for a selection of cultural institutions (fine arts, design, architecture and e-culture) as advised by the Raad voor Cultuur (the Dutch Council for Culture) in Slagen in Cultuur, Culturele Basis­infra­structuur 2013-2016, and the Stimuleringsfonds voor Architectuur (The Netherlands Archi­tecture Fund) in Advies Meerjaren­plannen 2013-2014. 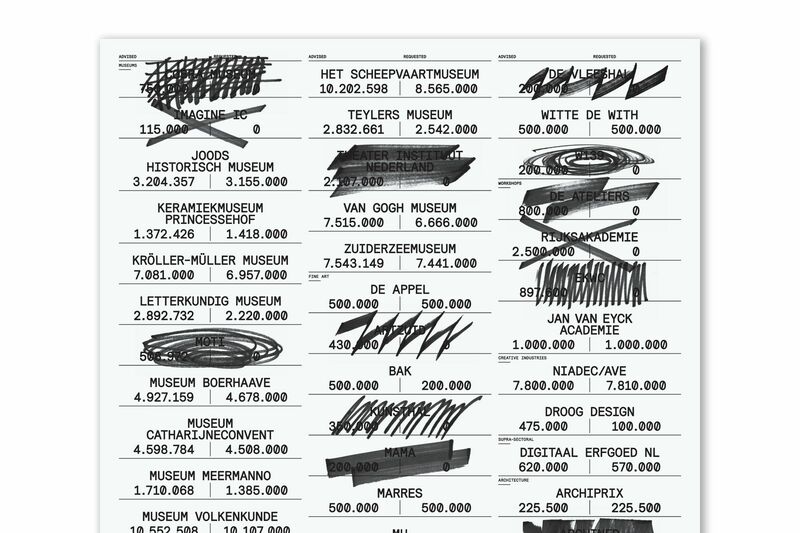 As a result of these cuts a vast number of cultural insti­tutions will most likely disappear completely from the Dutch cultural landscape. 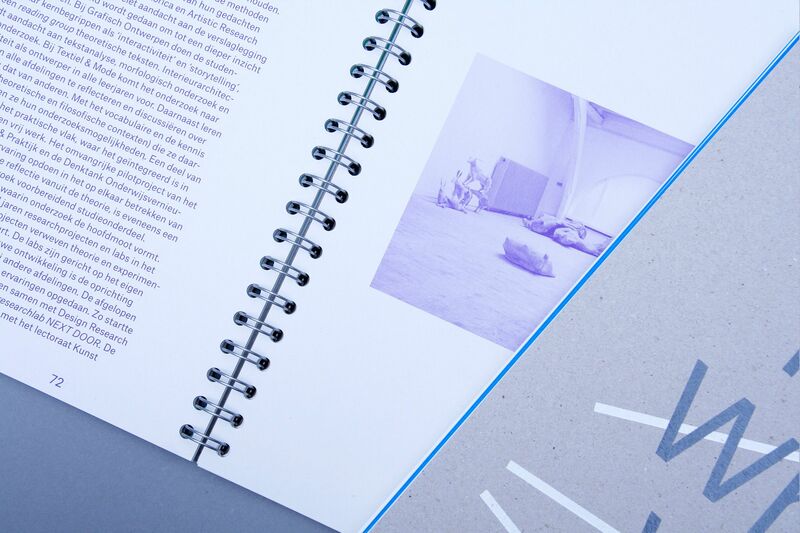 Design in collaboration with Rob van den Nieuwenhuizen and Jeremy Jansen. 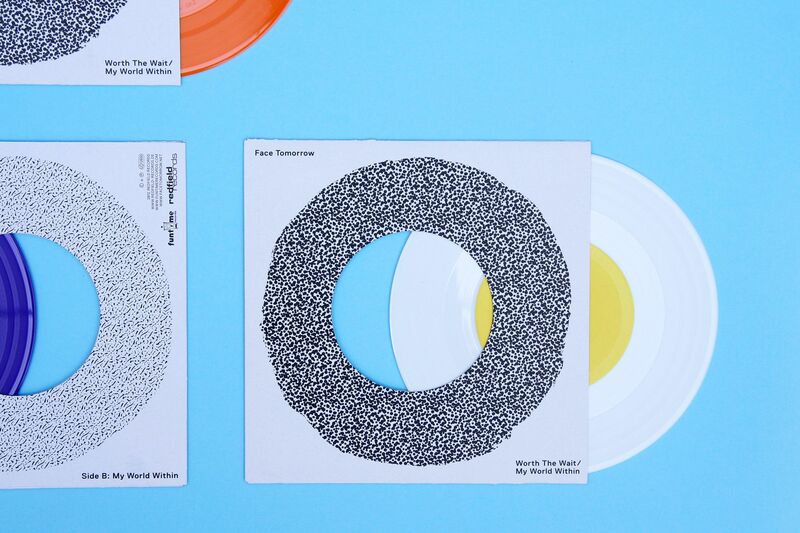 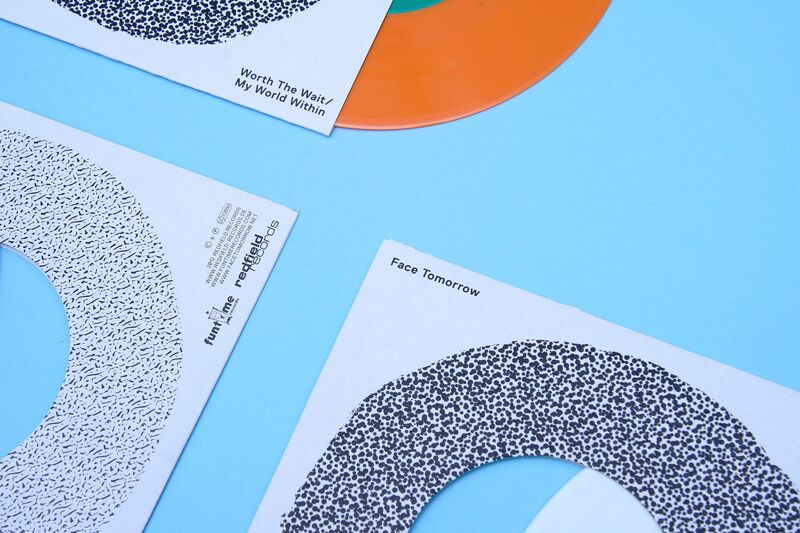 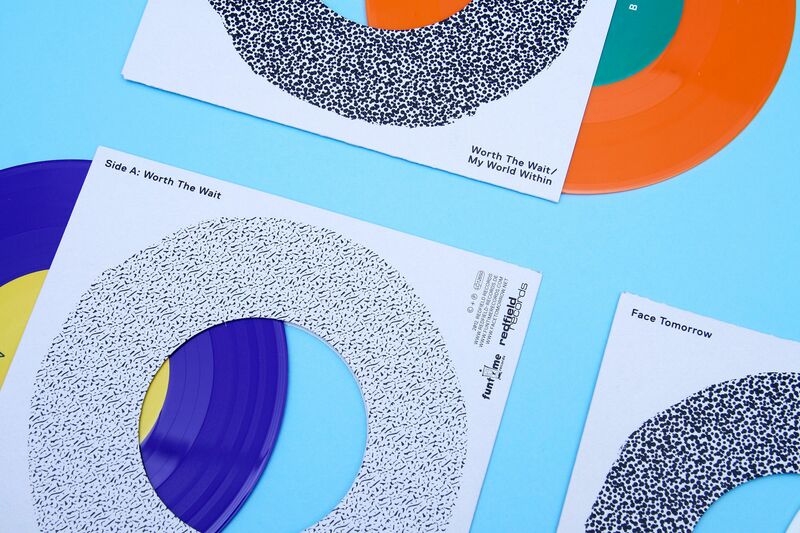 Artwork for Face Tomorrow’s acoustic 7”, featuring acoustic versions of “Worth the Wait” and “My World Within” as a preview for their upcoming acoustic album release. 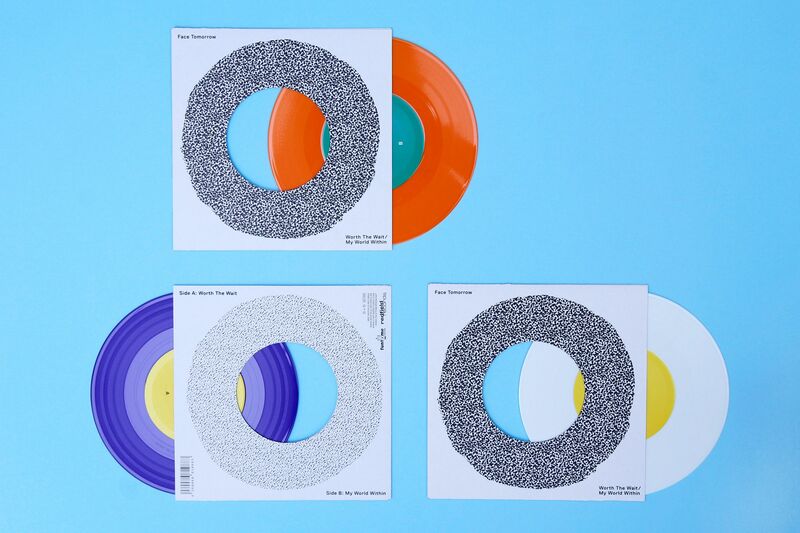 Available in three vinyl colours: white, purple (Special edition for Record Store Day 2012) and orange (Special edition for Groezrock 2012). 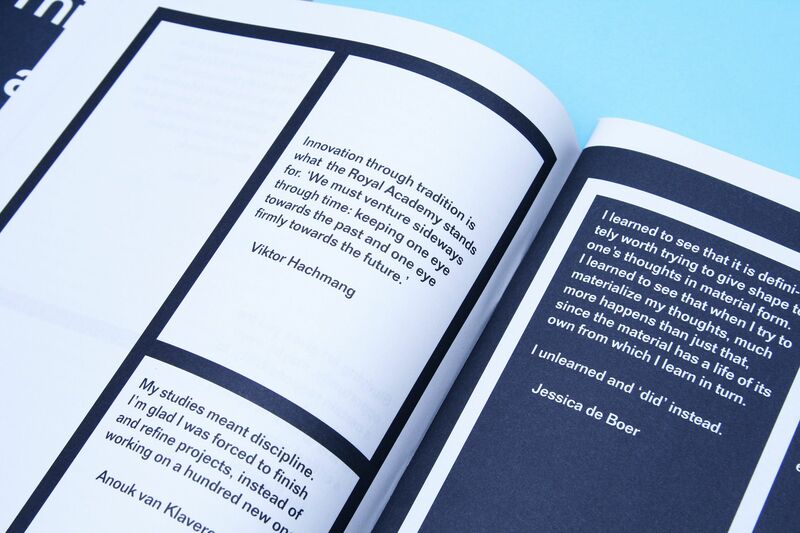 Design in collab­oration with Rob van den Nieuwenhuizen. 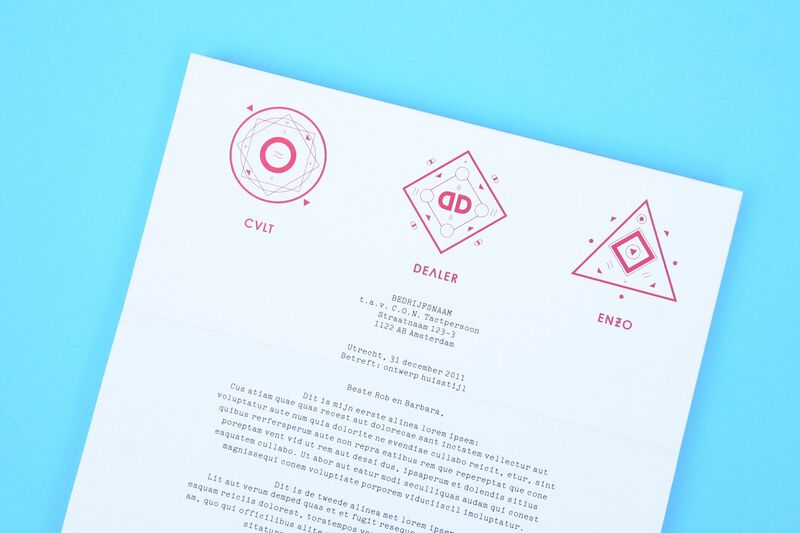 Identity for Cult Dealer Enzo, an event and workshop place in one of the wharf cellars in the centre of Utrecht, the Netherlands. 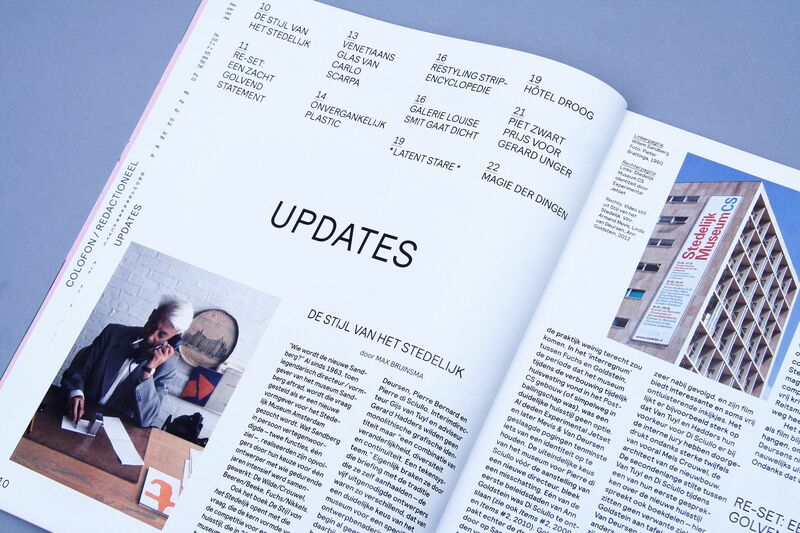 Cult Dealer Enzo has three counterparts: Cult, an experimental lab for creative talent in Utrecht. 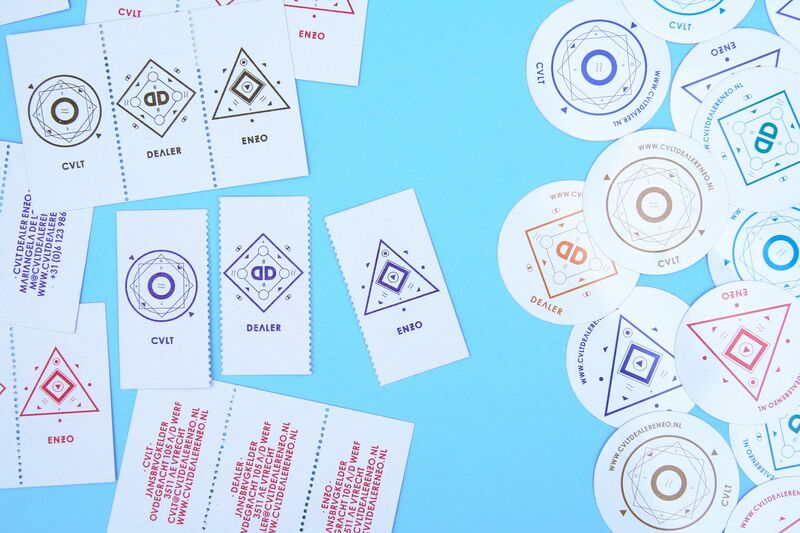 Dealer, as a dealer for concepts, formats and dreams. 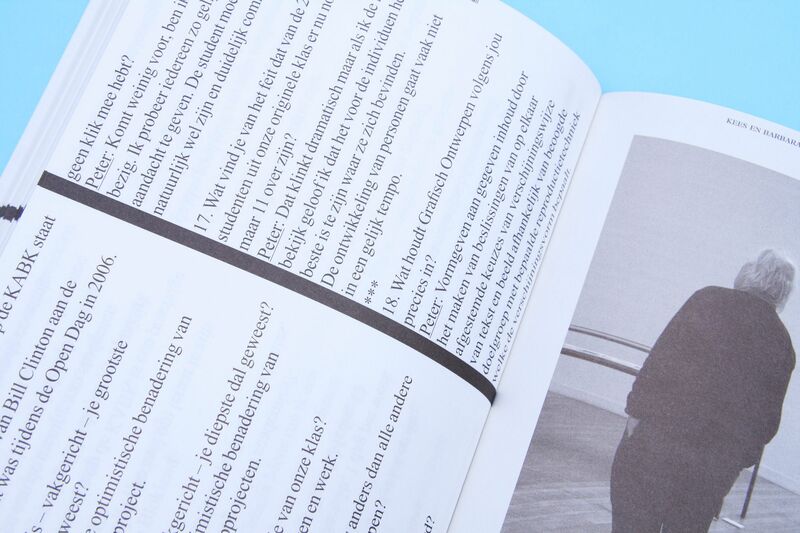 And Enzo, which is a surprise everytime, for all parties involved. 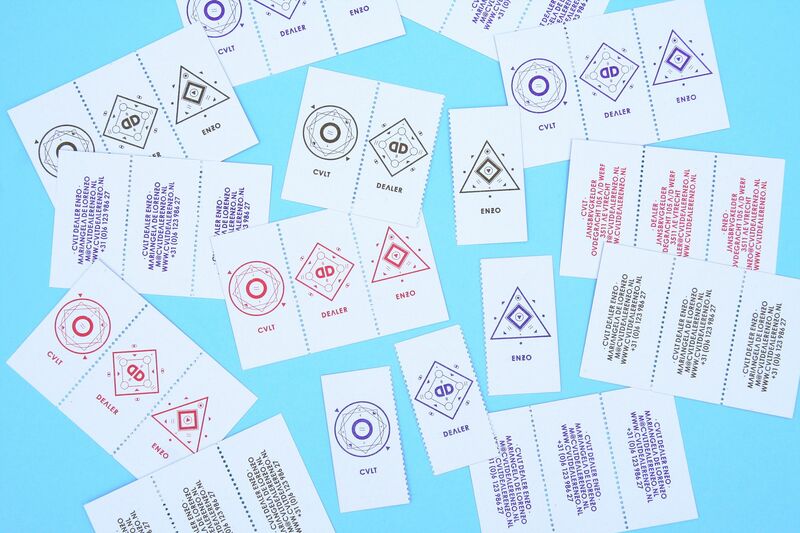 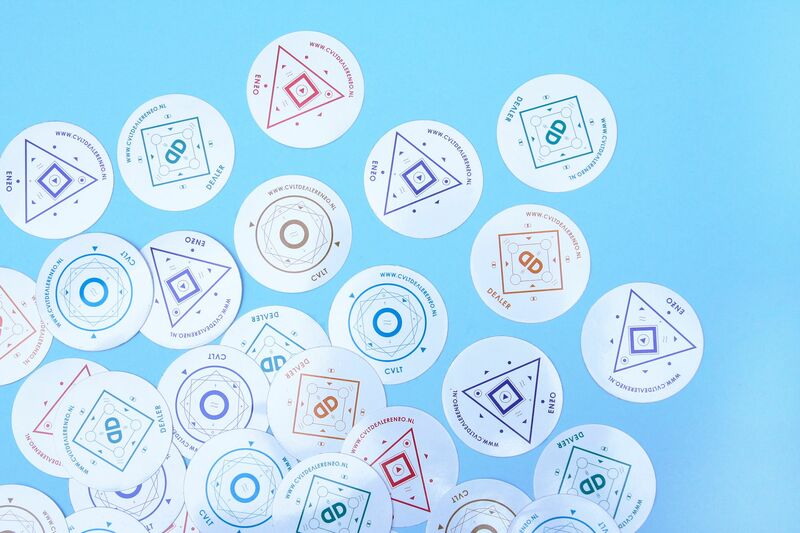 Each counterpart is paired up with its own cult-like icon and can be used seperately or in any preferred combination. 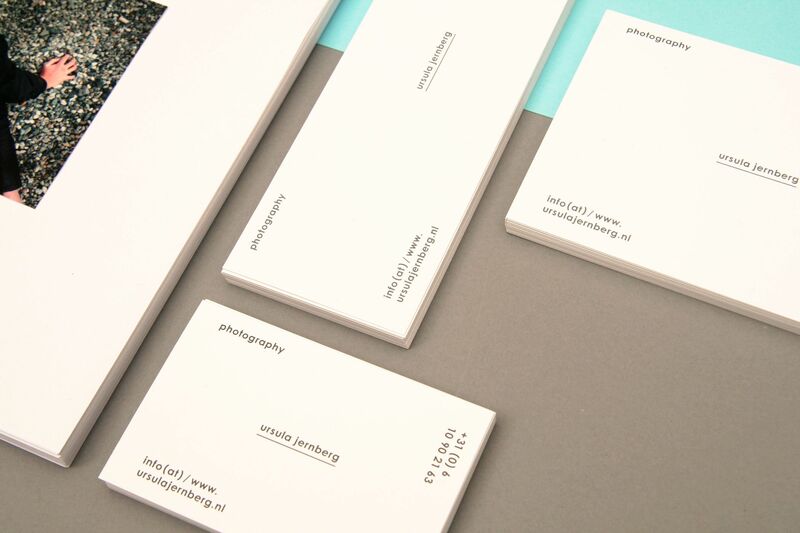 Design in collaboration with Rob van den Nieuwenhuizen. 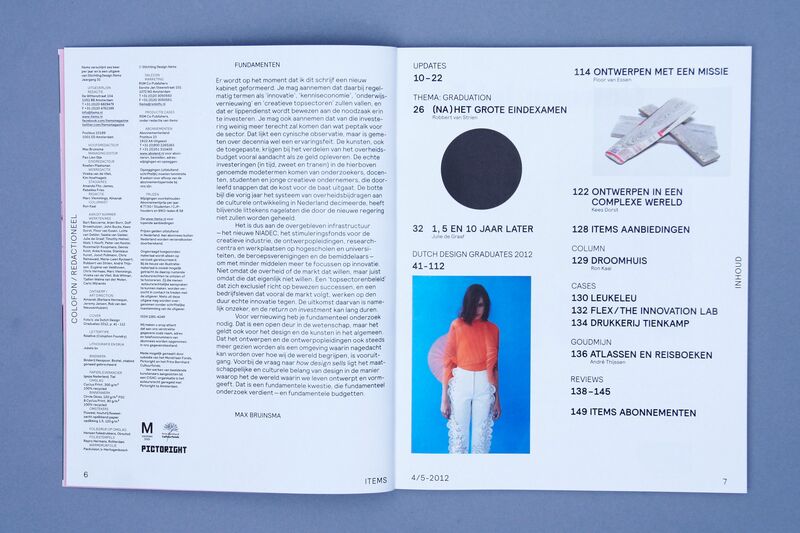 'What Moves Me' is a collaboration with photographer Ursula Jernberg for the exhibition 'Getuigen' (translates as Witnesses) in Het Nutshuis in The Hague. 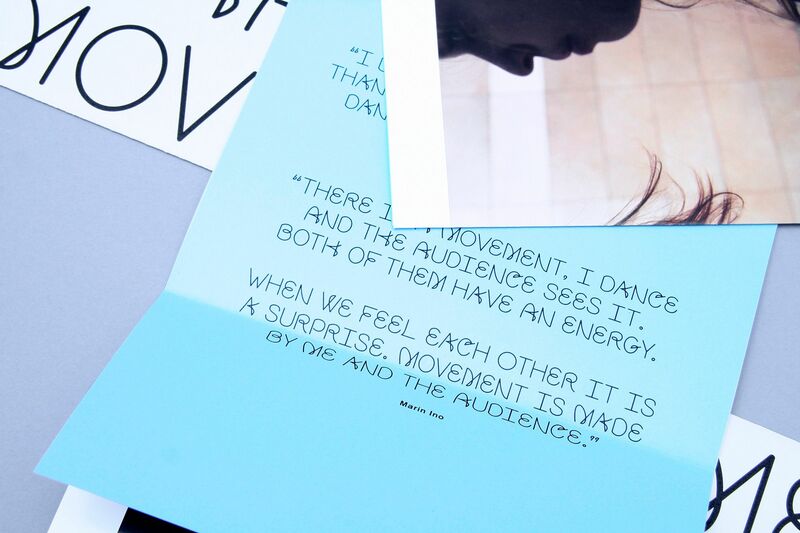 For this exhibition Jernberg made a series of photographs inspired by a quote from world famous choreo­grapher Pina Bausch: "I am more interested in what moves people than how they move". 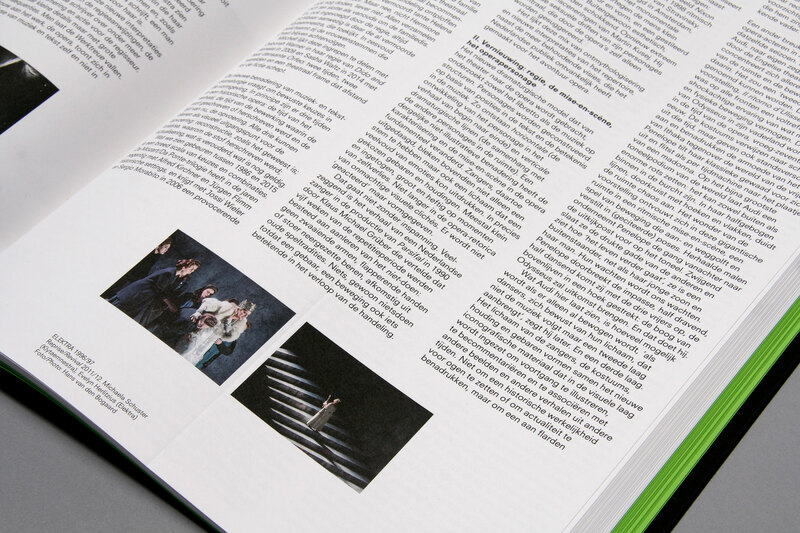 The publication features a number of quotes by (the photographed) dancers of the Royal Conservatory of The Hague on what moves them in their dancing. 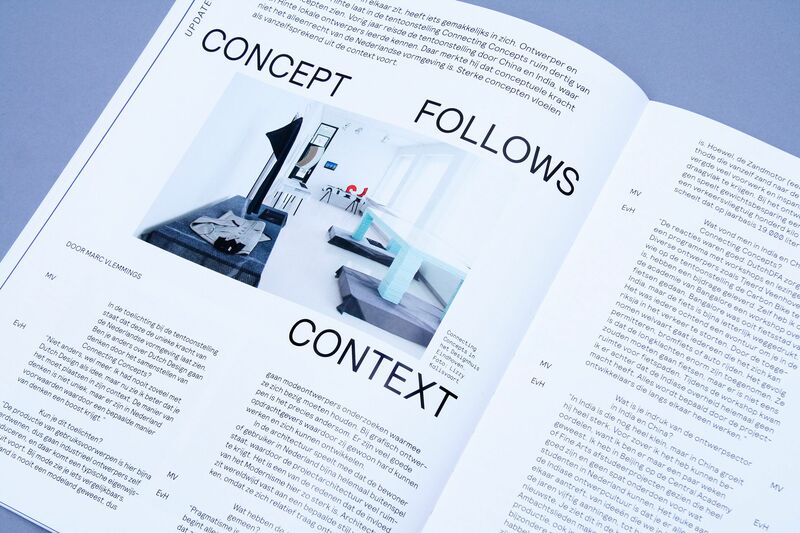 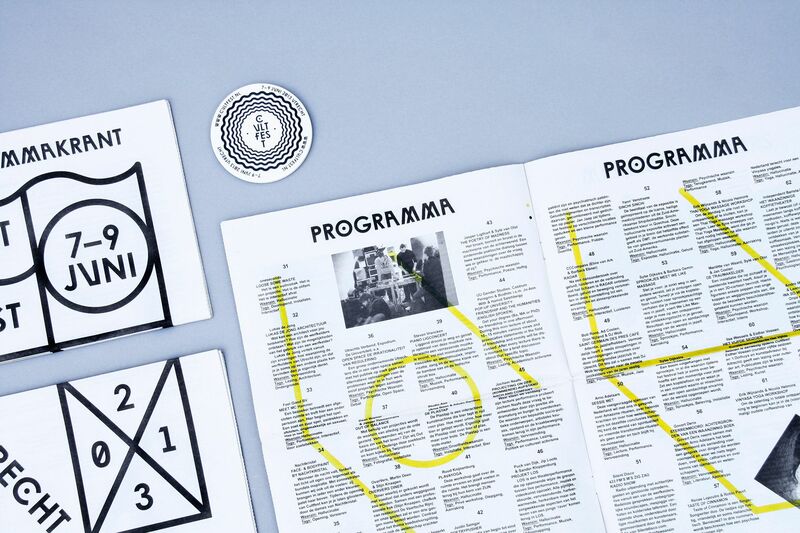 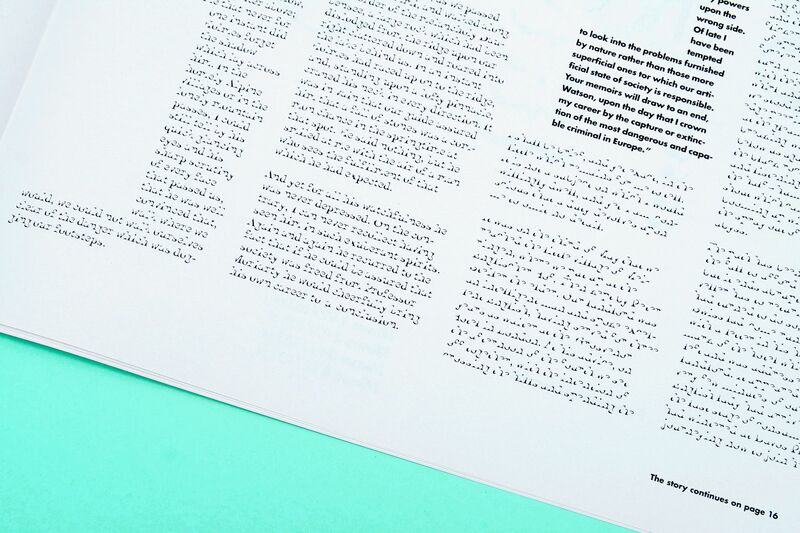 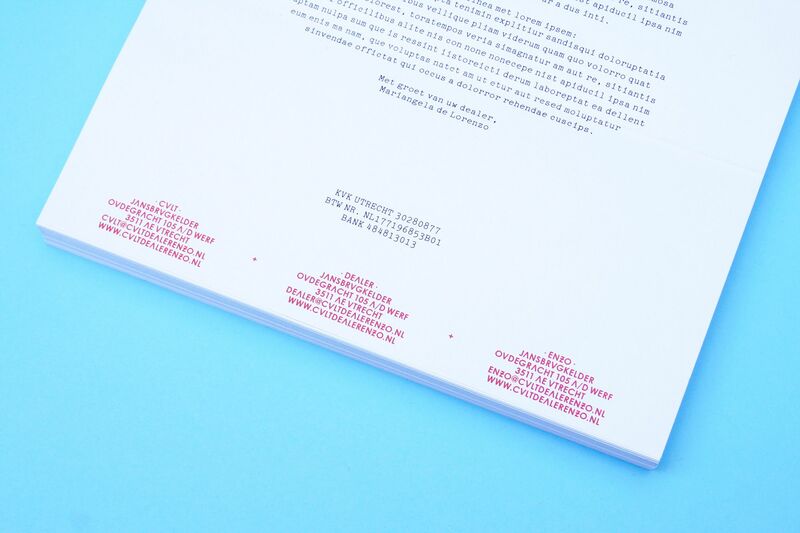 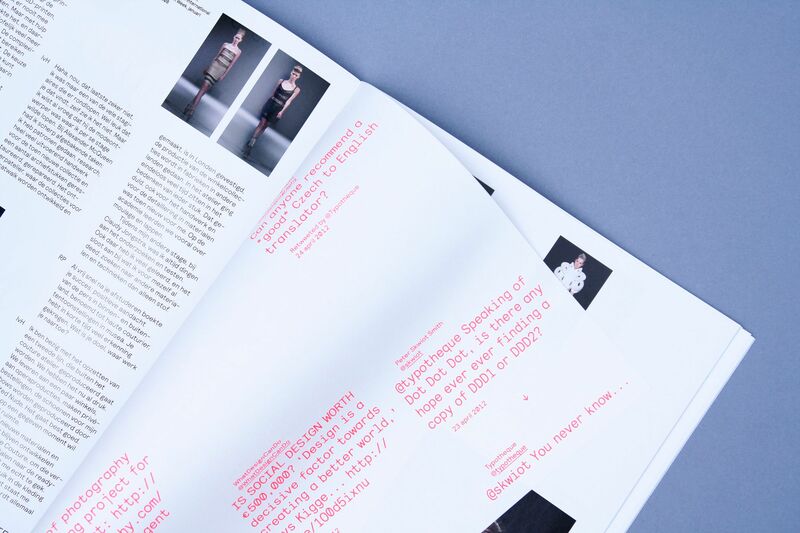 The publication is (mostly) set in the font 'Move', that was designed for this specific project. 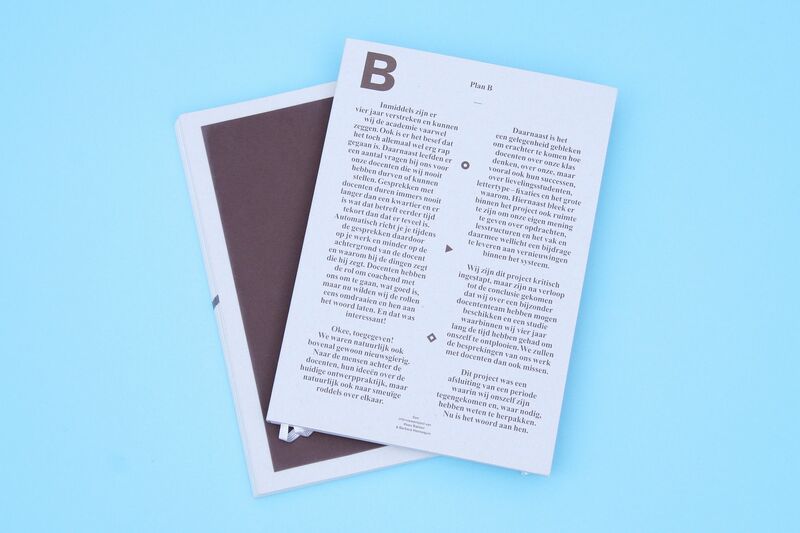 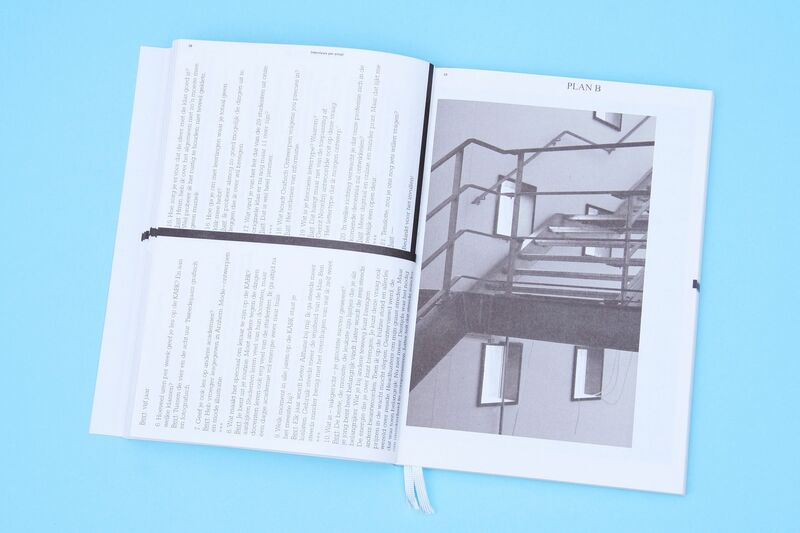 Plan B is a book featuring interviews with 28 teachers of the Graphic Design department of the Royal Academy of Arts (KABK) in The Hague. 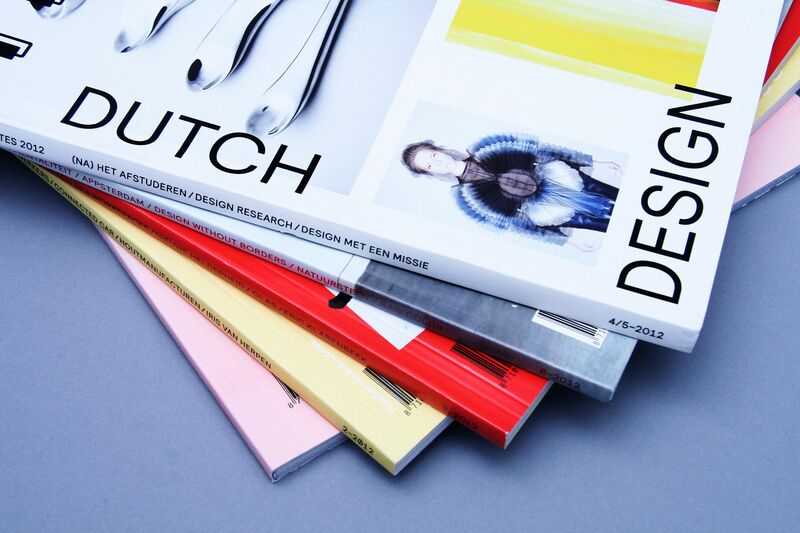 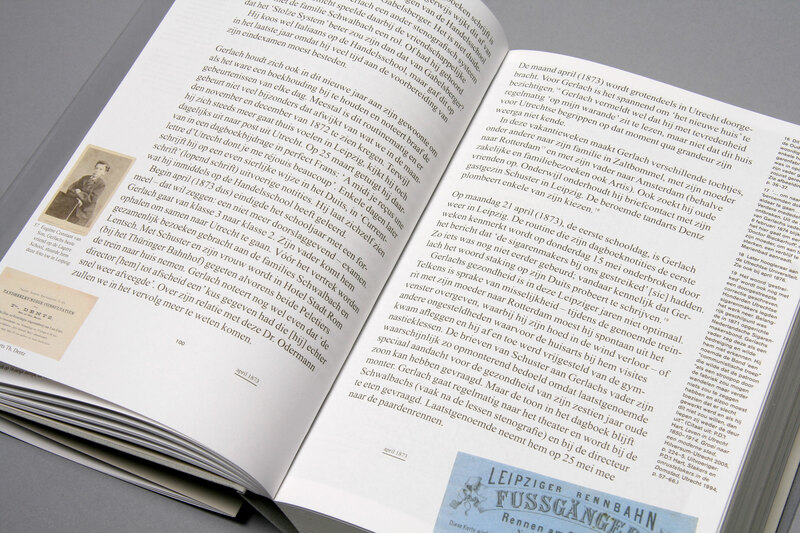 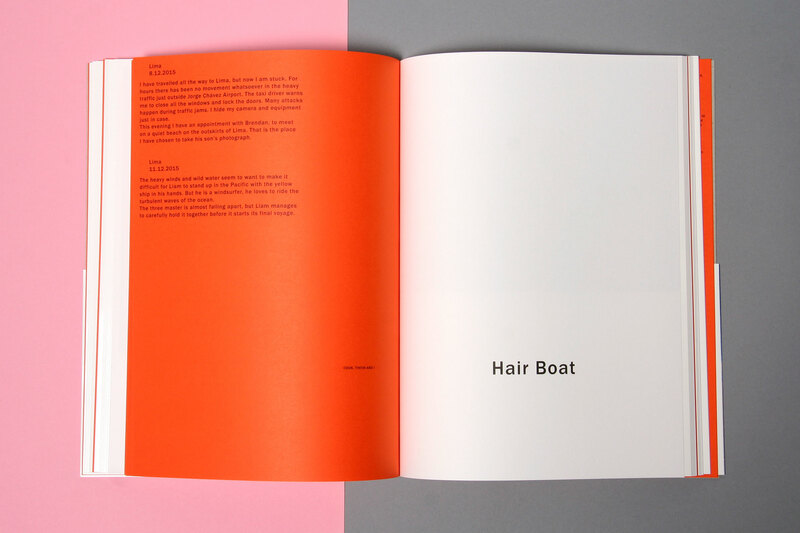 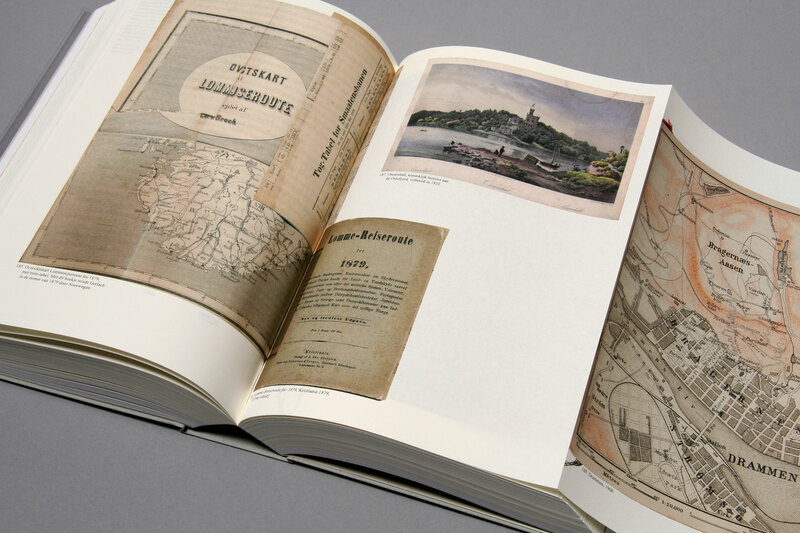 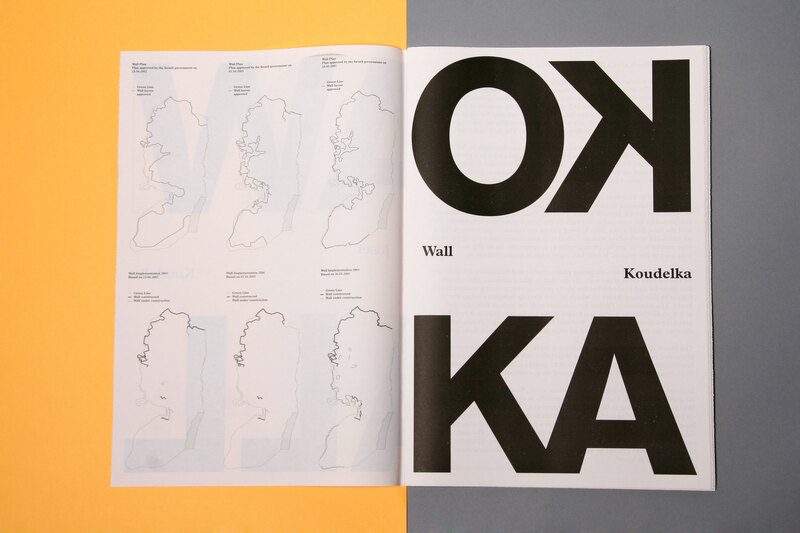 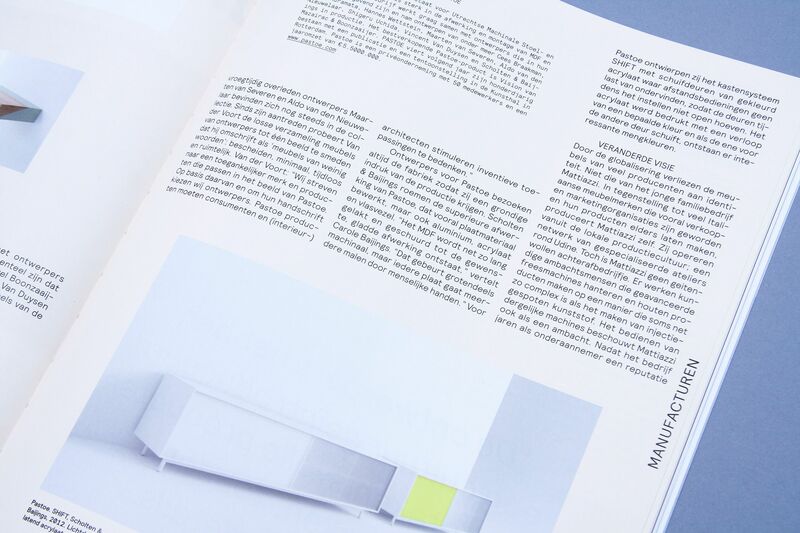 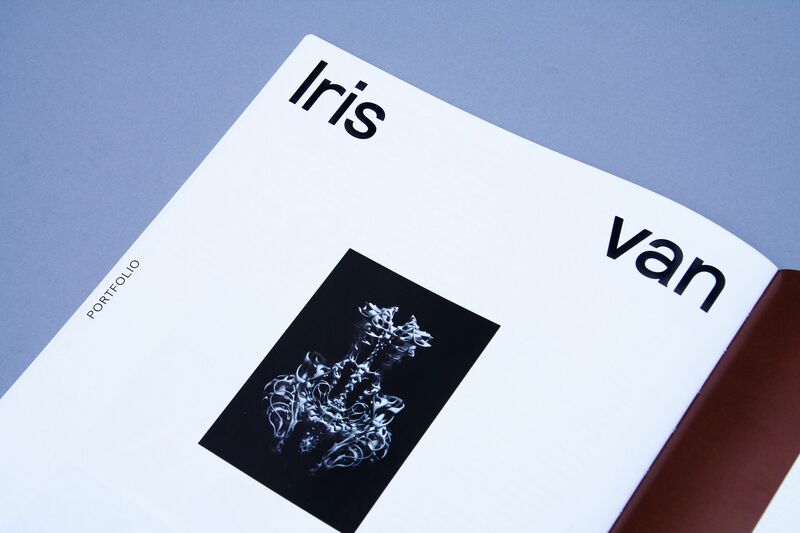 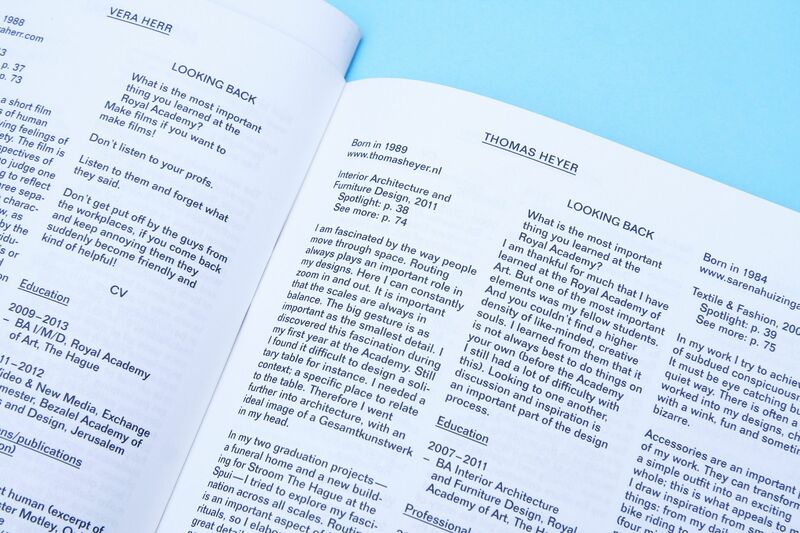 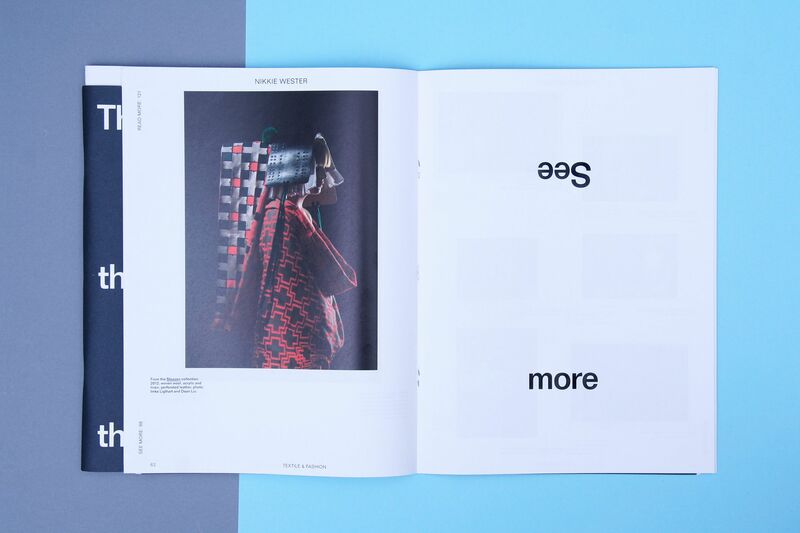 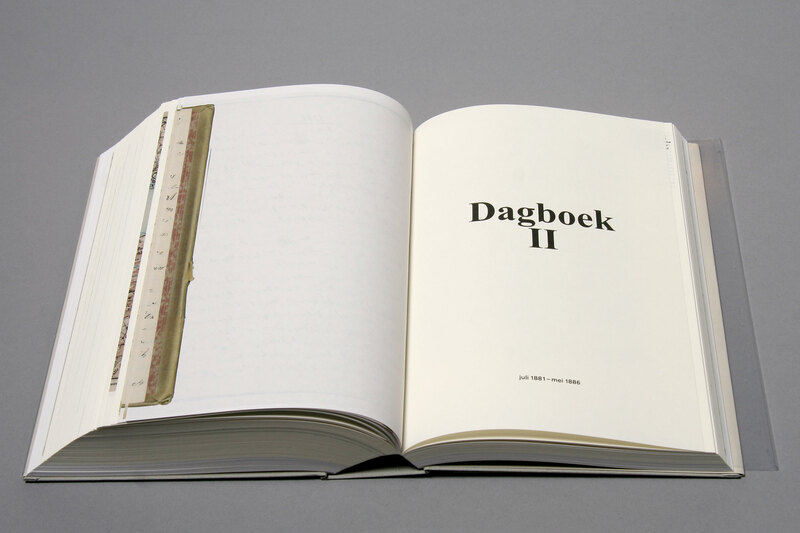 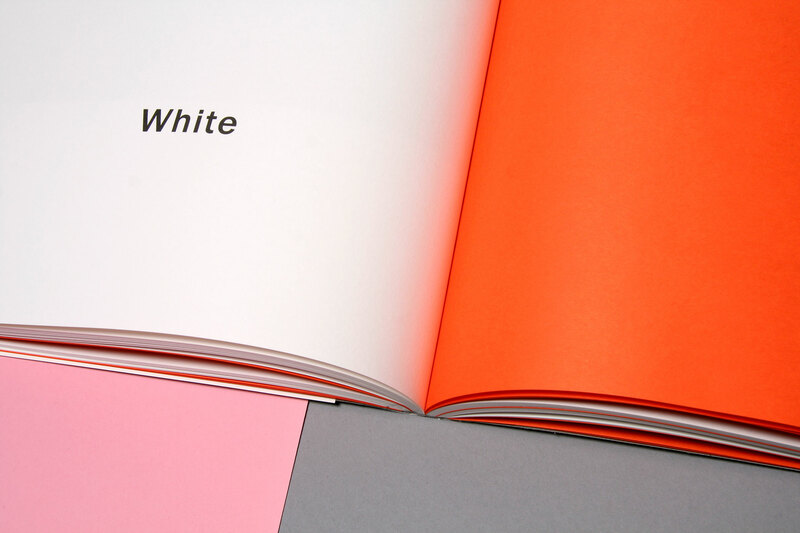 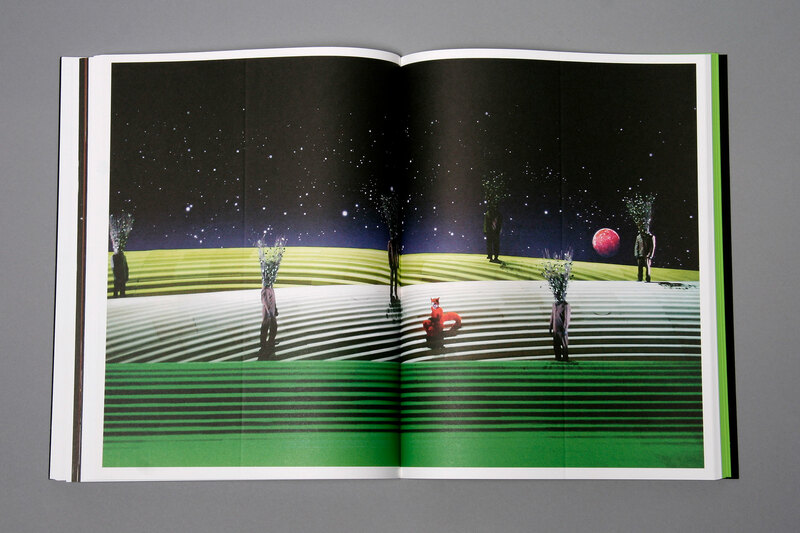 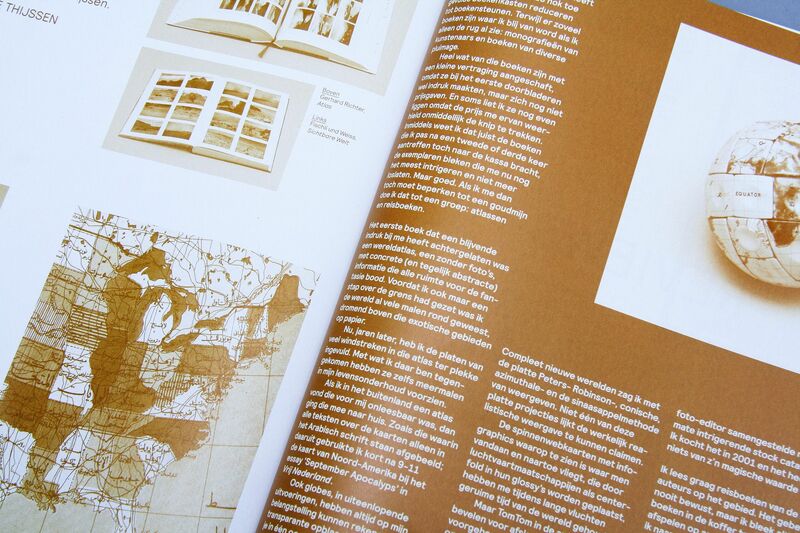 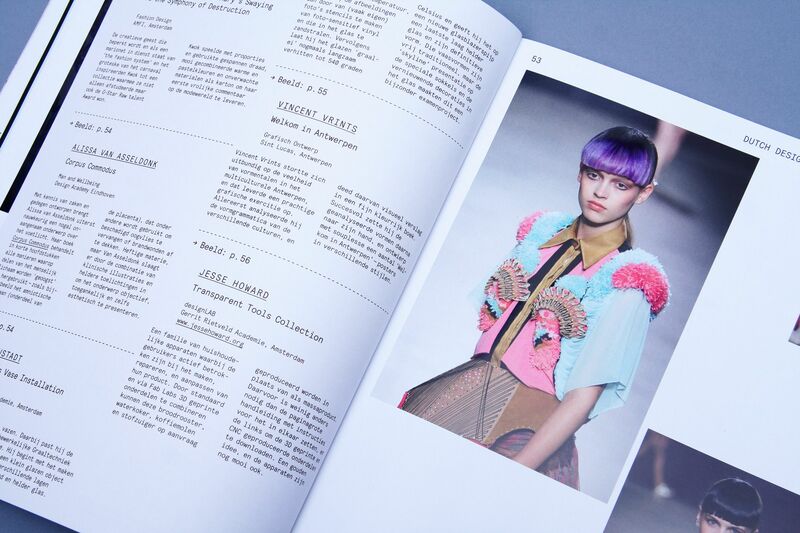 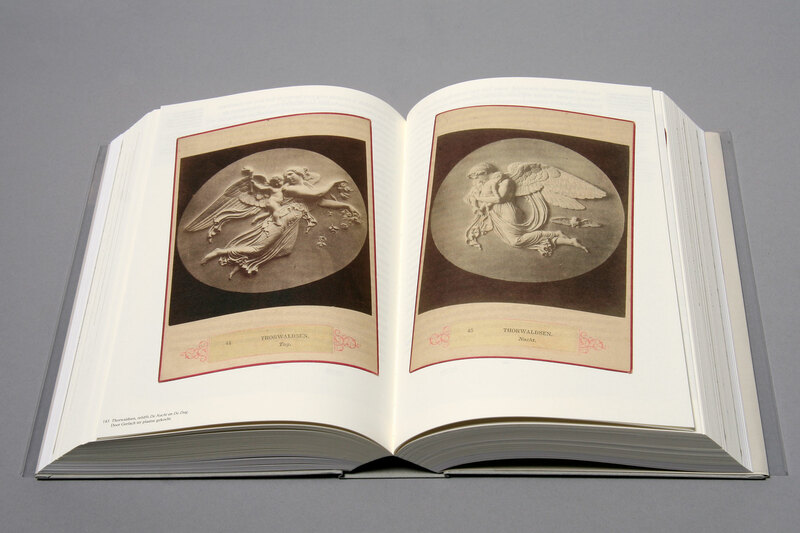 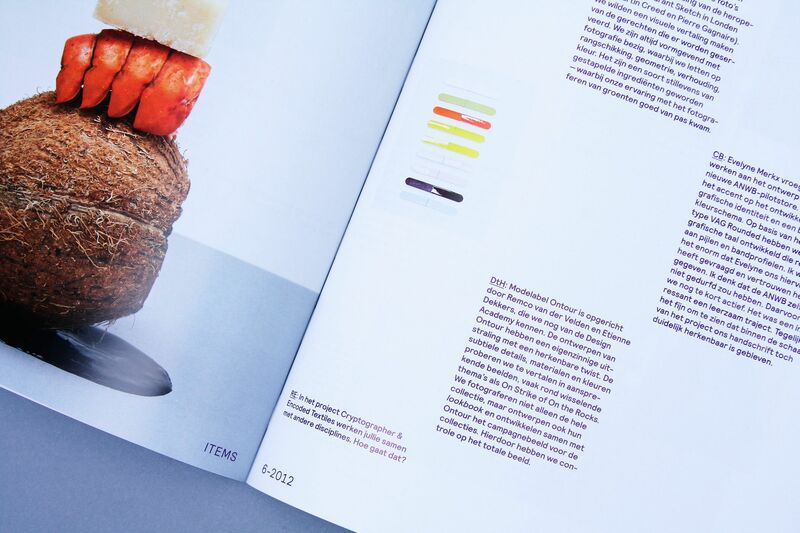 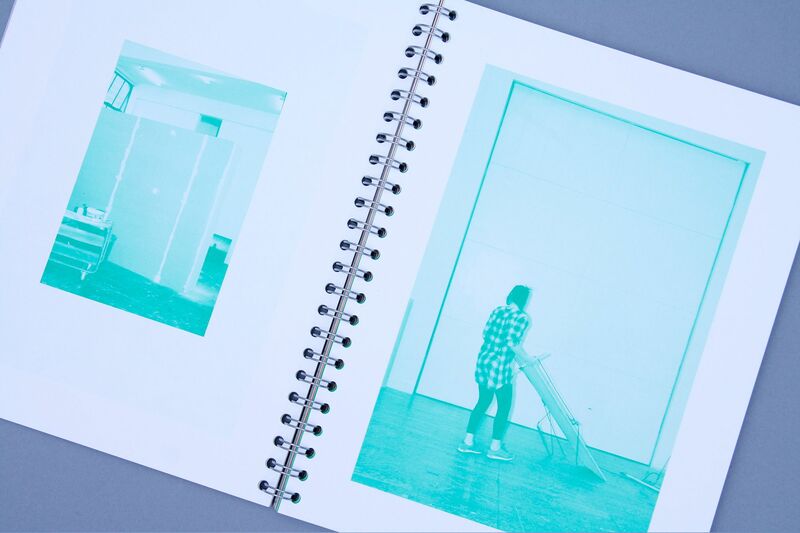 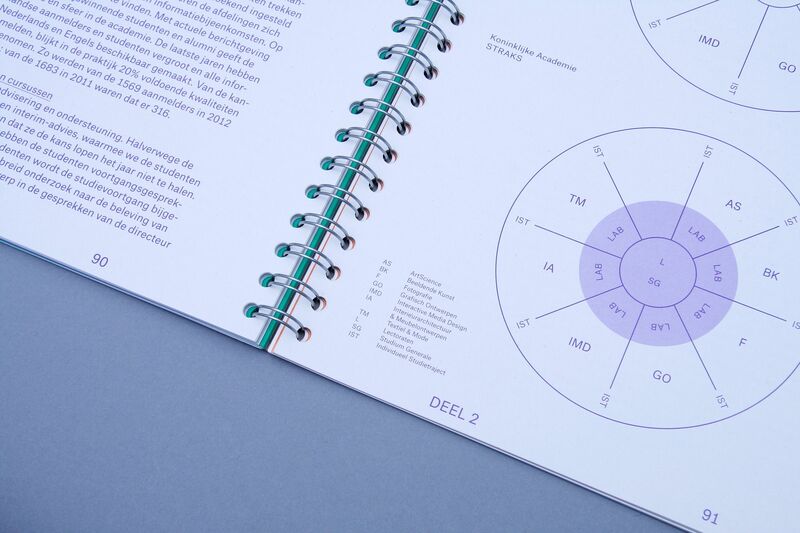 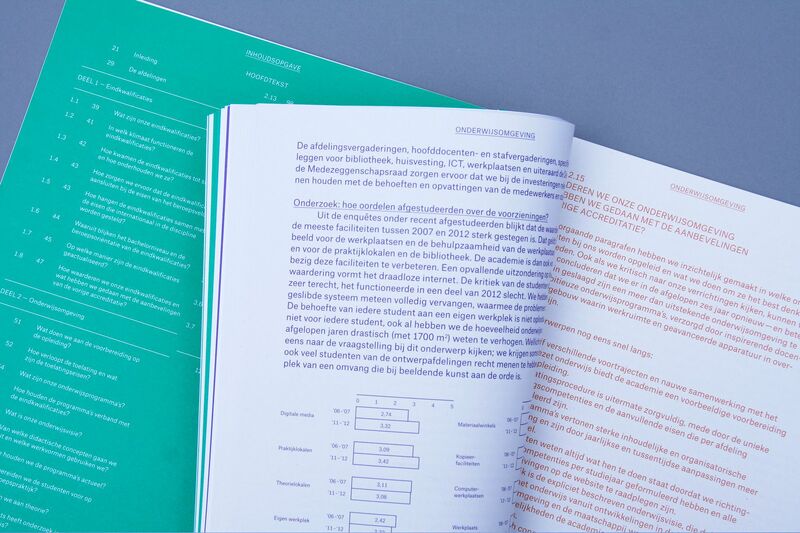 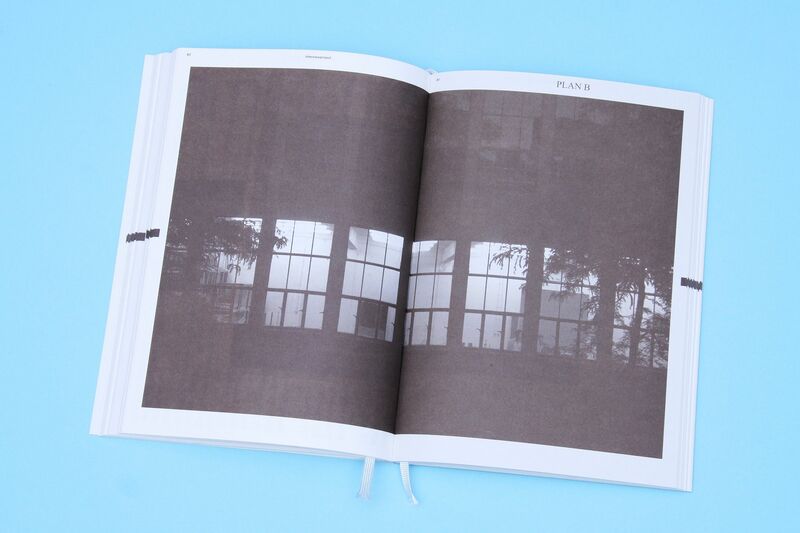 Together with graphic designer Kees Bakker, I initi­ated and designed the book. 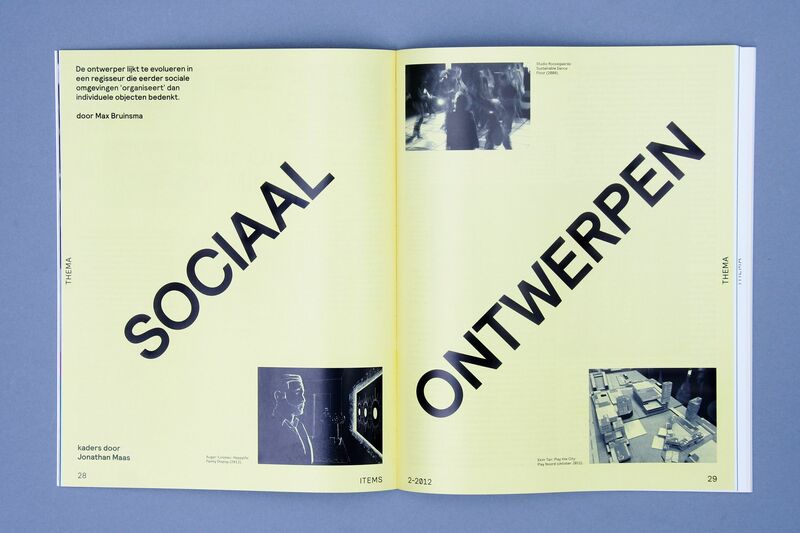 We inter­viewed the teachers who had taught us in the four years we spent at the KABK and asked them to talk about and expose their vision on graphic design of today, their own work, their successes and their setbacks, the influence of teaching on their own work, favourite students, other interests, ideals, etc. 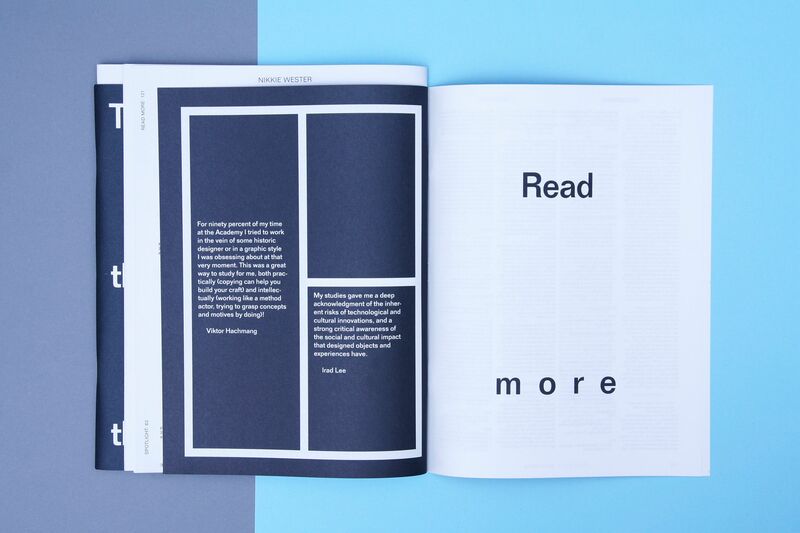 This resulted in a book designed and financed by ourselves. 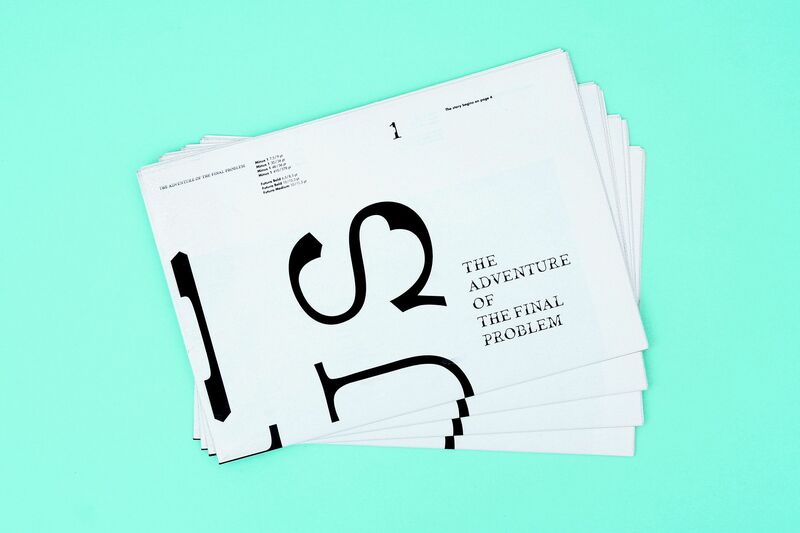 A type specimen of the Minus typeface. 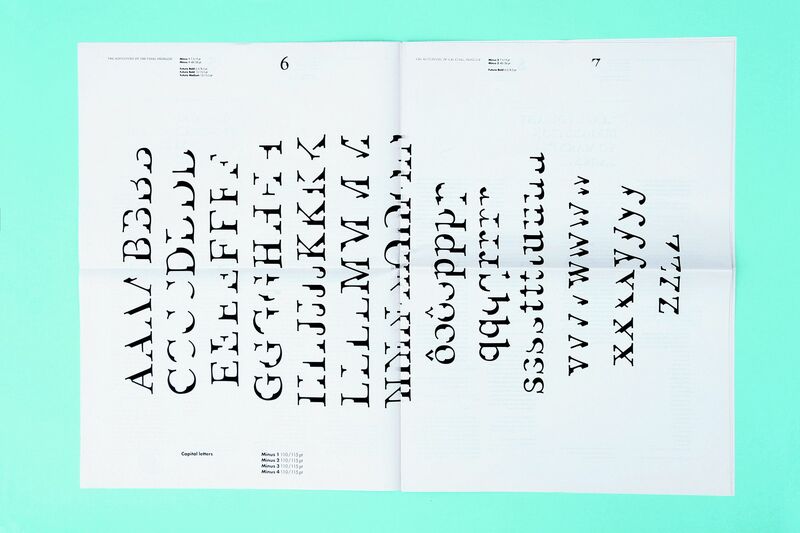 About the typeface: When people read text they don't see letters, but only content and information. 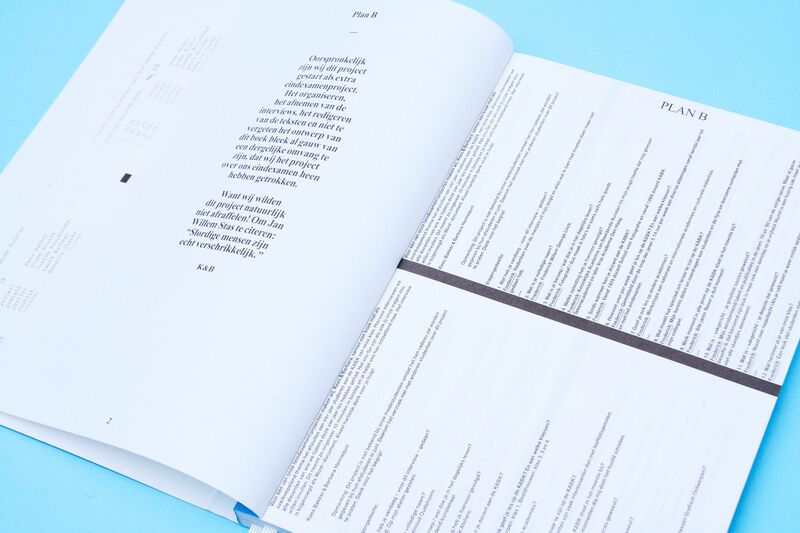 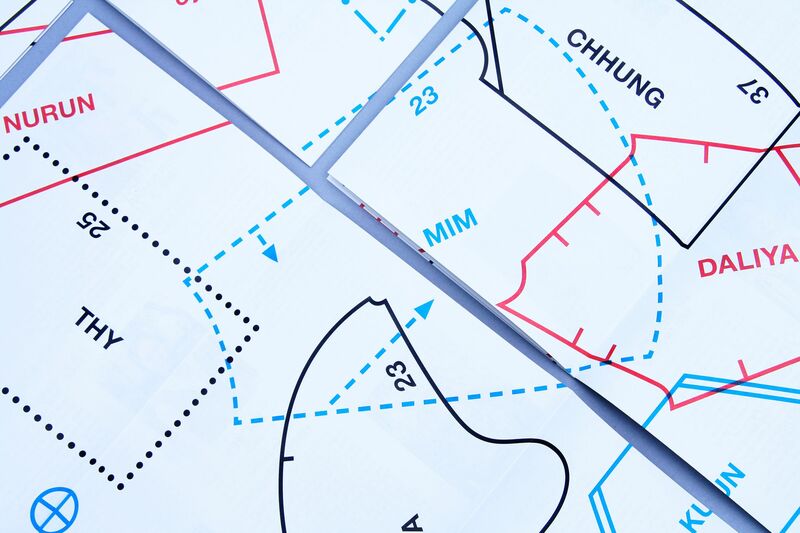 While reading your eyes move in automatic pilot mode, linking multiple fragments of infor­mation about letterforms together at an overwhelming pace. 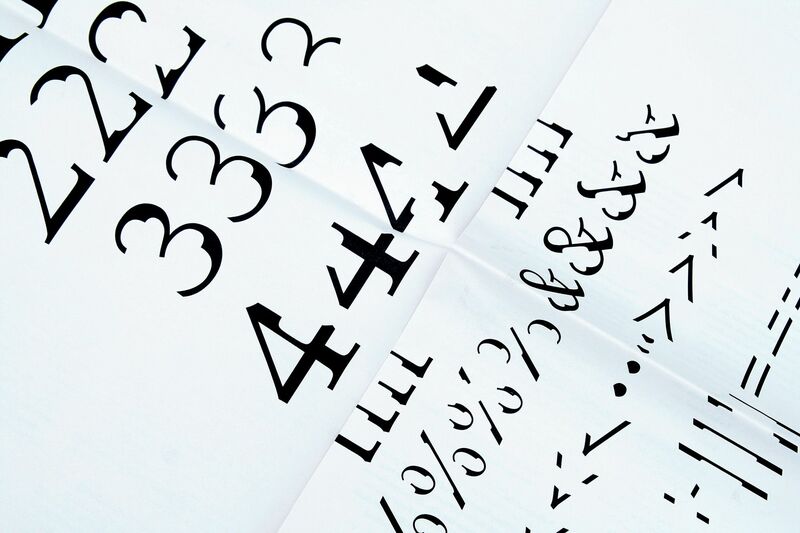 With this in mind the 4 weights of the Minus were designed: Minus 1, Minus 2, Minus 3 and Minus 4. 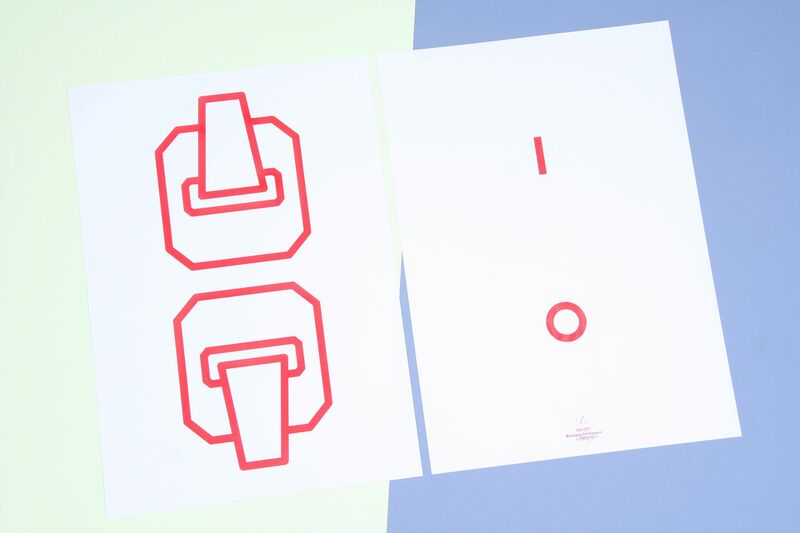 In three steps the letters are broken down to their most minimal recognisable and therefor functional form. 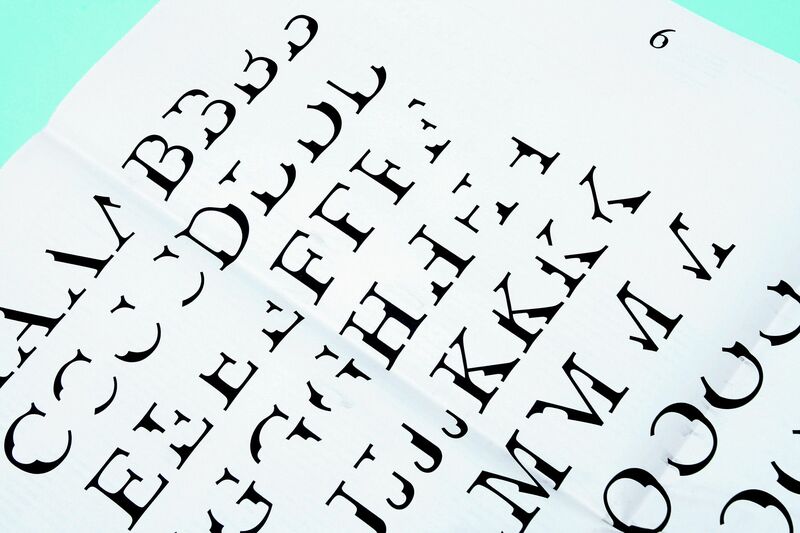 This is done by emphasizing their most charac­teristic and unique parts, yet retaining their basic shape. 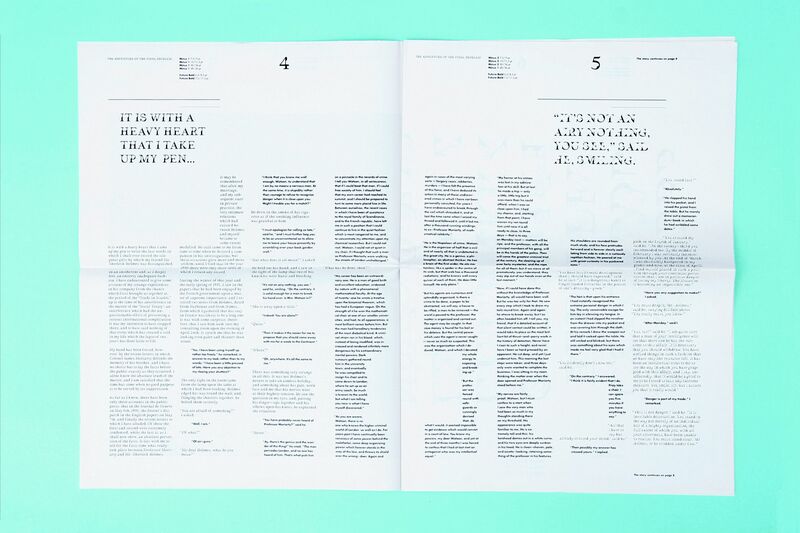 At what point do the fragments and parts of letters no longer suffice to be able to recognize a letter­form, or: when is a letter no longer legible and does it become pure form? 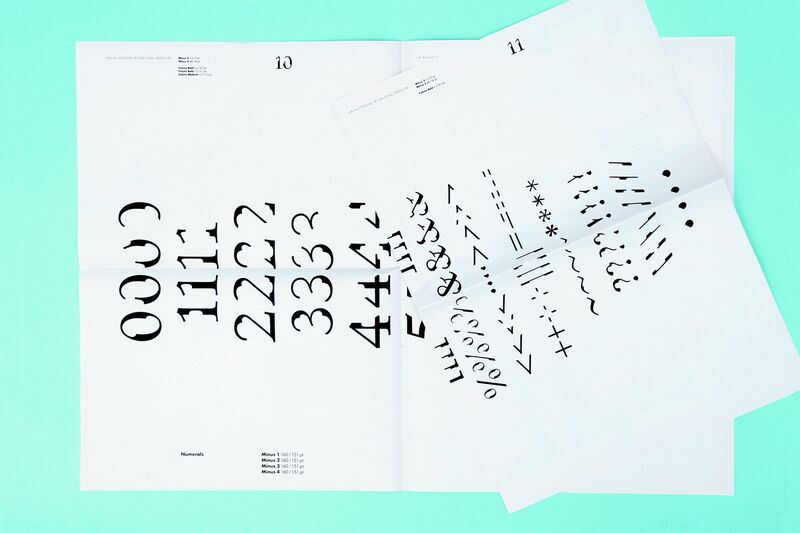 In the specimen the four weights are used consecutively from Minus 1 to Minus 4. 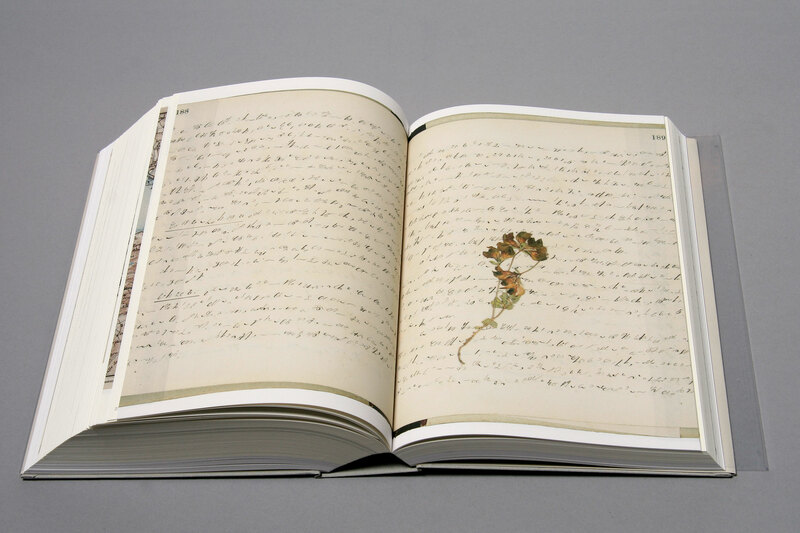 The challenge is to finish the story, and get to the denouement of the story, despite increasing difficulty in legibility. 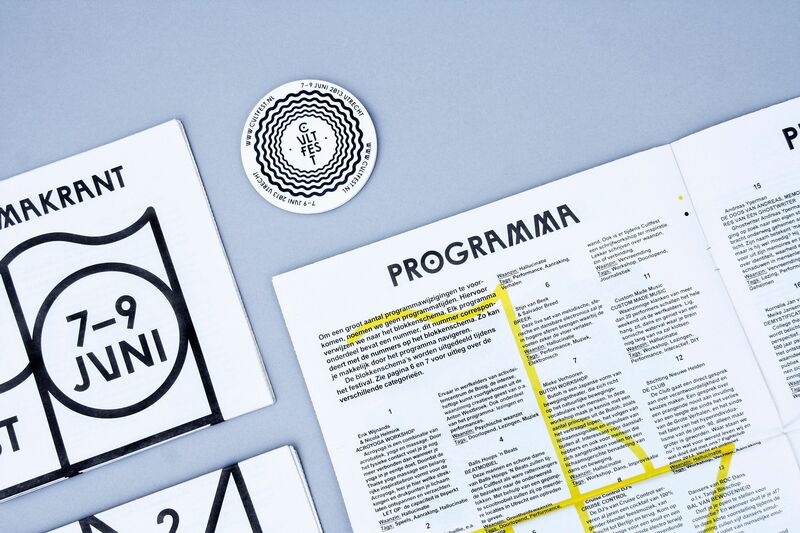 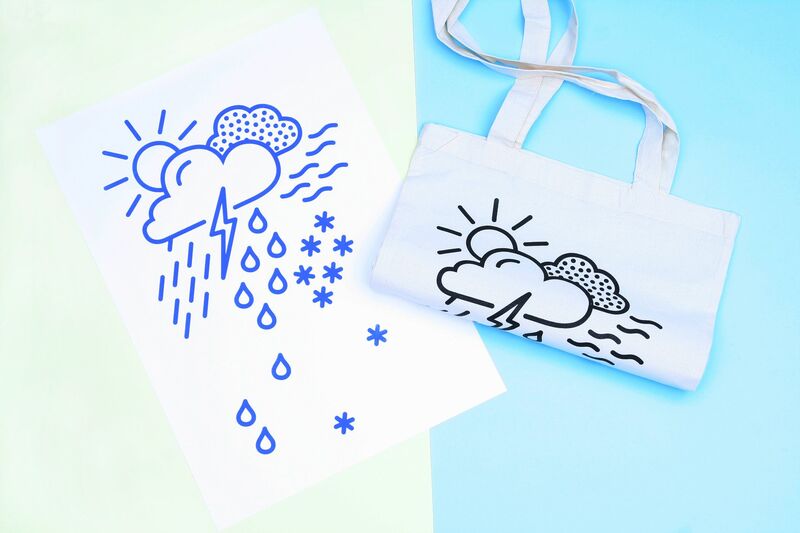 A mix of print work: a poster for the opening of project space Depot BG, a riso print for 'Fernweh' exhibition, ALL WEATHER silkscreen print & tote bag for 'International Style Station' exhibition, ON OFF silkscreen print for opening of 'Kapitaal' in Utrecht.